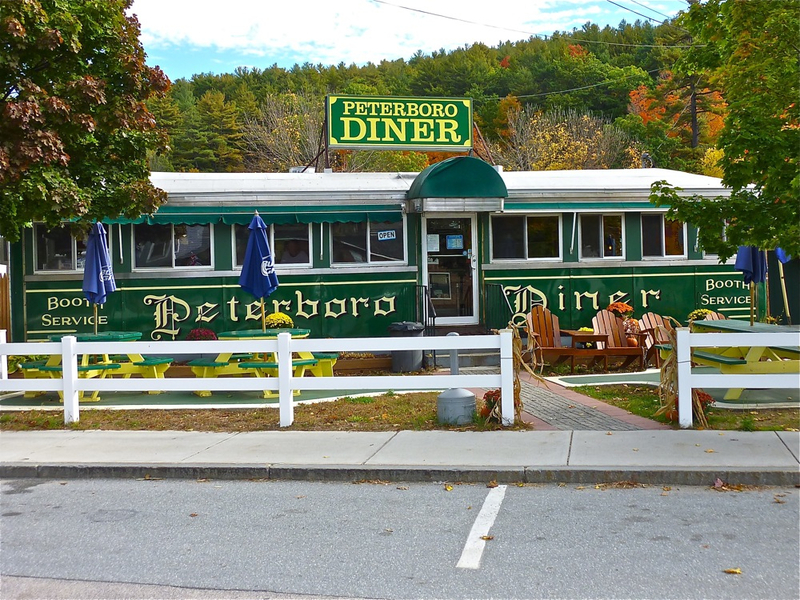 Peterboro Diner in Peterborough, N.H.
Story and photos, unless otherwise noted, by Eric Hurwitz. Article updated on 2/24/2019. Miss Wakefield Diner, Sanbornville, N.H. The neon moon eventually gave way to a muted stainless steel sky color and then bright sunshine where America the Beautiful woke up in all its spirited glory to start another day at a local diner that, given its 24/7 business hours, never stopped working. At the Patriots Diner in Woonsocket, Rhode Island -- where bright lights and clanging of plates from inside pleasantly contrasted with the morning’s stillness -- one could witness scenes of small town America collectively beginning its morning at this bustling diner. With local conversations flowing as freely as the coffee and sometimes sizzling as much as the bacon, it was apparent at the Patriots Diner that a retro sense of community and a connection to our neighbors never really went away in a world often perceived today as too fast-paced, conflicted and impersonal. Chefs and cooks showcased their occupational skill and skillet set through offering huge portions of comfort food classics, while no- nonsense but friendly waitresses served as unofficial family to customers with their welcoming ways. Locals -- many with townie and patriotic tendencies -- interacted through hallowed face-to-face spoken words instead of through hollowed technological devices. Truck drivers laid their weary bodies down at the counter -- like another old school country song in the making -- after, presumably, punishing long days and nights of life on the road. White collar America -- some as business travelers walking briskly over from the adjacent hotel -- took that well-deserved break from another anticipated day in the rat race to lighten the day with some home-cooked food. Landscapers and construction workers with clean hands, for now, were hungry, immediately decisive on what to order, and needing to get to work soon. They wasted no time ordering food while showing a close camaraderie as if they were brothers. You see, there’s really nothing like eating at a good old-fashioned diner when traveling the small towns, back roads and big cities in New England. The experience, quite simply, brings a wonderful slice of American tradition to the senses -- and taste buds -- that can only be fully realized by frequenting these local treasures. 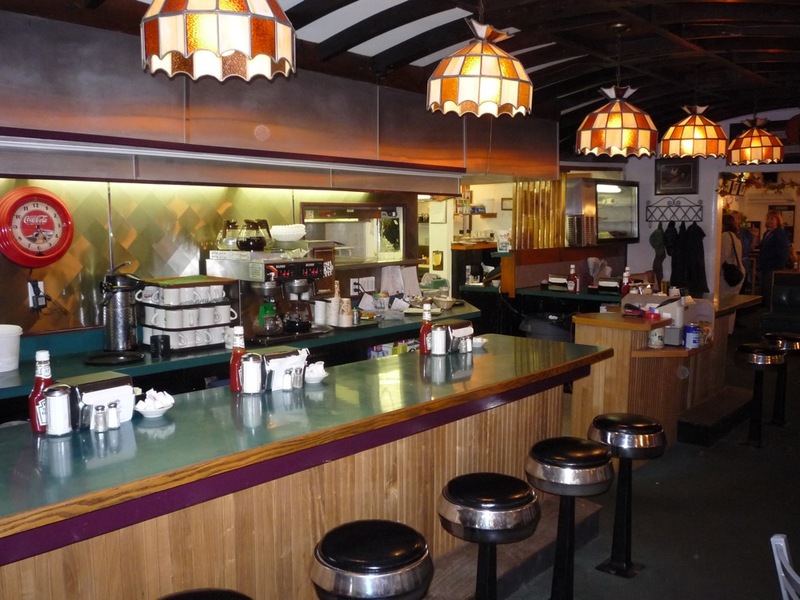 Diners are best known for their history, tradition, an extensive menu selection, large portions of comfort foods at fair prices, quick service, oak and mahogany booths, counter with stools, jukeboxes, a stainless steel exterior, and plenty of neon. Not all diners possess all of those elements, but the ones included in this book make the grade by carrying on the wonderful, traditional no-frills diner spirit and hearty meals that made these places great in the first place. Grilled reuben from the Blue Plate Diner in Middletown, R.I.
Additionally, diners often seem more authentically populist in nature than most politicians, not caring about your financial, political or economic beliefs -- the owners and staff are almost always just real people wanting you to be part of their “family.” While the proverbial, salt-of-the-earth waitress asking “What do you want, hon?” is often associated with diners, the welcoming nature takes on, obviously, many other forms of sincere words beyond that famous phrase. Diners, as local landmarks and unofficial community meeting places, proudly stand as the ultimate unpretentious places to have the next best thing to a homemade meal -- often better, if a talented chef works on the premises. This is an important distinction that sets diners apart: you don’t come here for the fancy decor, so the food better be good! Hollywood, talented artists, and general pop culture have also often portrayed the classic American diner in movies like Diner (1982) and Grease (1978), television shows like Happy Days (1974-1984) and Alice (1976-1985) and the restaurant hangout in Seinfeld (1989-1998). Norman Rockwell’s 1958 painting The Runaway, features a young boy and a caring highway patrolman, at the counter of a diner in the Berkshires in Western Massachusetts (more on that later). All are worth a look, no doubt, but the best way to get the feel of a diner in going to one and soaking in the grand, but informal experience. New England has no shortage of great diners, as you will discover in this book. All walks of life gather at Joe's Diner in Lee, Mass. Sometimes a part of the work day when traveling New England for my travel business, VisitingNewEngland.com, I often sit alone at a diner reading the local newspaper. That isolationist presence -- contrasting with the community feel of a diner -- changes in a hurry, though. Often my attention will eventually shift from reading the bad news in the paper to soaking in the diners’ happy, “good news” atmosphere where I revel in hearing, and sometimes take part in the salt-of-the-earth, real conversations amongst almost always hard-working people and content retirees. Although each diner is distinct in its history, personality and food offerings, the common theme of comfort, friendliness and proud tradition happily takes me away from a frantic, societal hamster wheel world of cell phones, laptops, patented city and suburban road rage, and man-made noise (construction, trucks, mowers, leaf blowers, cable news “I’m right, you’re wrong” discussions -- you get the picture). Diners might be considered by some a thing of the past, but they are also a dining-out hope of the future as locally-owned and operated small businesses offer satisfying meals, prices kind to those on a budget and a priceless, down-to-earth style of service that sure feels different from the generic, chain restaurant presentations. People also seem to be returning to the basics with their lifestyles by rejecting the superficial, faceless, expensive and shallow, and instead embracing things that really matter. Illuminated Red Wing Diner sign at twilight in Walpole, Massachusetts. Diners really do matter to locals, travelers and any walk of life as a place to connect with our great country -- you’ll see the most wonderful cross section of customers at these dining destinations. 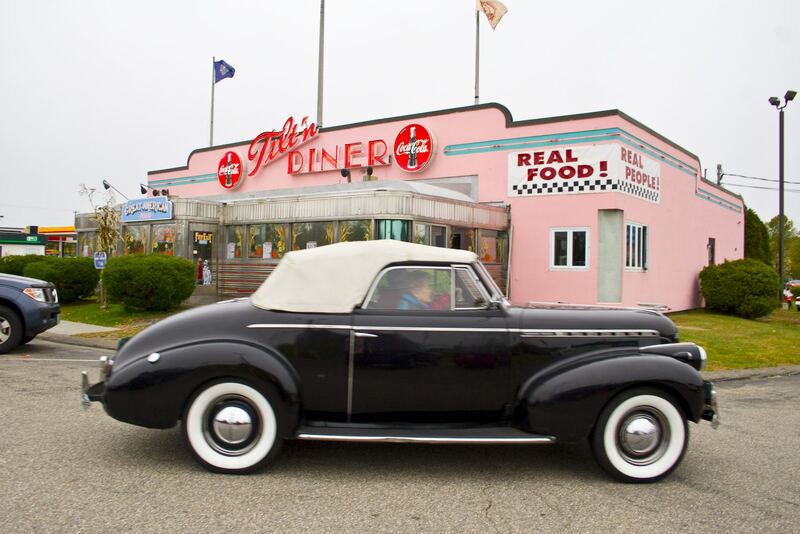 New Englanders and outsiders, to this very day, form lines out the door at places like the Modern Diner in Pawtucket, Rhode Island, 50s Diner in Dedham, Massachusetts, and the Maine Diner in Wells, Maine. Its great, too, seeing so many college students frequenting diners such as Kelly’s Diner near Tufts University in Medford and Somerville, Massachusetts, Wilson’s Diner in Waltham, Massachusetts, close to Bentley University, and O’Rourke’s Diner in Middletown, Connecticut, near Wesleyan University. This is a good sign for the future of small business in America! It’s always a wonderful scene seeing America go out to breakfast and supporting a small business right at the start of the day. I’d imagine it gives diner owners hope about their modest, humble businesses with customers providing a second ray of sunshine to complement the rising of the early morning sun. Many diner purists will only go to the traditional, authentic dining car diners that have roots going back to the early 20th century, although the blueprint for a diner was a horse-drawn wagon created in Providence, Rhode Island, by Walter Scott in 1872. Charles Palmer received the first patent (1891) for the diner building "fancy night cafes" and "night lunch wagons" in the Worcester, Massachusetts, area until 1901. In 1906, Philip Duprey and Irving Stoddard started the Worcester Lunch Car Company, shopping railroad-style dining cars all over the Eastern Seaboard. These are the type of diners that historians deem as “classic” and “authentic.” So, the diner concept actually all started here in New England! While a historic diner that serves great food is always the preferred option, I am also personally open-minded to diners created in the modern age that properly pay homage and respect to old-time diners by employing all the necessary criteria -- that is, with enough neon, chrome, down-to-earth service and ample food portions to make the experience worthwhile. If the mission is sincere and built out of pride of ownership, then it's fine by me. A few relatively modern New England diners that mimic the look of a retro diner are Dave's Diner in Middleboro, Massachusetts (built as a dining car in Florida in the 1990s), and the Vernon Diner in Vernon, Connecticut (a former Howard Johnson’s). They both turn out great food and a quintessential American diner experience and, by the way, are superior to those fast food chains that, starting in the 1950s, tried to outdo the local diners with their ultra convenience and mammoth advertising budgets. Turns out that the diners often got it right in the first place, turning out a product far superior to those fast food destinations. There's no replacing authenticity, including the comfort foods. "If I want fabricated food, I go to McDonald's and if I want it straight from the heart, I come here," said Jim MacNeill, general manager at the Maine Diner in Wells, Maine. "Great chefs create food with a vision instead of creating food to make money. We're geared not to make money, but to make great food." From long-time positive local reputations to national media coverage, some New England diners have become deservedly famous. Let’s not forget, however, about the “hidden gem” diners, as many of these locally well-known, but unfamiliar to those outside the area eateries are often just as good as the diners that get seem to get all the press. In this book, I will cover both the famous and not-so-famous -- sharing with you some of the popular diners’ awards, as well as explaining why you should try the off-the-beaten-path diners when in the neighborhood. The result of not finishing a meal at Carl's Oxford Diner. Some friends have asked me how I decided the criteria for “the best of list” in this book. Well, I went by personal feelings and observations to determine which places felt like the best. Some of the much-hyped diners weren't all that good and some of the unknowns, fantastic. Initially, I was actually a little uncomfortable using the word "best" as it is so subjective. I tried to tell a story of each diner as authentically and honestly as I possible. I felt that any book with a "best" theme could only be effective if only written straight from the heart. Often, you know right away that a diner is going to be a special place from one’s own personal feelings where, at the moment, the heart and mind say, “This place is the best!” To draw an analogy, it’s kind of like in the TV show, The Voice (the popular American reality television singing competition on NBC) when a judge turns his or her chair upon hearing the first few words sung by a contestant. Some have it, some don’t. A few of these places I hadn’t been to in quite some time -- long before I ever thought about writing such a book -- but the wonderful first impression and overall experience stuck in the mind like a best friend. And that’s ultimately what a diner should be, like a best friend. Some readers might be surprised if a beloved local diner didn’t make the final cut here. This could mean three things: either I didn’t care too much for the diner, more visits are needed to better ascertain the quality, or I haven’t been yet. This is just the beginning of the diner journey and I can hardly wait to share more with you in updated versions of this book. Without further ado, let’s start the New England diner journey right now! 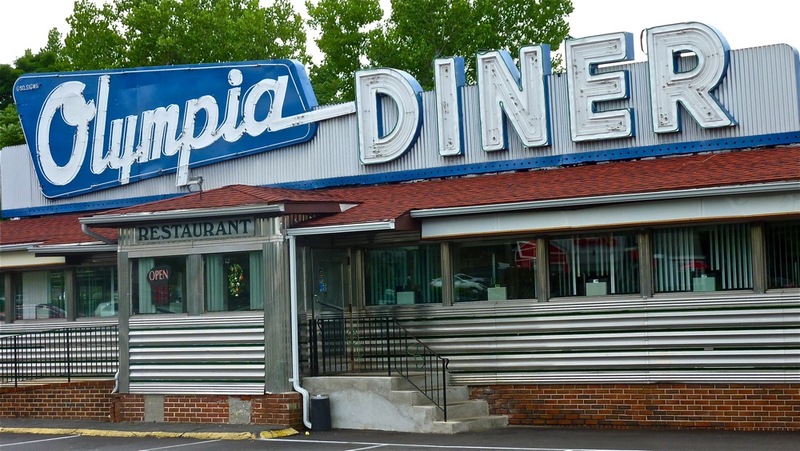 The Olympia Diner is a landmark in Newington, Conn. There's no mistaking the Olympia Diner as an authentic diner with its stainless steel look and a huge diner neon sign perching above the structure. There's also no mistaking the great diner food at this 60-plus-year-old Hartford area landmark -- a favorite amongst truck drivers and, come to think of it, all walks of life. The Olympia hits on all diner cylinders with heaping portions of omelets, pancakes, French toast, corned beef and pastrami platters, club sandwiches, ham steaks, Yankee pot roast, fried chicken, fried and baked seafood, baked meatloaf, roast stuffed turkey, breaded pork chops and spaghetti dinners, as well as Greek influences like gyros and moussaka. Add some homemade pie for dessert, and you have a menu that reads like a greatest hits collection of real diner food. On the last visit here, I had the meatloaf and it was fantastic -- flavorful, and not too salty or burned like you'd sometimes find at other places. The original diner clearly has the most ambiance, but often it can get crowded. A 1986 dining room addition that doubled the size of the diner took care of that problem, although the newer room can also get crowded -- a real testimony to the greatness of this place. Steve Gavrillis, who has owned the diner with brother Tasos since 2001 (their father bought the diner in 1974) believes that the Olympia stands out for several reasons. Interesting Olympia Diner tidbit: According to the Olympia Diner web site, big screen movie scenes have been filmed at the Olympia including Jacknife (1989) starring Robert DeNiro; Promises in the Dark (1979) starring Marcia Mason; and Once More With Feeling starring Drea de Matteo. Olympia Diner is located at 3413 Berlin Turnpike, Newington. Tel. (860) 666-9948. Web site: http://www.olympiadiner.net. 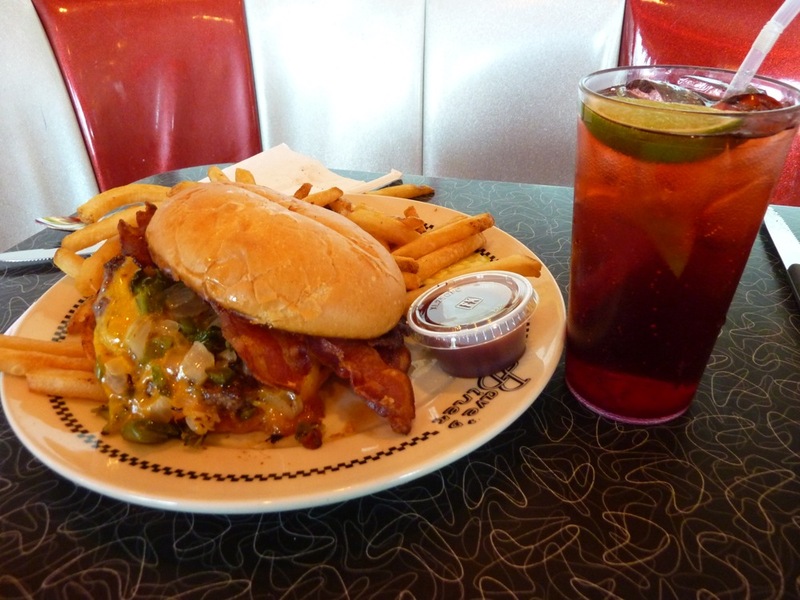 Tiny O'Rourke's Diner serves up big-time comfort foods. O'Rourke's has been in business since 1941, focusing on American classics, and, as a twist on the traditional diner, by adding some Irish influences (OK, it makes sense... O'Rourke's...Irish cuisine...). Starting out as "the wooden Dunn's Diner," and then moving into a Mountain View diner (a New Jersey company built these types of pre-fabricated diners starting in 1938), O'Rourke’s, sadly, was victimized by a fire in 2006 but, fortunately, the community rallied to help bring this beloved local landmark back by 2007. O'Rourke's indeed follows the diner basics serving up hearty breakfasts, sandwiches, burgers (the steamed cheeseburger is renowned), and homemade soups and desserts, but the Irish selections lend true diner uniqueness -- like Irish soda bread French toast and the Dubliner omelet with corned beef hash and Irish cheddar. The Dagwood sandwich is tremendous: house roasted turkey, baked ham and cheddar cheese! O'Rourke's gets a huge local crowd, as well as students from nearby Wesleyan University -- a good sign that this diner goes beyond just pleasing a townie crowd. 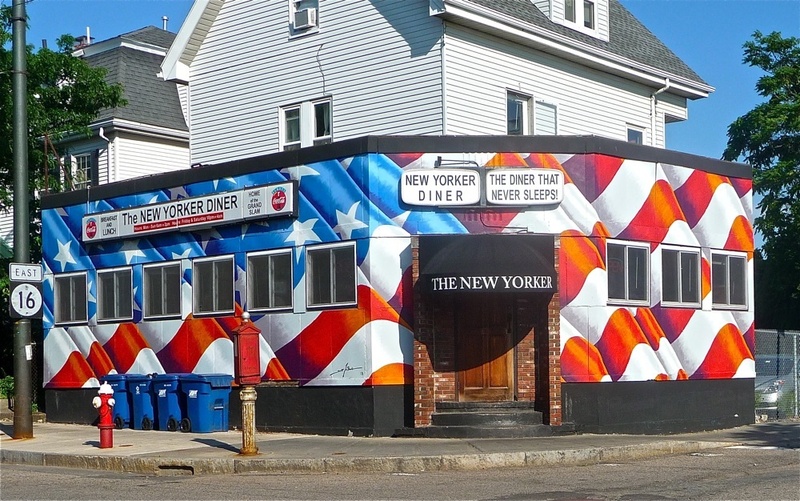 Interesting O’Rourke’s Diner tidbit: Celebrities that have eaten at O’Rourke’s include Clint Eastwood, the late Sen. Ted Kennedy (D-MA), and New England Patriots coach Bill Belichick, according to an article in the Wesleyan Argus (http://wesleyanargus.com/2008/02/08/omelettes-ahoy-o%E2%80%99rourke%E2%80%99s-diner-set-to-reopen-monday/). O’Rourke’s Diner is located at 728 Main St., Middletown. Tel. (860) 346-6101. Web site: http://www.orourkesmiddletown.com/. A more modern diner: the Vernon Diner in Vernon, Conn. The Vernon Diner was, in a previous life, a Howard Johnson's restaurant. The Diner seats 300 people, and at times, looks more like a restaurant like a diner. This scenario would potentially impede the authenticity of a real diner, but there's enough chrome, neon, stool and counter space, booths and classic diner food, as well as 25 made-from-scratch and on-the-premises cakes at the Vernon Diner to make it all worthwhile. The Vernon Diner is clean, efficient, affordable and with a menu that pays attention to the necessary tenets of a diner menu -- French toast, omelets, eggs benedict, pancakes, waffles, burgers, grilled reubens, homemade soups, club sandwiches, and meatloaf, roast turkey and sirloin steak dinners, to name a few. What I like best about the Vernon Diner, however, is that it's a Greek-influenced diner, and that means some excellent Greek-American specialties like moussaka, chicken souvlaki, gyros, spinach pie, and Greek salads (not the generic “House of Pizza” kind). 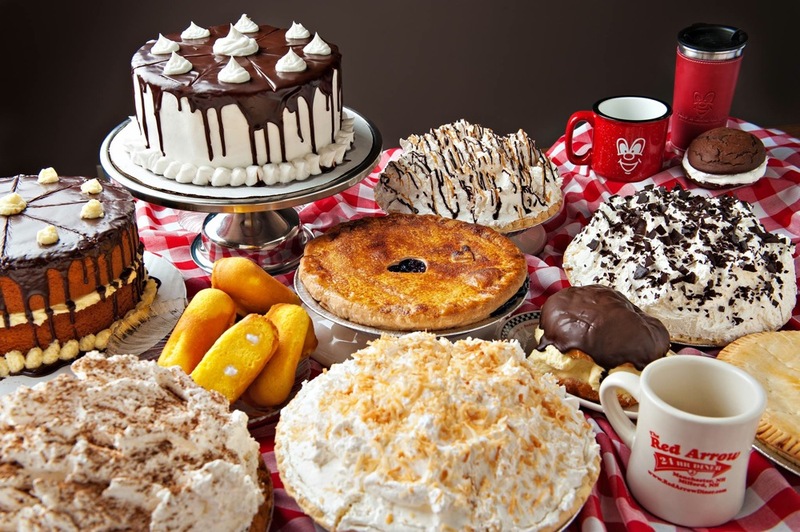 What's more, the Vernon Diner serves excellent baked, fried and broiled seafood plates, paninis, prime rib, kebobs, pasta dishes and desserts, in addition to cakes, like puddings, pies, ice cream sundaes and various pastries (eclairs, brownies, turnovers). 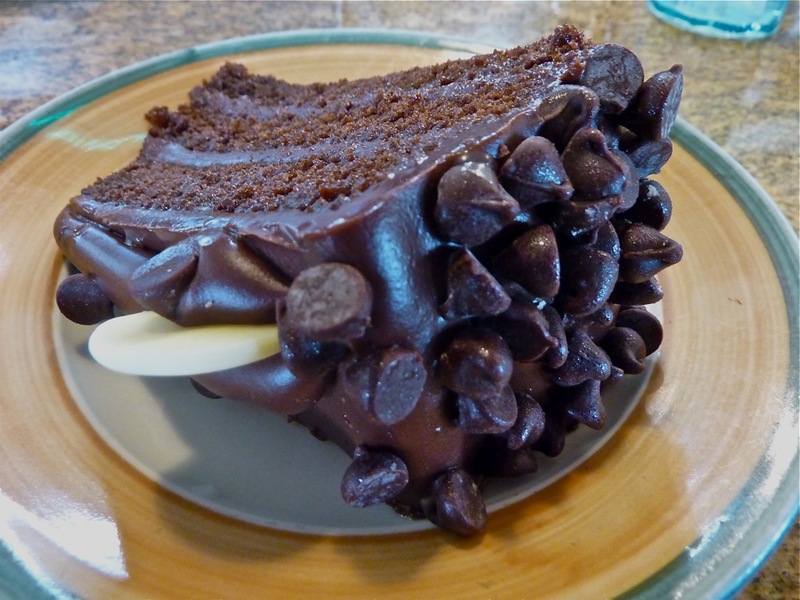 Homemade chocolate cake from the Vernon Diner. Those sweets sweeten the experience perhaps unlike any other diner we’ve been to in New England. The dessert display case near the entrance and the mouthwatering selections behind the counter -- along with those huge chocolate chip cookies on the counter -- are simply sights to behold. The Vernon Diner stands up well to virtually all great diners listed in this post and it's certainly a lot better than the Howard Johnson's that stood here before. The location is ideal for highway travelers, located just off Route 84 not too far from Hartford. Open 24 hours a day with frequent waiting lines during breakfast, lunch and dinner times, the Vernon Diner proves that a diner doesn't have to be ancient and tiny to be a tremendous diner! 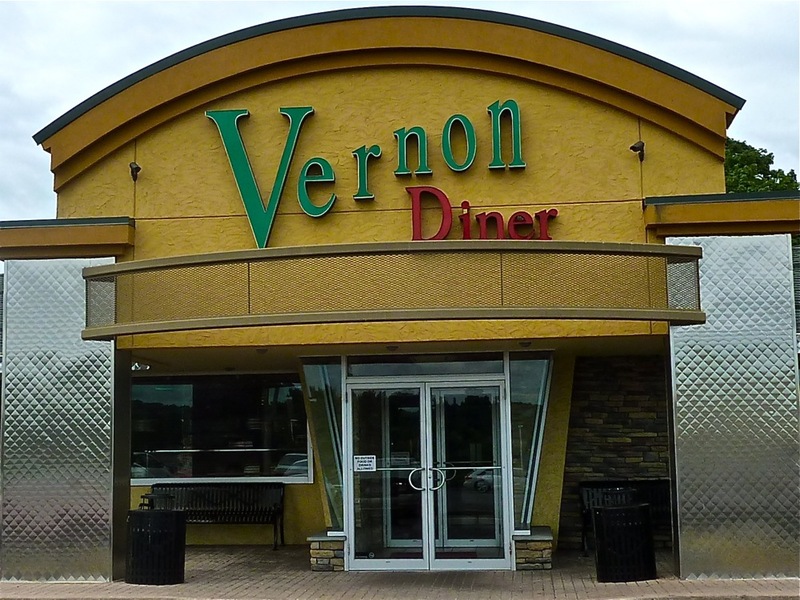 Interesting Vernon Diner tidbits: Before opening the Vernon Diner, master chef Teddy Demos worked at “high end restaurants in Manhattan as an executive chef and later went on to open up his own restaurant in Times Square,” according to the Vernon Diner web site. The Vernon Diner is located at 453 Hartford Turnpike, Vernon. Tel. (860) 875-8812. Web site: http://www.vernondiner.com. The sign states "EAT," and that they do at Zip's Diner in Dayville, Conn. This family-run small diner works hard to succeed and thrive in a world where small businesses and the economy, in general, have taken a beating. On my last visit, the real world scenarios painted a picture of the better side of America that happened to go far beyond the outstanding diner food served in a classic dining car. Stay-at-home moms took their kids out for that all-American treat, chocolate chip pancakes. Seasonal, local campers left their wooded vacationlands to let someone else do the home-style cooking. One of the waitresses wished her mom a great day, while another staff member talked with diner patrons about their trip to attend a wedding. The conversation started and ended frequently, as in between talks, those waitresses brought out meals while the customers talked across the room by coming up with even more details on the trip and wedding. Their spontaneous trip report beat any corporate travel guide, any day! Anyone not familiar with a diner, but would like to be introduced to the homey, unpretentious experience would be best served coming here -- this is the type of place that you would expect a diner to be with its friendly feeling and filling home-cooked meals served by some of the nicest waitresses in this dining genre. The exterior features silver stainless steel, the neon “Eat” sign on top of the dining car gets customers in the right frame of mind, and the retro feel of the diner contrasts sharply with the way the world has transformed virtually outside its doorstep with chain stores, gas stations, fast food restaurants chains and closed down factory buildings down the road. It might not be a pretty world out there, but things seems pretty good once inside Zip’s Diner. How nice to take a break from the world, as know it today! Menu classics abound with pancakes, Belgian waffles, corned beef hash, three egg omelets, biscuits and gravy, fried clams, Yankee pot roast, homemade soups, mac and cheese, burgers, BLTs, turkey clubs, chicken fried steak, hot turkey, roast beef and meatloaf platters, onion rings and fries, pies, strawberry shortcake, ice cream and baked pudding. I love the “Zip’s Special” – an open-faced sandwich featuring a seared, tender eight-ounce rib-eye accompanied by a side of perfectly-formed fries. 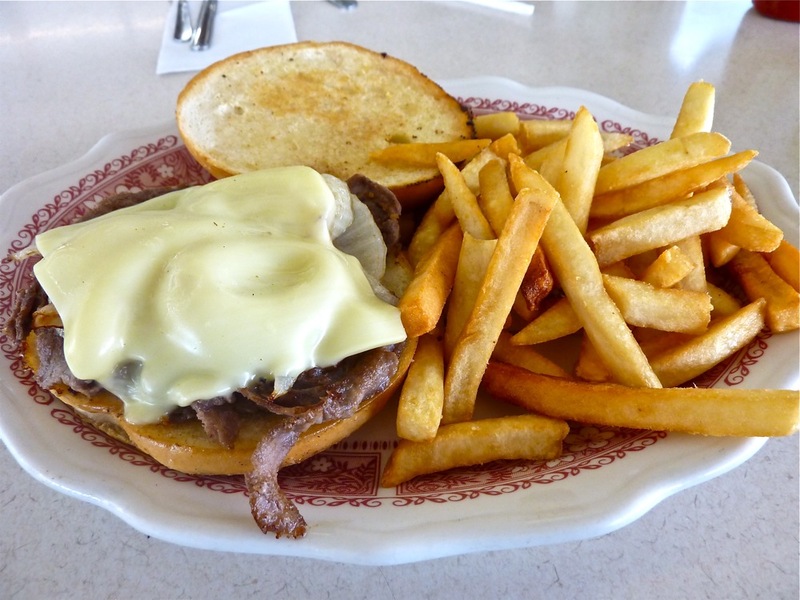 Rib-eye sandwich with cheese and fries from Zip's Diner. Although Zip’s is a thriving little place, we say enjoy it now as this type of authentic diner seems to be increasingly few and far between in a business world that seems less genuine and personable. I suspect Zip’s will continue to be around for a long time, but, at the same time, don’t take that for granted -- just enjoy the precious moments here and, equally important, know that there is always hot coffee on the burner! Open seven days a week for breakfast (served all day), lunch and dinner, Zip’s is conveniently located off Route 395 in this quiet northeastern Connecticut town, equidistant to Hartford, Connecticut, Worcester, Massachusetts., and Providence, Rhode island. Interesting Zip’s Diner tidbits: Bill Griffith, a popular cartoonist known for his comic strip Zippy, and the phrase “Are we having fun yet?” has eaten at the diner and featured Zip’s in his comic strip! Celebrities that have eaten at Zip’s include Liberace, Alec Baldwin, Kim Basinger, Brian Dennehy and Renee Zellweger. Athletes experiencing Zip’s: Ted Williams, Joe DiMaggio and Carl Yastrzemski, according to the CMTQ web site (http://www.ctmq.org/zip’s-diner). Zip’s Diner was also featured in Steven King’s novel 11/22/63, and on the cover of a novel, Ring in the Dead, written by J.A. Jance. Zip’s is located at Routes 101 and 12, Dayville. Tel. (860) 774-6335. Web site: http://zipsdiner.com/. 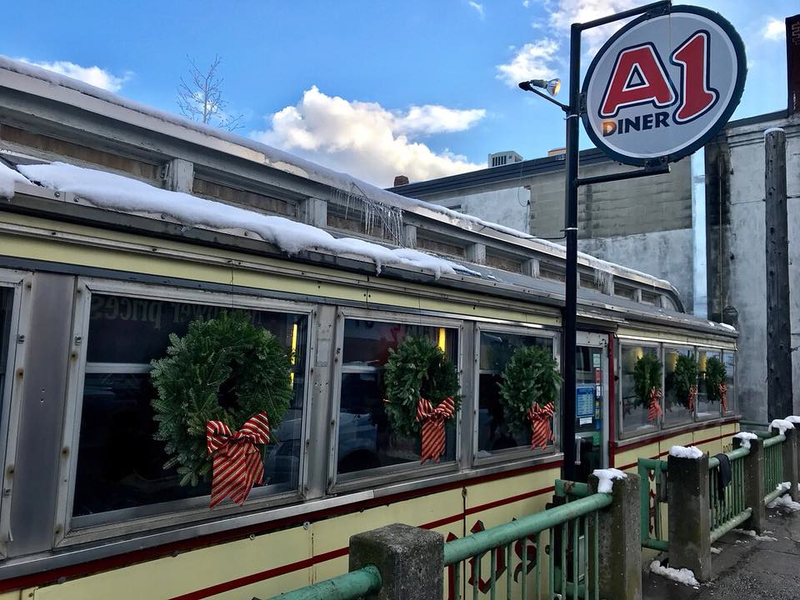 The A1 Diner brings lots of dining car charm to Gardiner. Photo credit: A1 Diner. I concur with Guy Fieri, of the Food Network's Diners, Drive-ins and Dives, who featured this amazing little diner on his show and spoke the world of its basic staples of "pancakes, burgers, biscuits and homemade soups!" I've only been to the A1 a few times, but somehow managed to get three of those four critical diner food groups into my stomach (no biscuits, he said regretfully). This beautiful little dining car has been around Gardiner since 1946. Michael Giberson says that he and co-owner Neil Anderson took over the A1 in 1988, and while keeping the old-time diner look intact, have upgraded the menu through the years. The A1 looks like the prototype for a diner and has not only been recommended by locals, but also esteemed media like the aforementioned Fieri, and Yankee and Down East magazines. Travel & Leisure Magazine once called the A1 Diner as one of the best 25 diners in America. 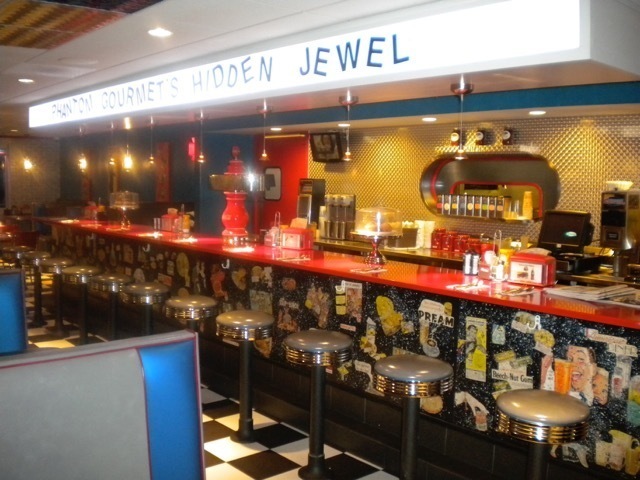 Sit on a chrome pedestal stool at the original pink marble top counter or in a blue vinyl booth, admire all the stainless steel, touches of neon, and just revel in the classic diner atmosphere over a juicy burger, cup of coffee and a homemade dessert! The A1 Diner has an interesting location, as it is built on steel stilts alongside a bridge! A1 Diner is located at 3 Bridge St., Gardiner. Tel. (207) 582-4804. Web site: https://www.facebook.com/A1Diner/. Millions of customers have dined at the Maine Diner since first opening in 1983. As you can tell now after reading the book to this point that many diners in New England set high standards. With that said, I regard the Maine Diner as the best diner in New England. That’s extremely noteworthy, given the tough competition. Each and every time, the Maine Diner just seems to embody every element that makes a diner great. Consistency matters, especially when the quality of the food and service are set to top-notch status. Sure, the Maine Diner could have easy "gone Hollywood" with its celebrity sightings, gift shop merchandising, borderline restaurant look, and an ambitious marketing plan. Is that any way a diner should act? I say, "Why not?" The Maine Diner might have a better grasp of the 21st century than your typical diner, but there are enough superb diner dishes, some of the nicest waitresses you'll ever meet, neon, counter, booths, and local conversation to call this a real diner -- and a great one, at that. The Maine ￼Diner taps into the coastal dining scene with some real seafood gems like lobster pie, lobster rolls, seafood chowder, crab cakes fried clams (all as good, if not better than some of the nearby waterfront restaurants, and often at cheaper prices), but I always like to go with the basics -- or as the Maine Diner puts it, ""World Famous Food Like Grandma Used to Make!" Some recommendations: the fluffy blueberry pancakes loaded with blueberries, Yankee pot roast, homemade chili, chicken pot pie, mac and cheese (they do have a yummy lobster mac and cheese version, too! ), and the “Diner Special” with two eggs, bacon, ham or sausage, and corned beef hash, home fries, toast and jelly. For dessert, I always go with either the blueberry pie (amazing, you can taste the blueberries unlike some of the artificial-tasting pies served elsewhere) or homemade Indian pudding. 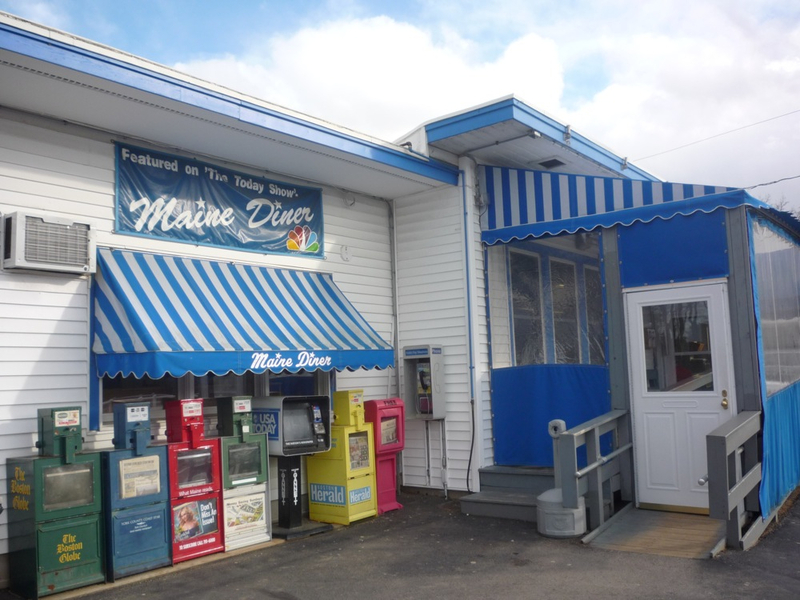 The Maine Diner is a relative newcomer to the diner scene having started in 1983, but 7,000,000-plus million customers later and a convenient location near many southern Maine beaches helps make the Maine Diner a landmark diner. We just love it here! Interesting Maine Diner tidbits: Maine Diner General Manager Jim MacNeill reports that former Boston Red Sox pitching great Luis Tiant is a huge fan of the Maine Diner, and eats there up to four times a week! Tiant is such a fixture at the Maine Diner that he goes to their Christmas parties and always finds time to talk with the waitresses, cooks and customers, according to MacNeill. He adds that, although not commonly known, the Maine Diner has stacked away signed pictures of Tiant for his fans -- just in case anyone asks. CBS sports anchor Jim Nantz has a plate named for him: the award- winning Seafood Chowder served with a choice of the Maine Diner’s famous hot or cold lobster roll. Apparently, Nantz loves this combo when visiting the Maine Diner! The delicious lobster pie -- huge chunks of fresh lobster meat topped with delicious crumbs and then baked to perfection in a casserole dish -- has been featured in The Cook's Magazine May/June in 1985; Good Food, Road Food August in 1986; Eat Your Way Across The USA; NBC's Today Show in 1997, and Diners, Drive-Ins and Dives in 2010. The Maine Diner is located at 2265 Post Rd. (Route 1), Wells. Tel. (207) 646-4441. Web site: http://mainediner.com/. Moody's Diner, Waldoboro, Maine. Photo credit: Moodys' Diner. 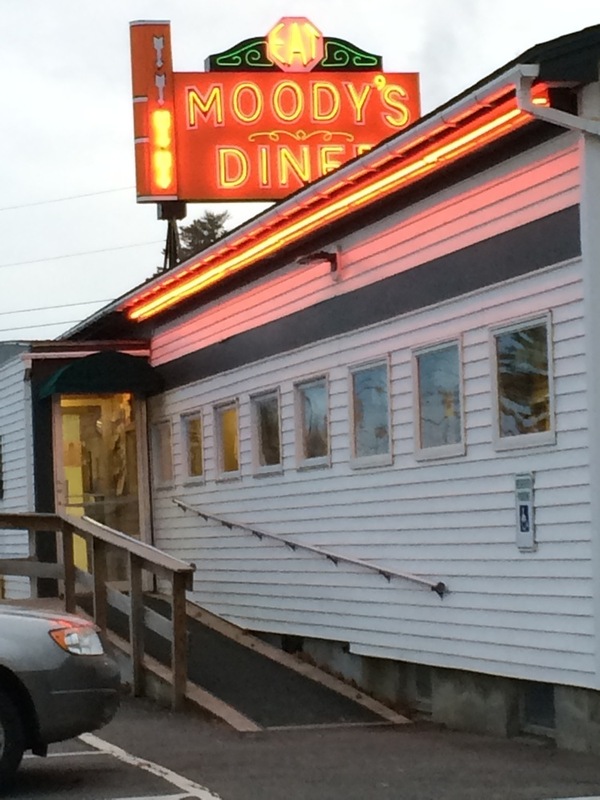 Moody's is famous to many outsiders as one of the best food stops, en route to famous Maine travel destinations like Camden, Bar Harbor and Acadia National Park, but locals know the diner as a historic icon. Whatever the case, the conversations going back many years always seem to favor Moody's for its excellent diner food selections. The Moody family actually started its business as a lodging establishment back in 1927, charging $1 a night for cabin accommodations back then (it is now a motel). A few years later, the diner started as a lunch wagon, which was moved down the hill when Route 1 was reconfigured. That lunch wagon has been expanded through the years into a classic diner. The diner is till operated by the children, grandchildren and great grandchildren of original owners Percy and Bertha Moody. Moody's Diner has an extensive menu with highlights including fried seafood plates, ham steak, honey dipped fried chicken, chicken croquettes with gravy, lobster, clam, crabmeat and haddock rolls, homemade soups, burgers, club sandwiches, homemade donuts and whoopie pies, and huge breakfast specials. Some of the daily specials are popular, too, including Yankee pot roast, meatloaf, baked beans and brown bread, and homemade turkey pie. It's hard to choose, but my recommendation is to go with the seafood. You are in Maine, after all! Moody’s Diner is located at 1885 Atlantic Hwy., US Route 1, Waldoboro. Tel. (207) 832-7785. Web site: http://www.moodysdiner.com/. Always crowded: the Agawam Diner, Rowley, Mass. 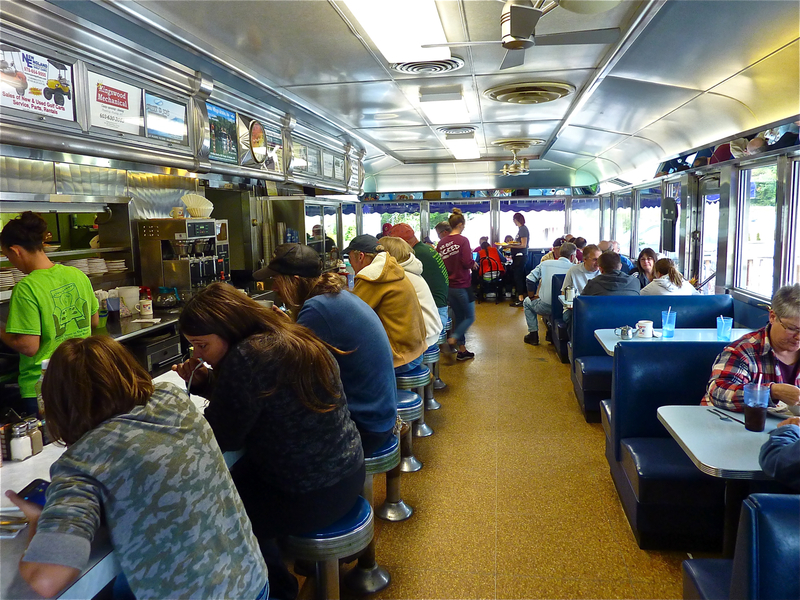 Housed in a charming 1954 Fodero dining car and listed on the National Register of Historic Places in 1999, the Agawam Diner gets more crowds than the typical diner which can easily be explained: it’s really good! Breakfasts are tasty and filling, lunches even better (although some will say the opposite) and the overall experience perhaps its greatest asset with waitresses that seem like they have been there forever and a dedicated crowd that collectively seems to be having a great time. I always see someone smiling whether entering or leaving the restaurant. Classic Diner setting at the Agawam. Go with the omelets, hearty chili, turkey club, or chicken pot pie and for dessert the banana cream pie -- they are all filling, delicious and have that homemade taste. Speaking of the chicken pot pie, the Food Network chose that delicious meal as the second best dish on its Top 5 Diner Dishes in America feature on the Nov. 30, 2015, segment of the Top 5 Restaurants show, hosted by Geoffrey Zakarian and Sunny Anderson. Here is the Food Network's rationale of choosing the Agawam Diner chicken pot pie as one of the best diner dishes in the country: "Customers love going to the Agawam Diner in Rowley, Mass. because they consider it their second home. Owner John Galanis' father began the diner and created all its recipes, which are at least 60 years old. Keeping the tradition alive, Galanis hasn't changed a recipe, especially not the chicken pot pie, which is made of boiled white meat, peas, carrots and gravy, all topped with a pastry round. The most-unusual thing about the dish is that it's flipped over a plate when served, so all the juices get absorbed into the top crust." The angel pie is a favorite, too: vanilla custard embedded inside chocolate cake and then baked in a pie crust. The generous portion of whipped cream only helps the cause! The Agawam Diner is cash-only but, fortunately, there's a bank across the street with an ATM. Better to drive to the bank instead of walking across the street as some of the drivers are insane. The North Shore has quite a few good diners but if I had to choose one, the Agawam would be at the top of the list! 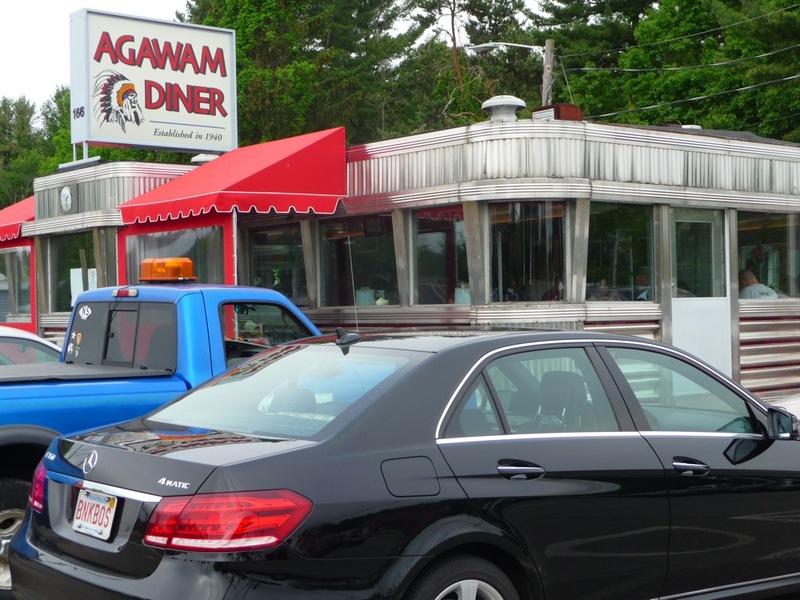 The Agawam Diner is located at Routes 1 & 133, Rowley. Tel. (978) 948-7780. Fall River is lucky to have an outstanding old-time diner like Al Mac's. Al Mac's actually closed for a while a few years back, but is open again, thank goodness! 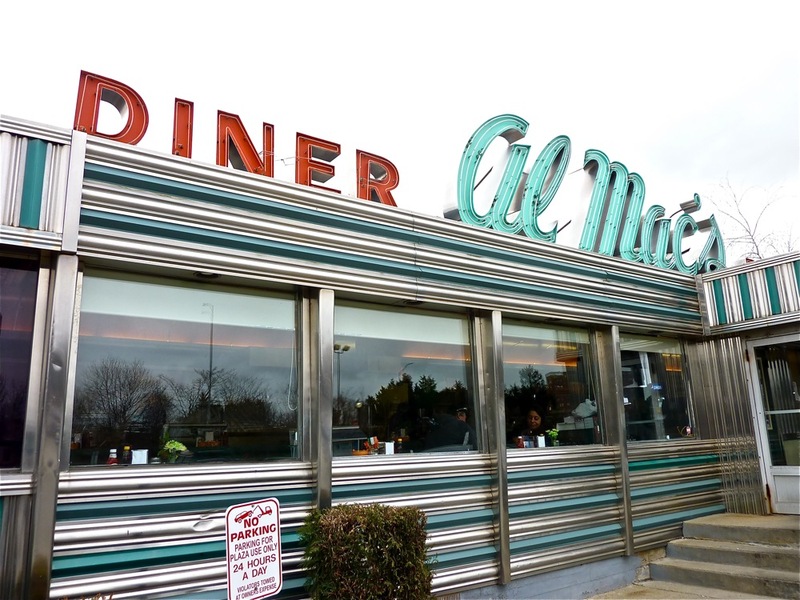 In business for more than a 100 years, Al Mac's is considered one of the "go to" diners in southeastern Massachusetts. They have an extensive breakfast, lunch and dinner menu with something bound to please everyone. Once a six-horse drawn wagon in 1910, Al Mac's eventually moved into a stainless steel silver and green DeRaffele diner in 1953. Known for its large neon sign with the slogan “Justly Famous Since 1910,” (It cheerfully brightens up that Fall River neighborhood) and large-portioned delicious meals, Al Mac's is everything a diner should be -- and with a foot in the 21st century, too, as they seem to have made a move to tap into local food sourcing whenever possible. I'd recommend the meatloaf and turkey dinners, homemade soups, tuna melts with sweet potato fries, the latter with all the “fixin's” including real mashed potatoes, caramelized carrots, stuffing, gravy and cranberry compote. Al Mac’s makes great homemade potato chips, too! Tuna melt with fries from Al Mac's. Interesting Al Mac’s Diner tidbits: Phil Devitt, in a Jul. 1, 2010, article at http://www.southcoasttoday.com/article/20100701/PUB03/7010423, reported that rapper Dr. Dre once ate at Al Mac's around the 2005 timeframe and that legendary rock group Aerosmith placed a "huge" order while filming a music video nearby in the 1990s. I am sure they thought it was F-I-N-E, fine (Aerosmith song reference, I just had to include that clever connection). Additionally, Al Mac’s has been featured in the nationally syndicated comic strip, Ziggy. Al Mac’s Diner is located at 135 President Ave., Fall River. Tel. (508) 567-5727. Web site: http://almacsdiner.net/. Worcester has many diners with the Boulevard Diner being one of the very best. ￼The Boulevard Diner is an exceptionally well-preserved vintage 1936 Worcester Lunch Car Company diner. With the sparkling exterior looking like it gets a good cleaning every day, the Boulevard Diner might be an old structure, but it stands out like new in a historic Worcester neighborhood. The Boulevard Diner -- serving breakfast, lunch and dinner -- is friendly, cozy and welcoming inside as if it was sheltered from some of the harsh realities of the modern world. Listed on the National Register of Historic Places in 2000, the well-preserved original wooden doors, yellow ceramic panels with red lettering reading "Boulevard Diner," marble counter, tile floors, Art Deco neon roof cresting with illuminated central clock, striped metal facade awning and barrel roof validate the deep historical diner roots. Gabriella George, the owner’s daughter, said that Italian dishes remain most popular at the diner with many of the recipes dating back to when her grandfather owned this landmark in the 1950s. Other Italian favorites include lasagna, manicotti, and the chicken parmigiana sandwich. If Italian food is not your passion, however, the Boulevard Diner serves all the diner favorites you could ask for from pancakes and eggs to meatloaf and fish and chips. If anyone has room for dessert, the Boulevard Diner features many options including apple pie, cakes, strawberry shortcake, grape-nut pudding, cookies and brownies. Last time I was here, I had a delicious American Chop Suey with a portion about the size of Worcester -- and keep in mind, it’s the second largest city in New England! The Boulevard Diner is open 24 hours a day (in a row, as comedian Stephen Wright would say). With only 14 stools and five wooden booths, the diner gets crowded -- especially weekend nights after the bar scene quiets down, as well as Saturday and Sunday morning breakfast time. Interesting Boulevard Diner tidbits: Martha Coakley, former attorney general of Massachusetts, stopped by the Boulevard Diner in the summer of 2014 to enjoy a meal! 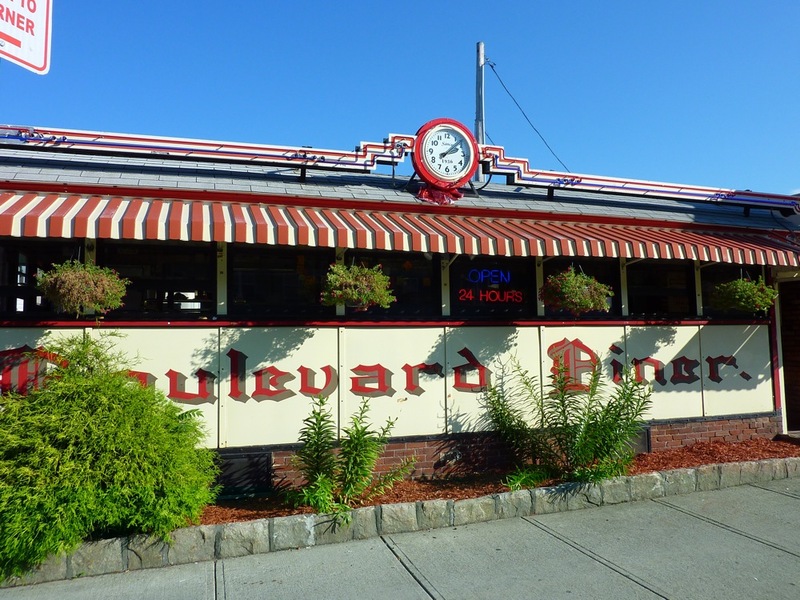 In mid April of 2016, the Boulevard Diner celebrated its 80th anniversary by offering meals at 80 cents throughout the day and night! Boulevard Diner is located at 155 Shrewsbury St., Worcester. Tel. (508) 791-4535. Web site: https://www.facebook.com/Boulevard-Diner-106450722008/. New diner that looks old: Brothers Diner in Medfield. What’s an old-fashioned retro diner with counter, stools and a soda fountain doing in a bustling, sleek modern downtown Medfield grocery store that sells fresh foods, local products, prepared meals, and basic grocery essentials? 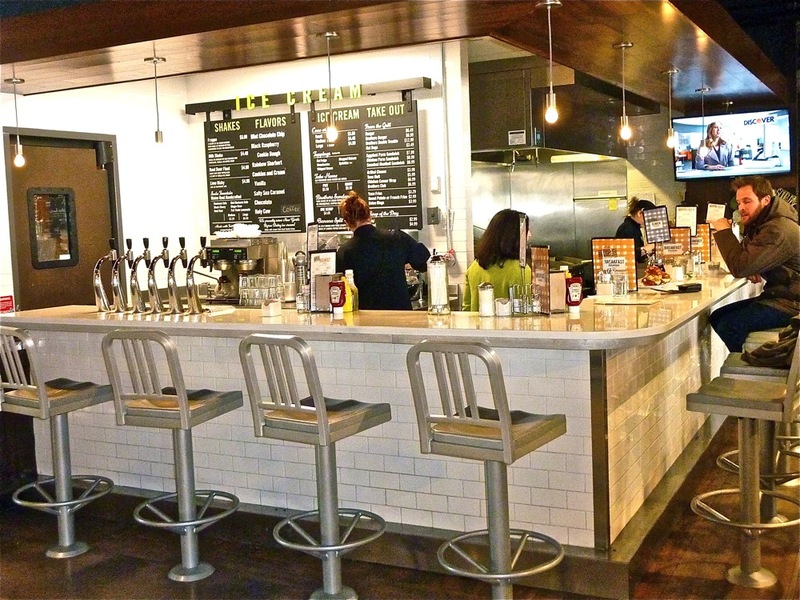 Massachusetts-based Roche Bros. supermarket chain, which opened Brothers Marketplace neighborhood-style grocery stores in Medfield (2014) and Weston, decided that a diner would continue the beloved tradition of the former Lord’s Department Store luncheonette at this location. While a nexus clearly exists between the Lord’s Department Store luncheonette and Brothers Diner, there are also differences (the terms “diner” and “luncheonette” are virtually interchangeable). Lord’s Department Store graced Medfield from 1940 to 2013 with a luncheonette that, in recent memory, was leased to private business owners. 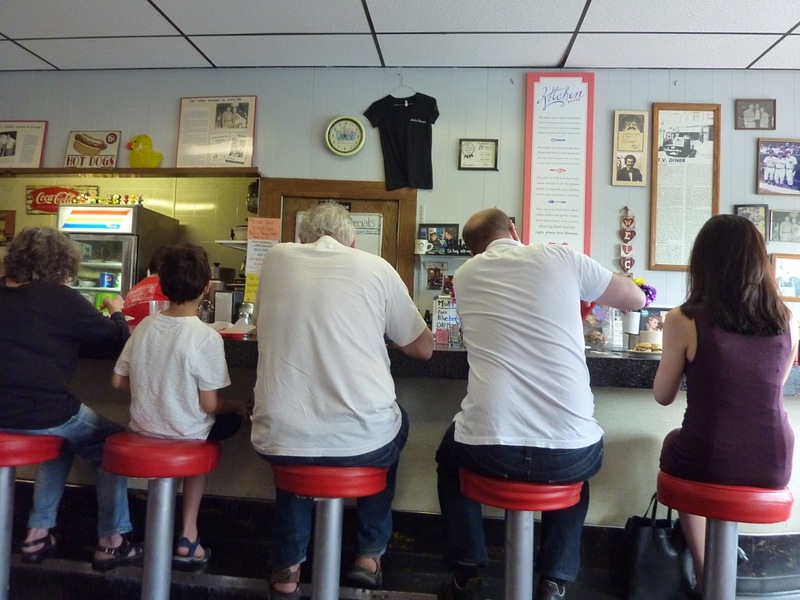 Some ran higher quality operations than others -- thus, the consistency varied -- but the town’s love for the old-fashioned luncheonette became a community staple with its counter, stools, checkered floor, soda fountain and other retro accents. Brothers Diner, while beautifully fostering a diner’s classic interior look and vibe, employs Roche Bros. employees to run the diner, as opposed to a leased operation -- this allows for more consistency in its food offerings. The Diner focuses on “clean ingredients,” and high-quality sourcing, while still offering many diner food classics, according to Dena Kowloff, director of marketing Roche Bros. The Diner sources hormone and antibiotic-free meats, including angus beef for flavorful burgers from Niman Ranch, of Northglenn, Colorado and a delicious pastrami by McKenzie Country Classics out of Burlington, Vermont). Diner coffee -- often traditionally tepid in many diners -- takes on a full-bodied and smooth-tasting flavor at Brothers Diner, courtesy of Armeno Coffee Roasters from Northborough, Massachusetts. Byrne Dairy, a beloved, fourth generation dairy farm in Upstate New York, supplies ice cream, which Brothers Diner offers in scoops, sundaes, banana splits, root beer floats and frappes. Brothers Diner also features other “sweet items” like milkshakes, and lime and raspberry rickeys. Incredible burger from Brothers Diner in Medfield. The old-time soda fountain features Maine Root handcrafted sodas made with Fair Trade organic evaporated cane juice. Soda flavors include regular and diet cola, black cherry, root beer and ginger brew, as well as lemonade. Breakfast items range from the familiar (pancakes, eggs any style, French toast, Belgium waffles) to signature, artfully-prepared creations like the Brothers Breakfast Sandwich with fried egg, cheese and grilled pastrami served on a Brioche roll. The lunch menu has several burger offerings, along with classic diner comfort foods like homemade soups, hot dogs, mac and cheese, tuna melts, club sandwiches and grilled cheese. Tucked away in the right corner of Brothers Marketplace, Brothers Diner seamlessly fits into the handsome, updated 21st century look of the entire grocery store, but somehow maintains its own retro identity. With counter, stools, coffee always brewing and wonderful small town, hometown conversations amongst customers and staff, Brothers Diner does what a diner is supposed to do -- that is, take you away from the stresses of the world and into a welcoming, homey place with no pretensions and a staff that comes across like second family. The veteran employees seem like the nicest aunts, uncles and cousins, and the kids working there often act like a favorite nephew or niece. Humphrey, as an example, works with the authentic style of a down-to-earth diner waitress by working many tasks, at once, but with a priority to always connect with regular and new customers. She clearly has a love for creating food and making friends. Brothers Diner also continues the Lord’s tradition by giving back to the community. Diner employees cannot accept tips, but that does not stop customers from doing so. Staff then decides which charity to donate the money, according to Croft. Nostalgic scenes of yesteryear, too, in the every day lives of local residents look like something out of a Norman Rockwell painting. On a cold winter morning, three-year-old Will Rumul feasted on pancakes with wide-eyes and a big appetite before heading off to preschool. Morgida recalls an older couple once creating a priceless moment at the Diner. Brothers Diner at Brothers Marketplace is located at 446 Main St. Medfield. Tel. (508) 359-6850. No frills dining at Carl's Oxford Diner. Constructed around a Worcester Dining Car, Carl's Oxford Diner features staff that could have had second careers as comedians. There always a funny man here, making the kids from three to 93 laugh with deft comic timing, short quips and jokes. 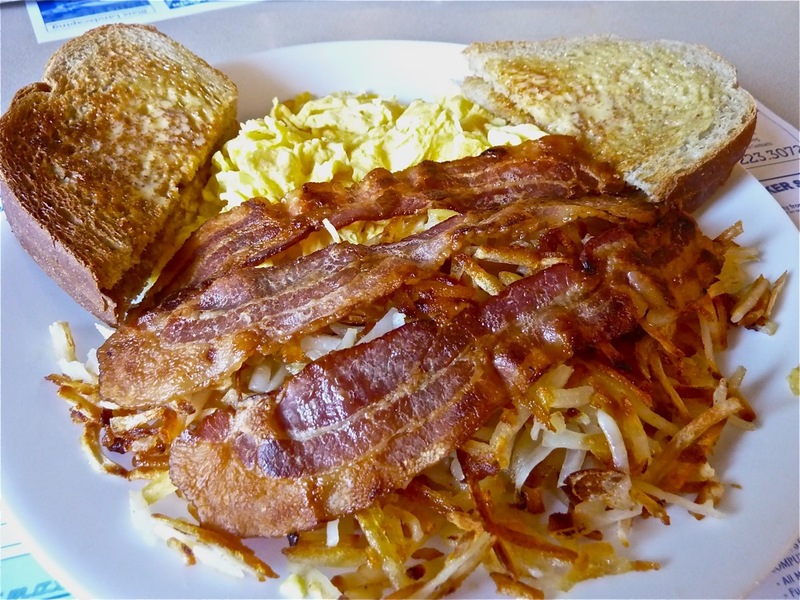 Carl’s is best-known for its delicious breakfast and lunch food that goes beyond big portions -- case in point, the “Bacon Special” with 10 strips of bacon, three eggs and a mountain of home fries. Certainly not a diner for anyone with a dedicated dietary New Year's resolution and the need to immediately improve cholesterol readings, Carl's, nevertheless, could very well serve as the prototype of everything good about a diner. The service is down-to-earth, the place looks like a real diner, and no one goes home hungry. In fact, the owners can often be heard asking the customers if they've had enough food. Although done with sincerity, it's kind of a ridiculous question given the portions here and favorites like the pastrami and cheese omelet, steak and cheese sandwich, the bacon cheeseburger, and chocolate chip pancakes. 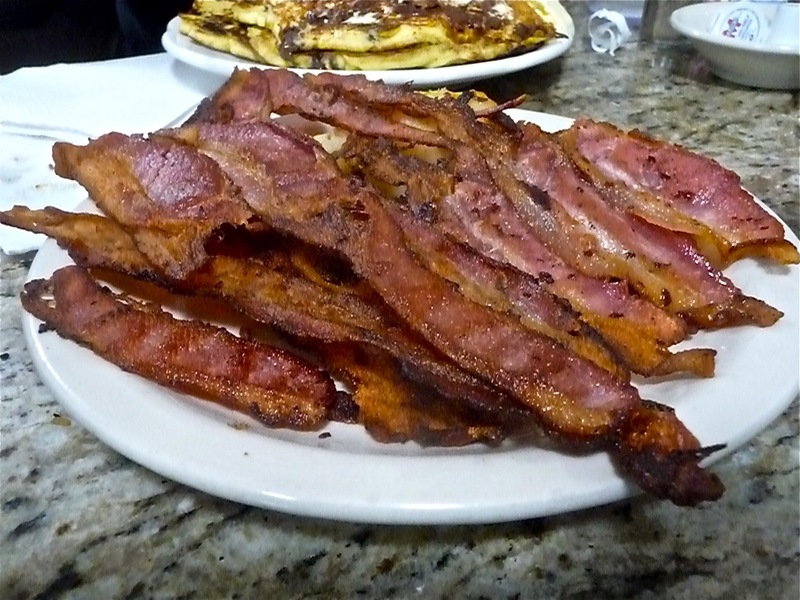 This is a side order of bacon from Carl's Oxford Diner! Interesting Carl’s Oxford Diner tidbit: I haven't had this happen to me but heard that if you don't finish your food, one of the lady employees will write "Real Big Wimp" on your take-home box and paint one of your fingernails red! Carl’s Oxford Diner is located at 291 Main St., Oxford. Tel. (508) 987-8770. Web site: http://carlsoxforddiner.com/. Several generations later, this tiny diner located at the backside of Natick center is best known for its delicious steamed hot dogs that “snap” when first bitten. Casey’s also makes a great cinnamon swirl French toast, double burger for just $6, at this writing, and a mouthwatering custard pie. First established in 1890 in a four-stool, horse drawn wagon serving hot dogs, Casey's transformed in 1922 as a Worcester Lunch Car Company diner and has been located in Natick since 1927. Double cheeseburger from Casey's Diner in Natick. 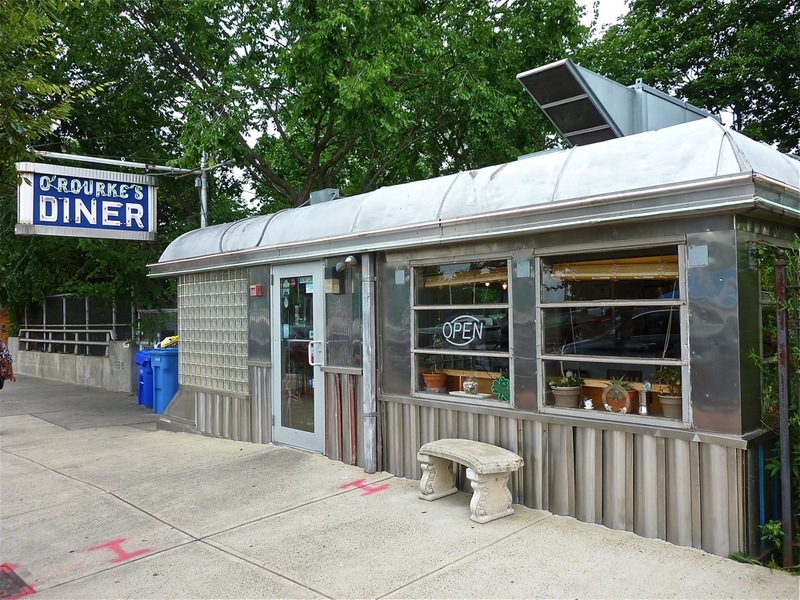 The diner -- nine bays wide and three deep -- features a metal barrel roof, galvanized steel panels painted yellow, original wooden door entrances, and an oak interior including the counter, counter apron, stools, and ceiling. It’s a beauty as far as diners go. There's barely enough room to move around -- and you might very well be waiting in line -- but the classic breakfast, lunch and dinner diner experience is timeless and priceless. Some say it is the oldest continuously running diner in the United States! Casey’s Diner is located at 356 South St., Natick. Web site: http://www.caseysdiner.com/restaurant/. 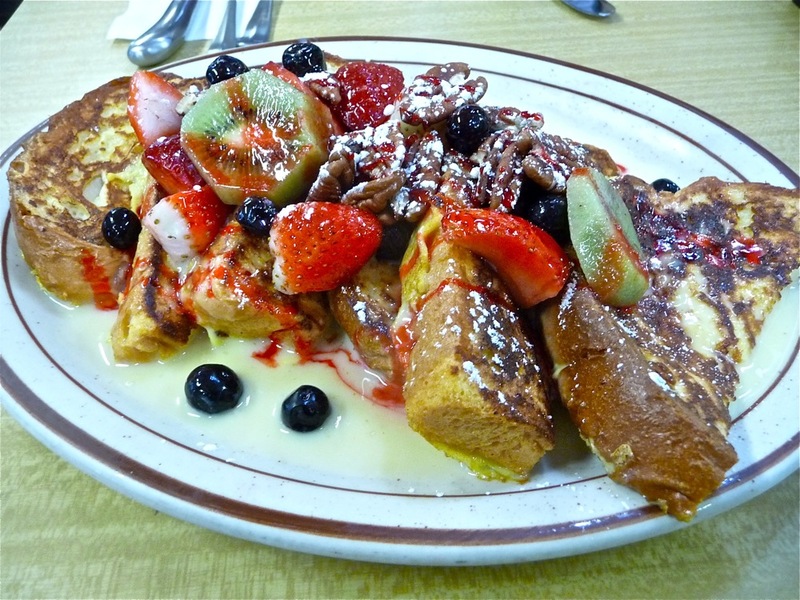 Dave's Diner is one of the newer diners in New England, and one of the very best. Dave's Diner (just 25 minutes from Cape Cod) was manufactured in Florida in 1997, but looks and feels like an authentic 1950s diner from yesteryear. What's more, the breakfasts, lunches and dinners are a throwback to another era with all the comfort foods one could ever want. 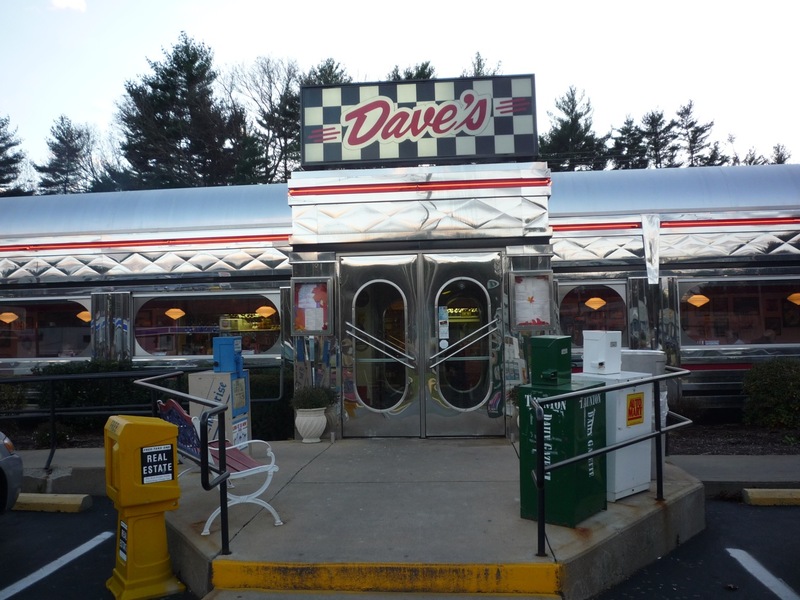 For starters, Dave's Diner features pancakes with real Vermont maple syrup, waffles, French toast, meatloaf, clam chowder, roast turkey dinner, chicken pot pie, beef liver and onions, mouthwatering burgers, a renowned fried chicken known for its tender marinated taste, and an assortment of pies and cakes. We recently sampled a delicious, thick New England clam chowder, a perfectly-done tuna melt, and some really phenomenal chocolate chip pancakes -- loaded with chocolate chips! Burger, fries and raspberry lime rickey at Dave's Diner. With a bustling and lively atmosphere, waitresses are constantly on the move (yet pleasant and efficient), while the cooks turn out large portions of delicious home style food at a frenetic pace. All walks of life seem to enjoy Dave's Diner from the tattooed crowd to the hungry family to the refined corporate business type. The classic 1950s diner look with neon, booths, counter service, tiled floors, a jukebox, and memorabilia on the wall lend a timeless feel that is synergistic with the wonderful old school diner food that has never gone out of style. Dave’s Diner is also spotlessly clean, not always a diner staple. Ultimately, Dave's Diner represents perhaps the best of the old-style diner, even if its birth was in Florida in the late 1990s. Getting into the classic diner spirit at Dave's Diner. Interesting Dave’s Diner tidbit: The Phantom Gourmet food television show once named Dave’s Diner as one of the eight great diners in a Great 8 segment. I agree, and place it in my top five diners! Dave’s Diner is located at 390 West Grove St., Middleboro. Tel. (508) 923-4755. Web site: http://www.davesdiner.com/home. Small in size but possessed with a big heart, the Dedham Diner caters to a mostly local crowd including residents of Dedham and Boston neighborhoods like Hyde Park and West Roxbury. Visitors to the Boston area looking for a quick, filling breakfast or lunch with down-to-earth efficient service should take note, also. Why pay top dollar at other Boston eateries when the Dedham Diner offers such great value for the money and and an experience that makes you feel like you belong? The homey-like outside with a house structure, bench, planting, brick steps, and and "Homestyle Breakfast and Lunch," and red "Open" signs lead inside to a community of locals sitting at the counter or at tables in the tiny dining room. Like many diners, most people seem to know each other to the point of the scene looking like one big family get together. Unlike some other diners, however, the staff treats newcomers just as well as the locals. In the rushed, often uncivil 21st century, it almost seems odd that people could be so nice. How refreshing to go back in time and enjoy neighborly relations -- even if not a neighbor. Feeling at home at the Dedham Diner. Of course, being treated well would not mean as much if the food didn't match the friendly surroundings. Fortunately, breakfast items like the chocolate chip pancakes with strawberry and whip cream or French toast and any of the sandwiches for lunch are quite tasty and substantial in size. In a nutshell, the Dedham Diner does the basics as well as any high quality diner. Add a blue collar vibe, a humble nature, attentive and personable staff and a real connection to the community, and you have the prototype for an authentic diner. Delicious pancake breakfast from the Dedham Diner. For those who think that diners in or near the city aren't as friendly as a rural diner, think again. Everyone here is treated like a regular. That the cash-only Dedham Diner has survived the fast food chains and seemingly infinite number of restaurants in the Boston area is a testimony to its dedication to serving the food that people love and doing so in a beyond pleasant manner. If I was giving a lecture on how to create a diner, the Dedham Diner would be featured in the presentation! You won't find many stories written online on the Dedham Diner, but that's OK. The stories are revealed every day in the Diner through working class conversations, family get togethers, small business pride of ownership and the chance to enjoy a simple, homestyle meal. 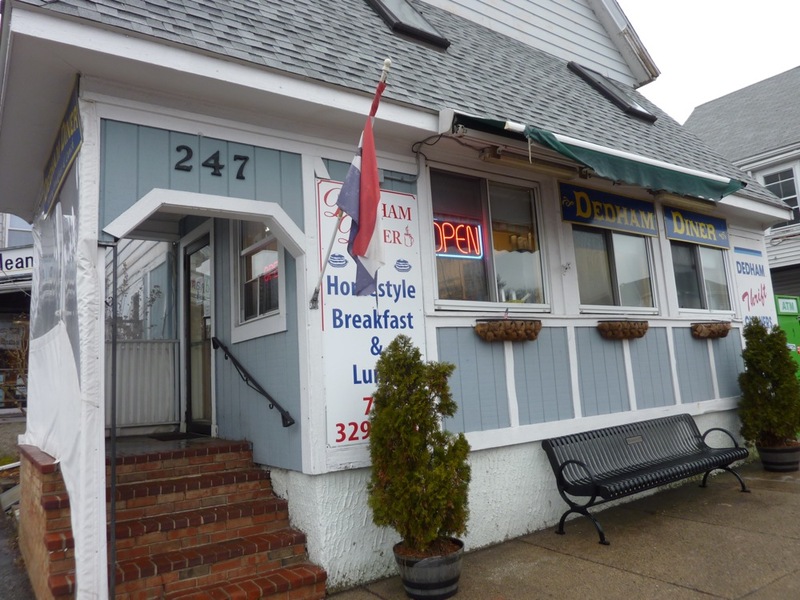 The Dedham Diner is located at 247 Bussey St., Dedham. Tel. (781) 329-3600. Plain dining car outside, creative cooking flair inside at the Deluxe Town Diner in Watertown. 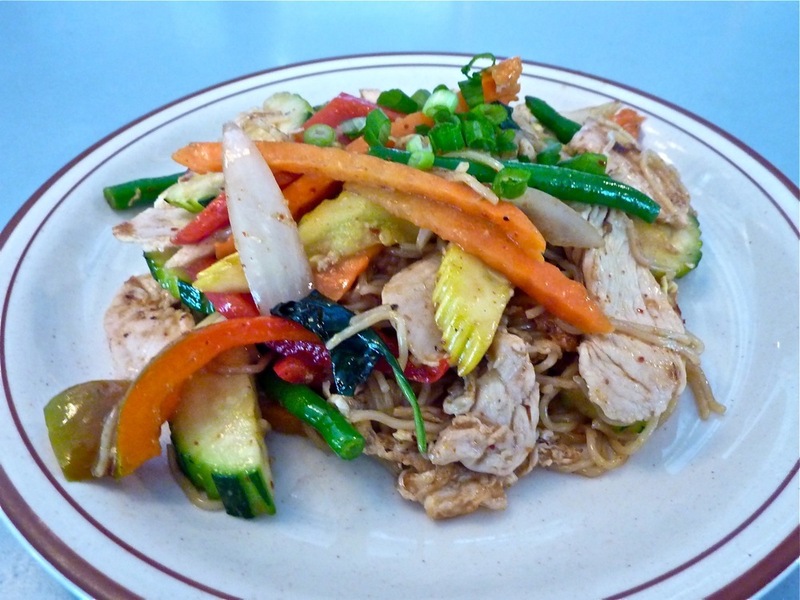 ￼Whether it's a meatloaf "blue plate" special or tofu vegetable stir fry, the Deluxe Town Diner in Watertown has a knack for pleasing all culinary preferences. Looking like a classic diner with its stainless steel, counters and booths and neon (the Diner has been in Watertown since 1947) and acting like a restaurant with a chef who should be working somewhere in the upper-echelon Boston dining spotlight, the Deluxe Town Diner represents the best of the modern diners -- and the best of the old school diners. Perhaps that's why you'll see everyone from blue collar types to college kids, all looking for a good bargain, as well as an option to have breakfast any time of the day. The breakfast, lunch and dinner menu is quite diverse, including virtually any kind of breakfast item (pancakes, waffles, eggs any style, sweet potato pancakes, breakfast burritos, etc. ), Johnny Cakes, soups, salads, wraps, sandwiches, and "blue-plate specials" like meatloaf, roast turkey, mac and cheese, Kobe and veggie burgers, franks and beans, and fish and chips. For breakfast, the chocolate chip pancakes are terrific, full of chocolate chips and made-from-scratch pancakes. For lunch, we loved the Asian noodle chicken salad, although "Mom's chicken noodle soup" the Falafel appetizer plate, apple curry turkey burger and meatloaf sandwich looked very tempting, also. For dinner, we especially liked the meatloaf dinner -- plentiful and with a homemade taste. A popular favorite: the sour cream and buttermilk-based flapjacks that can be filled bananas, blueberries, chocolate chips or pecans. 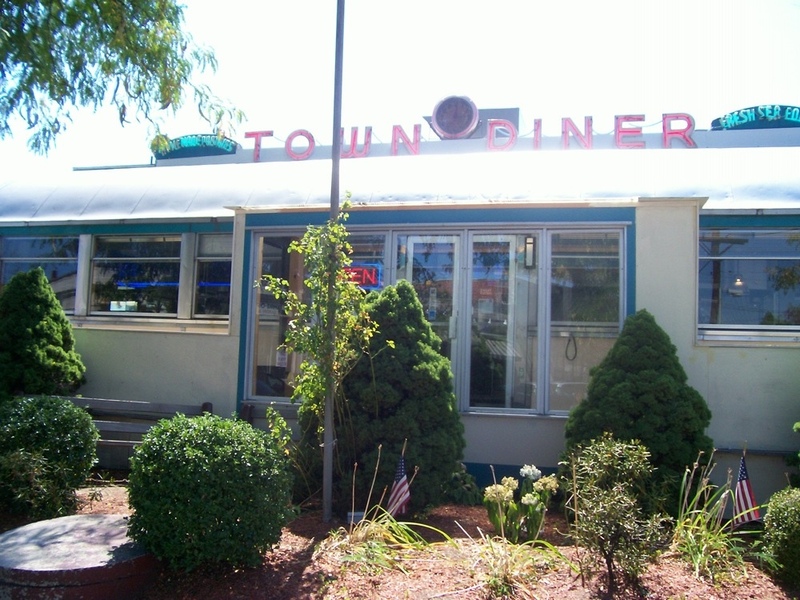 Deluxe Town Diner is located at 627 Mount Auburn St., Watertown. Tel. (617) 926-8400. Web site: http://www.deluxedinerbrands.com/deluxe-town-diner/. Don's Diner in Plainville dates back to 1936. Everyone loves a good diner, but how many of these landmarks remain open in the New England downtowns where the heart of our communities always used to gather for informal meals and great conversations? It seems like more diners today line the faceless highways, strip malls and remote roads leading from our town centers, but, fortunately, Don's Diner graces the modest but active downtown Plainville with an old-fashioned dining spot where everyone seems to say "hello" to each other. Plainville is just that kind of friendly small town and Don's Diner is the vehicle to enjoy that small town feeling. 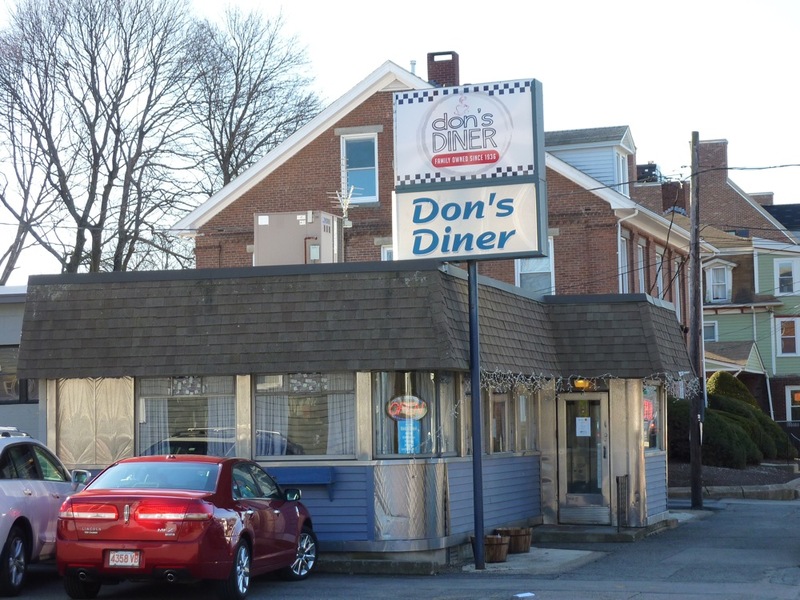 Don's Diner, after a brief hiatus, reopened its diner in late 2006, starting with breakfast only and then, adding lunches. A fourth generation diner dating back to 1936, Don's Diner is full of classic chrome, swinging stools at the counter, nostalgic memorabilia, local newspaper clippings, family photographs lining the diner car, a small out-of-date television playing, plenty of good conversation and comfort foods that collectively elevate this Plainville landmark to legendary local diner status. Recommended dishes include the hearty omelets, home fries, M&M and chocolate chip pancakes, and homemade blueberry and cranberry-walnut muffins. 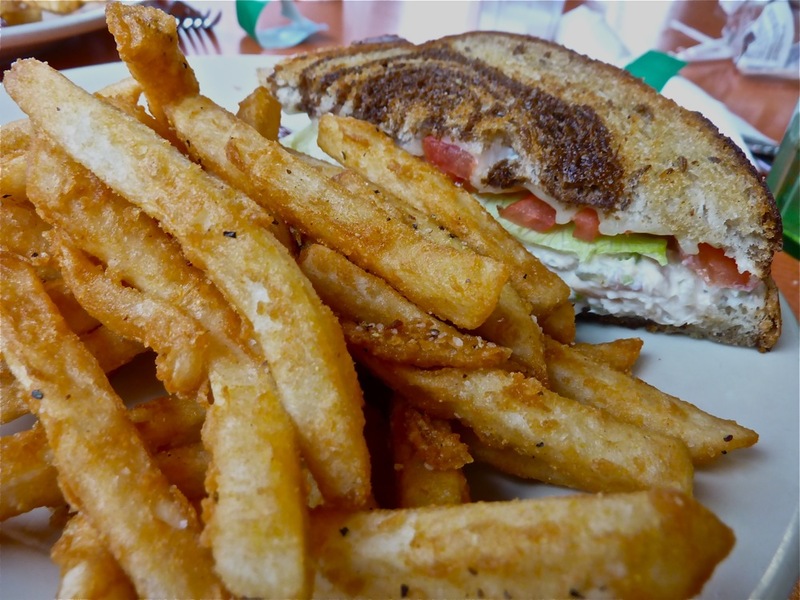 Lunches are substantial, too, including the juicy burgers (including the burger inside a grilled cheese named after “Auntie Nat”), piled high club sandwiches, tuna melts, and clam cakes and chowder. You can even opt out of the typical sandwich bread and order on a Portuguese sweet roll for a small additional charge! Additionally, the pleasant aroma of coffee and the quick, personable service add relevant diner flourishes that further validate the diner's authenticity. Breakfast done the right way at Don's Diner in Plainville. Sunday morning seems especially pleasant as the church crowds and families find time to all be together, thus reflecting the great, close-knit Plainville community spirit. Historically, a diner is that kind of gathering spot for local staff and customers, and Don's Diner represents its genre as well as any. Interesting Don’s Diner tidbit: Don’s Diner gets some strange food requests. Lynne Perrault, of Don’s Diner, told the Wrentham Patch in an Aug. 12, 2013, article (http://patch.com/massachusetts/wrentham/dons-diner-persevering-through-history), that a 90-year-old man would always order beef stew with peanut butter in it. Don’s Diner is located at 121 South St., Plainville. Tel. (508) 695-7036. Web site: https://www.facebook.com/Dons-Diner-Plainville-112745468740923/. The 50s Diner in Dedham is located on the first floor of an office building. The 50s Diner looks your classic historic diner, but is oddly located in a faceless corporate-like building near the Legacy Place shopping and entertainment complex. That hardly seems like an authentic setting, but it’s really no impediment. 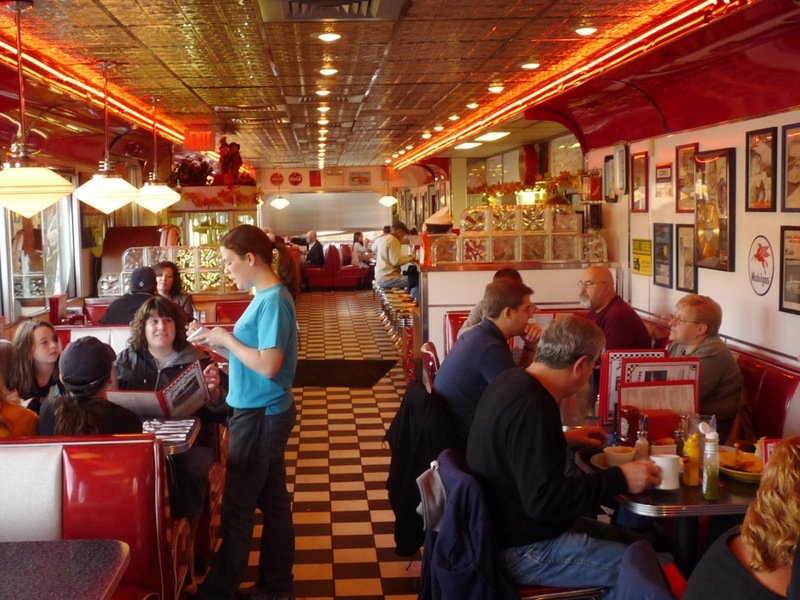 Once inside, the 50s theme helps create a real diner look with a vintage feel. With counter, booths, nostalgic signs on the wall and breakfast and lunch items done better than many historic diners, the 50s Diner is a much-needed local diner for business people, families, singles and just about anyone else that likes a nice traditional atmosphere. I recommend the homemade corned beef hash with eggs, it's phenomenal and filling! The lines frequently go out the door. While many customers appreciate the 50s Diner for evoking a genuine retro diner, just about anyone who comes here has big portions of comfort foods at the forefront of their minds. That’s why they don’t mind waiting, at times, for a half hour. 1950s music, an ATM machine set up in a telephone booth (cash only here), humorous and sometimes loud waitresses very mindful of continuously filling coffee cups, and lots of decorative memorabilia take you away from the corporate building setting and into a legitimate diner atmosphere that offers one of the best experiences in the diner genre within the Boston area. 50s Diner is located at 6 Legacy Blvd., Dedham. Tel. (508) 326-1955. Web site: https://www.facebook.com/50sdiner/. The Owl Diner: a household name in Lowell. Also known as just the Owl Diner, this famous Lowell diner dating back to the early 1950s is housed in a 1940 Worcester Lunch Car filled with stainless steel, neon, an external “Booth Service” panel, and that famous sign outside with an owl design perched over the “Diner” lettering. Originally a diner in Waltham known as the Monarch Diner, the Four Sisters Diner has taken on somewhat of a legendary status in Lowell for big breakfast and lunch portions, low prices, and a nice family-friendly atmosphere. I personally love the chicken salad sandwich on toast. 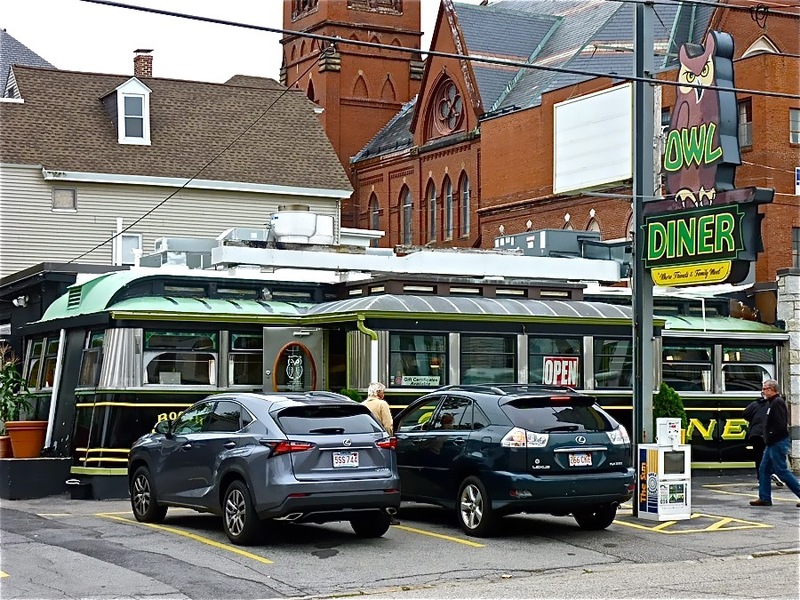 Ask anyone who knows Lowell well about going out for the best breakfast in town and there’s a good chance they will tell you it’s the Owl Diner! 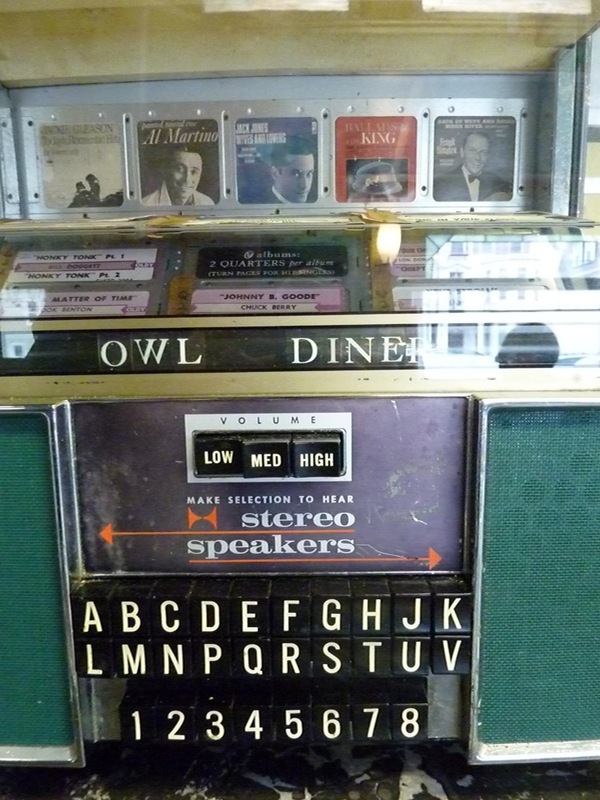 Old-time jukebox at the Owl Diner. Interesting Owl Diner tidbit: Lowell native Jack Kerouac, and famous author known as the “Father of the Beat Generation,” was known to frequent the Owl Diner. Former Massachusetts senator and presidential candidate, the late Paul Tsongas (a Lowell native, too) also ate here. The Owl Diner is located at 244 Appleton St., Lowell. Tel. (978) 453-8321. Web site: https://www.facebook.com/OwlDiner-113474758685450/. Old-time ambiance saturates the Foxtown Diner in Shelburne Falls, Mass. The Foxtown Diner continues a proud tradition of serving delicious comfort foods in an old-fashioned small town setting. With excellent service, good coffee and a heavy dose of local conversation, this is the type of cheap eats breakfast, lunch and early dinner spot that is timeless, tasty and, ultimately terrific. The prices are lower than most diners, too - noteworthy, given that diners are inherently a good value. Going to the Foxtown Diner is almost like a rite of passage into the wonderful feeling of being in Shelburne Falls. The friendly hometown personality shines here and, like many diners, everyone seems to know each other. The decor is behind the times, but that’s perfectly OK; it’s like going back to the nostalgic, happier days side of the 50s or 60s here. There’s just this beautiful feeling, for many, reading the paper over a cup of coffee and looking out the window to see one of the most idyllic small town main streets in New England. It’s like something out of a movie, only it’s real. 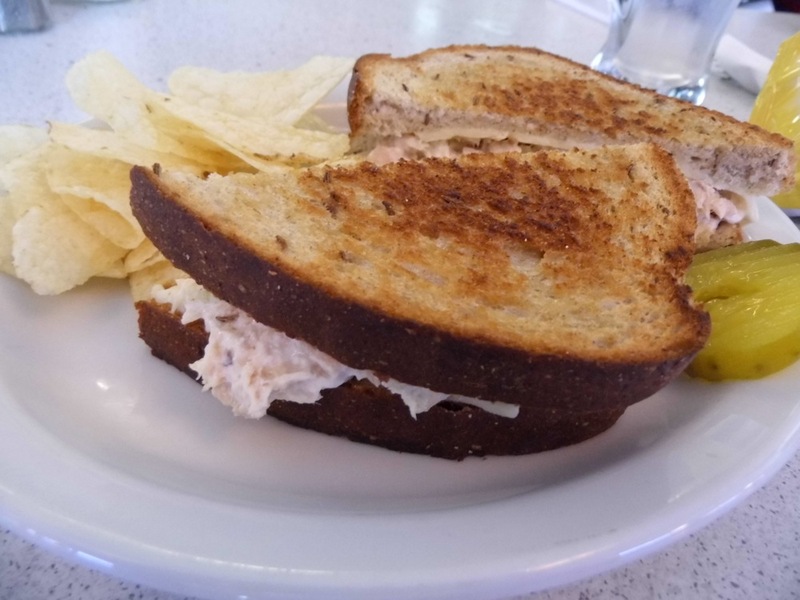 I recently had a tuna melt and fries here that was second to none -- and it was served by a friendly waitress who genuinely seemed to enjoy working at the diner. Some of the most popular items here: pancakes, French toast, handmade doughnuts, omelets, homemade soups and pies, fresh not frozen burgers, piled high club sandwiches and, thankfully, real maple syrup (too many diners only offer the fake kind). The Foxtown Diner is just a three-minute walk to the Bridge of Flowers, a must-see New England travel attraction -- this former trolley bridge features 400 ft. of more than 500 varieties of flowers, shrubs and vines! 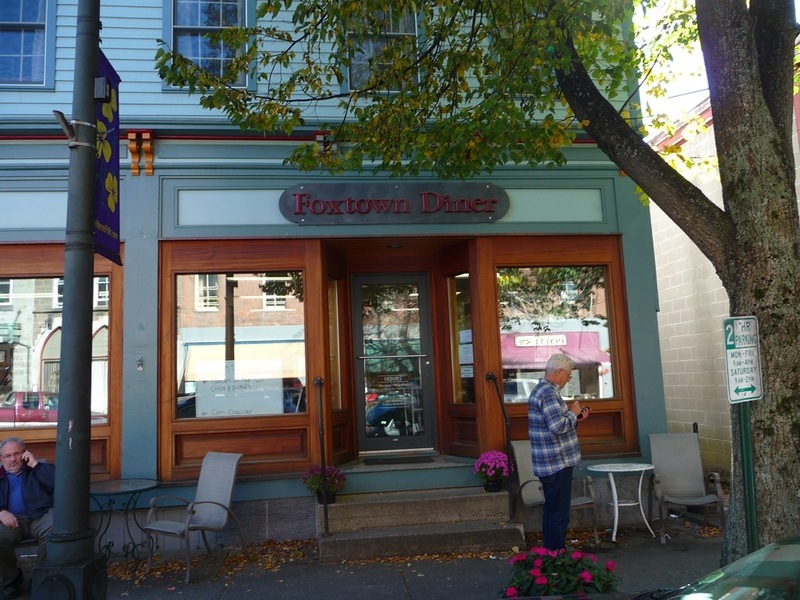 The Foxtown Diner is located at 25 Bridge St., Shelburne Falls. Tel. (413) 625-6606. A welcoming place: Joe's Diner in Lee, Mass. While on the Mass Turnpike, en route to Cooperstown, New York, we became hungry. OK, wicked hungry, actually, as they say in Boston and much of New England. Instead of our usual visits to highway stop, service plaza restaurants, we opted to take Exit 2 (the Lee/Pittsfield exit) in hopes of eating at, and supporting a local business. Just a few minutes off the exit, we headed into sunny, charming downtown Lee with its tremendous variety of mom and pop shops with colorful signage, people strolling the main drag, a local event going on at the town common, and a certain friendliness transmitting from the town into our car, Lee seemed like the type of idyllic small town you would see in a Hallmark movie. Better yet, Lee seemed like a Norman Rockwell town, which makes sense as the famed author, painter and illustrator once lived in nearby Stockbridge and often drew upon the area for inspiration in his works. There is even a Norman Rockwell Museum in Stockbridge, which is well worth seeing, but we'll save that story for another day and book. On the northern outskirts of downtown Lee right by the railroad tracks, we came across Joe's Diner. Unassuming in appearance with a plain "Joe's Diner" sign and an old-time Pepsi sign above, American flags in the window, a wooden bench and flowers near the entrance, we then stepped inside to another time and place where local customers and waitresses conversed over big portions of classic comfort foods like burgers, turkey sandwiches, pancakes, corned beef hash and signature drinks like coffee, root beer and milkshakes. Looking around the room suggested a sense of history and community pride. Colored drawings from elementary school students saturated one side of the wall. Photos of celebrity visitors -- the DiMaggio brothers and U.S. Secretary of State John Kerry, to name a few -- lined another wall. Most prominently, that famous Saturday Evening Post drawing known as The Runaway -- a friendly policeman talking with a small would-be runaway boy at a diner -- stood out from everything else on the wall, given its legendary pop culture status. You see, Joe's Diner was reportedly once part of the inspiration for Norman Rockwell to come up with that masterpiece. Ambiance and history aside, Joe's Diner serves very good diner food at lower-than-usual diner prices. Whether breakfast, lunch, dinner or a slice of homemade pie, chances are your selection will taste much better than what you'd find at the highway service centers. While we loved our waffles, omelets and tuna melt, food clearly isn't the only reason to come here. 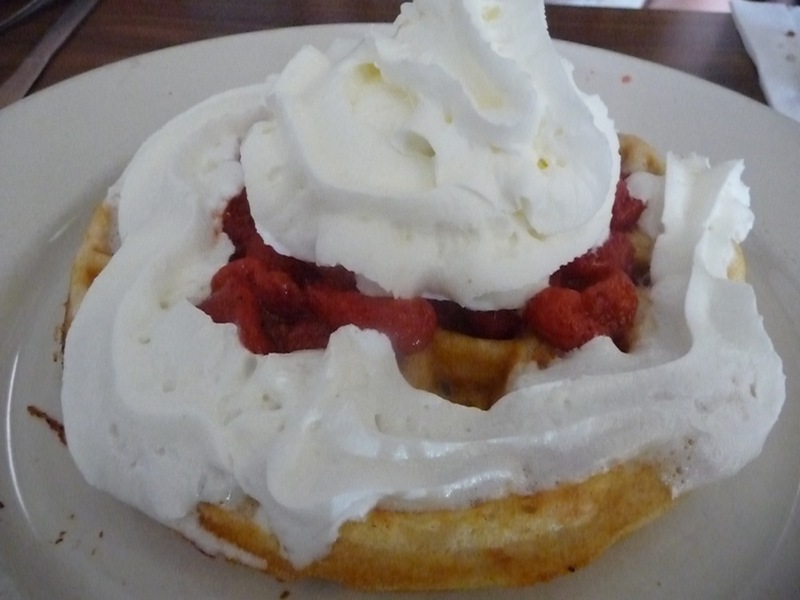 Waffles with strawberries and cream from Joe's Diner. The chance to be introduced to a very nice town, connect with the community in the diner and have seasoned waitresses --as opposed to disinterested employees serving you in between their texting and social media empires -- is a modern day revelation. Joe's Diner taps into that nostalgia by slowing down the pace from our higher speed highway routes, and getting down to the basics. It is part of the America we used to know, and that, happily, still exists in some neighborhoods to this very day. Classic diner scene at Joe's Diner. For tourists, It’s certainly worth the five minute drive from the Mass Turnpike or to those looking for an excellent affordable meal while vacationing in the Berkshires. For locals, Joe’s Diner is a way of life in this idyllic small Berkshire town. 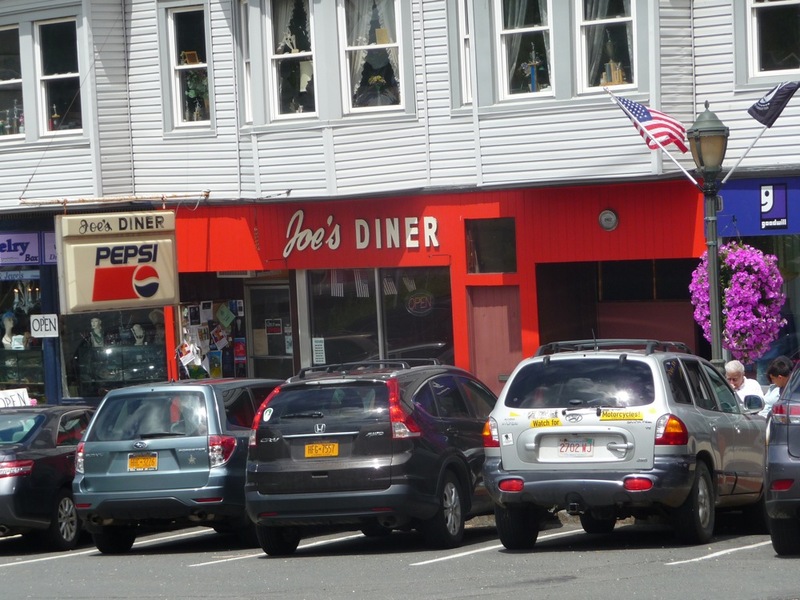 Joe’s Diner celebrated it 60th anniversary in 2014, although a diner formerly next door started in 1939. Joe's Diner is located at 85 Center St., Lee. Tel. (413) 243-9756. "Good sandwiches" and more at Kelly's Diner in Somerville. This historic diner has been a￼ Boston area breakfast and lunch favorite since moving to its Somerville address in 1996 after residing 42 years as a roadside stop in New Castle, Delaware. Wearing its heart on its sleeve with window signs stating “ Good Sandwiches,” and “Jerry O’Mahoney 1953 Dining Car,” Kelly’s not only attracts a great following in its Ball Square location -- as well as from Tufts University students -- but the entire metro Boston region looking for a good diner. It’s easy to see why: the sandwiches are better than “good,” the breakfasts huge and the blue plate special like the roast turkey dinner in the classic comfort food mode. This cash only diner can also accommodate more people than your standard historic diner. The Kelly’s Diner web site, at this writing states, “It measures 55 feet long and is one of the largest diners ever manufactured in the 1950's.” The above average length, however, does not take anything away from the real diner vibe with waitresses who have been here a long time, lots of stainless steel, mini jukeboxes, and other vintage elements. Although the window sign promotes sandwiches, breakfast might be the diner’s ace in the hole. If you are truly hungry, go with the “Kelly Super”: two eggs, two pancakes, choice of bacon or sausage, home fries and toast. Other specialty dishes include corned beef hash, corned beef sandwiches, lobster rolls and meatloaf. To enhance its nostalgic diner look, Kelly’s Diner features a James Dean statue at the door and a Betty Boop version behind the counter! The waitresses often ask regulars if they will have the “usual.” The locals confirm the question, and often go on to talk about their days, their weeks, their months, their lives. Interesting Kelly’s Diner tidbits: Yankee Magazine featured Kelly’s Diner as one of the top five diners in New England in its May/June 2008 edition (https://newengland.com/yankee-magazine/travel/new-england/places-to-eat/fivediners/). 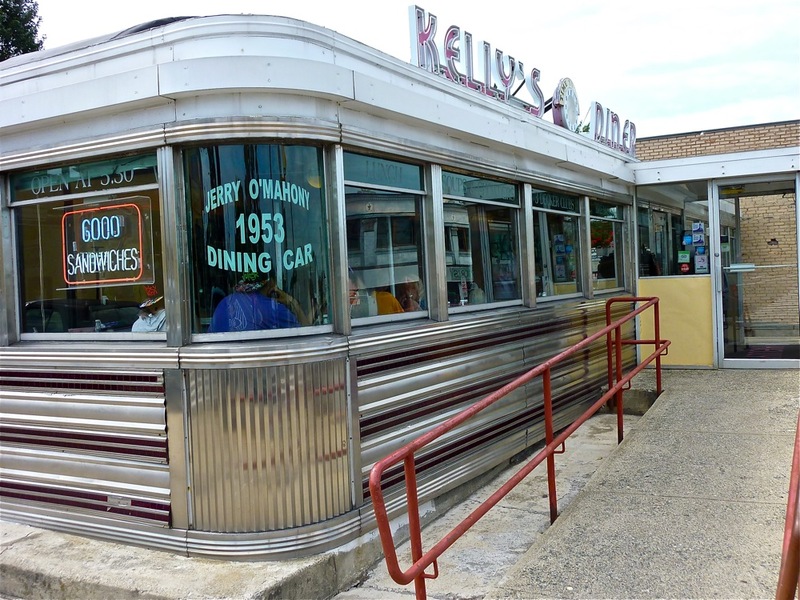 Kelly’s Diner also appeared on the Food Network’s Diners, Drive-ins and Dives as host Guy Fieri visited to find out the secrets of making a great lobster roll. Kelly’s Diner is located at 674 Broadway, Somerville. Tel. (617) 623-8102. Web site: http://www.kellysdiner.net/. I am going out on a limb to say this, but one of the tip offs that this Woburn diner is not your typical diner is the glass coffee pot on top of the coffee maker is full of ginger sauce. 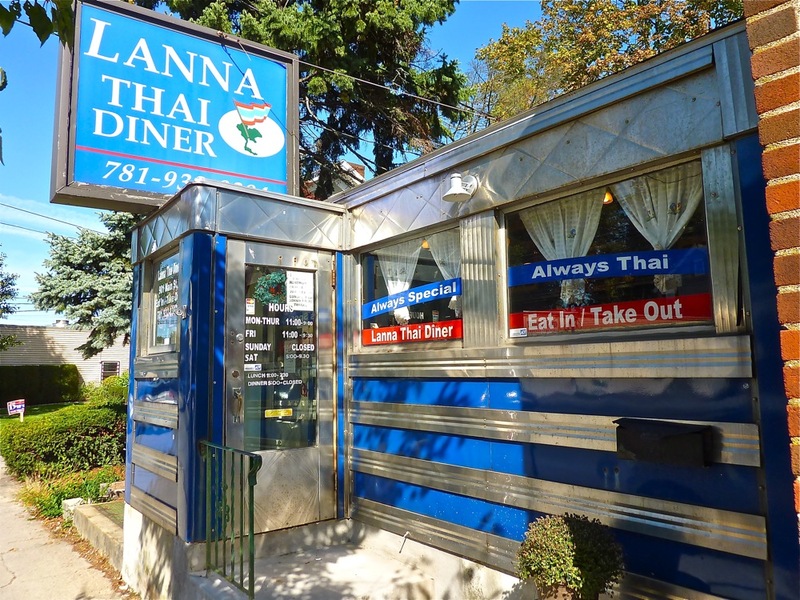 While the facade of the Lanna Thai Diner has Americana written all over its stainless steel exterior 1952 Worcester Dining Car, this little diner -- according to my research -- is the only dining car in New England that serves Thai food. Once known most prominently as Jack's Diner, this dining car has been through a few ownership changes, but definitely seems to have hit on a for-the-long-run niche as a Thai diner over the past several years. They do a great business and fill a need for suburbia in search of more diverse cuisines. Lanna Thai Diner might be housed in a tiny diner, but the menu is big and full of authentic Thai lunch and dinner including appetizers, soups, salads, main entrees, Northern Thai specialties, noodles and fried rice, Thai curry selections, and desserts like roti (crispy pastry dough lightly fried and topped with sweetened condensed milk and sugar), fried bananas, ginger ice cream, and fresh mango. I recently had a delicious “lunch special” dish with egg noodles, chicken and vegetables that rivals the best in this culinary genre. The service is quick, but the pace is, by no means, rushed as the Lanna Thai Diner folks clearly want each customer to enjoy the overall experience. Not your typical diner food: Authentic Thai cuisine at Lanna Thai Diner. The owner, Max, is very friendly and I have read that he uses vegetables from his own garden. That’s no surprise, as the food tastes fresh and natural. Many Thai restaurants have similar decor, but that is simply not the case at Lanna Thai Diner with its old-time diner look. Just as important, the Thai food tastes as good as what you would find in the city! Lanna Thai Diner is located at 901C Main St., Woburn. Tel. (781) 932-0394. Web site: http://www.lannathaidiner.com/index2.html. Little Depot Diner. Photo credit: Alicia at Little Deport Diner. Deemed by customers as the "Cheers of Diners," The Little Depot Diner is a place where everyone seems to know each other. 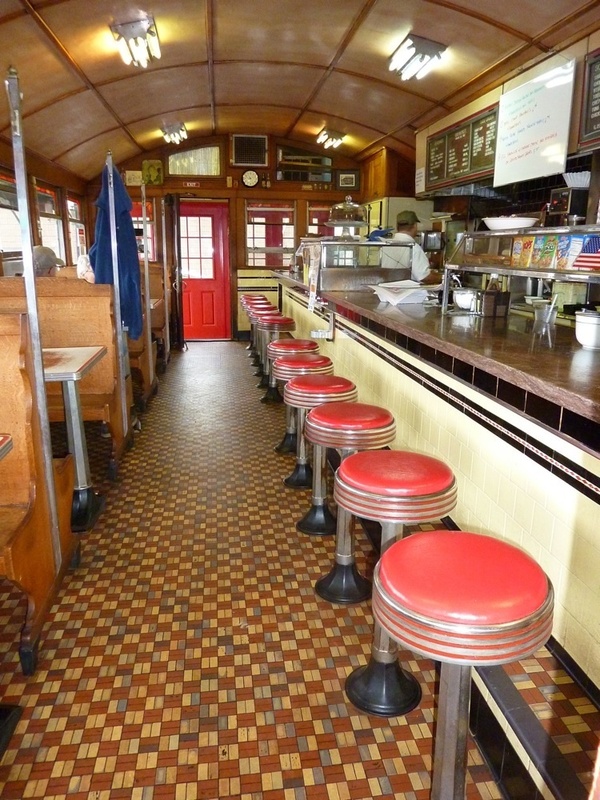 The diner is a small, 15-stool Worcester Lunch Car that was built in 1929. It was first located in nearby Danvers and Lynn before making its final stop at its present day location in Peabody. The stools, floor and others parts of the diner still remain from the original structure. The Little Depot Diner’s slogan is "Breakfast with the Blues" as no matter when customers come in during business hours, they will always hear blues music from the speakers -- including Jimi Hendrix, Stevie Ray Vaughan and Joe Bonamassa. Local musicians also come in and play their harps (harmonicas, not the oversized stringed musical instrument) to the music! Ross learned from Alicia’s family on how to make Hungarian sausage, which is always available at The Little Depot Diner -- the paprika is imported right from Hungary. Not satisfied with one take on sausage, Ross is always making other versions (Italian, kielbasa, bratwurst, you name it!) Besides Ross serving up home-made sausage and sandwiches, he sources milk and eggs from Dunajski Dairy in Peabody. “We pride ourselves on using fresh, local and the best quality of ingredients,” said Alicia. Breakfast served all day, solid lunches (not served on weekends, though), a friendly staff that serves food quickly, a toy train on tracks (complete with air whistle) running through the diner, blues music playing, and a 1929 old Worcester Lunch Car setting (at this location since 1950) help make The Little Depot Diner one of the more appealing, welcoming diners in Massachusetts. The pastrami Eggs Benedict is a favorite, but you can't go wrong with the pancakes, French toast and burgers. Whatever you do, make sure to order the mouthwatering Nutella frappe. This is a tiny place with a big heart! Cash only here, folks. Interesting Little Depot Diner tidbits: The Little Depot Diner once appeared on the famous Diners, Drive-ins and Dives TV show on the Food Network. The Little Depot Diner is located at 1 Railroad Ave., Peabody. Tel. (978) 977-7775. Web site: http://www.thelittledepotdiner.com/. 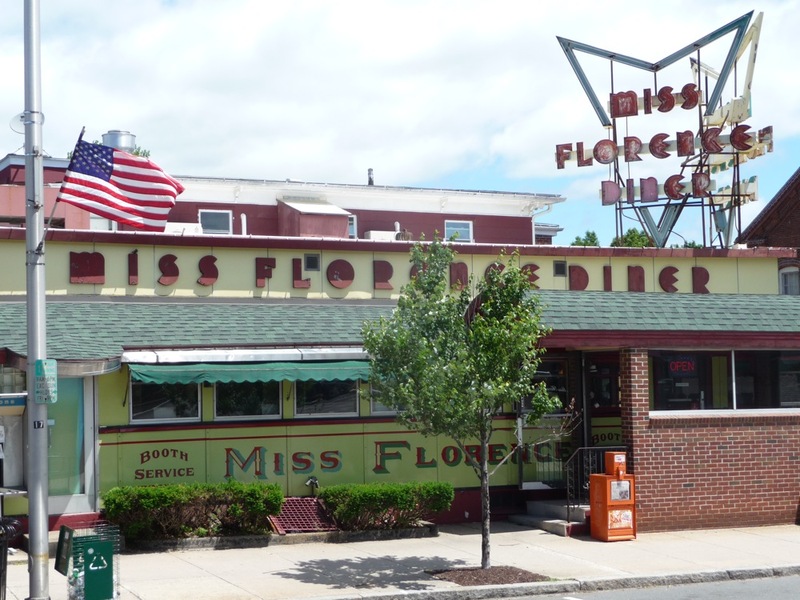 The Miss Florence Diner dates back to 1941 and continues as a beloved tradition in Florence -- a charming, close-knit, Mayberry RFD-like neighborhood in Northampton where everyone seems to know each other. Conversations seem to share a front seat with the food here at this classic diner listed on the National Register of Historic Places. On a recent visit, I heard some artsy guy talking about art museums (makes sense to me), another conversing passionately about hiking (so much, I was ready to tell him to take a hike), and an old-timer bragging to others about going to a social event and “dancing with two fine ladies.” The small town conversations add that much more ambiance to this friendly small town diner that looks the the retro version of an anchor business in a downtown-like district. The old dining car with a huge Miss Florence Diner sign on top of the building is hard to miss and even harder to resist as the scene is so welcoming, so Norman Rockwell-like (I know we just said that about Joe’s Diner in Lee, but the Miss Florence has that ambiance, too). Inside, the arched ceiling, the wall jukeboxes, the counter, the booths, the conversational waitresses and customers, the oversized breakfasts, the burgers, pot roast, club sandwiches, soups of the day, fresh turkey sandwiches and plates, and homemade pies are just a fraction of the fabric that makes this diner a local treasure. Make sure to remember “The Alamo,” a heaping mix of eggs, beef chili, corn muffin and cheese sauce -- and good luck trying to finish it as the portion is enough for two people, or maybe 20, if examined by the Calorie Restriction Society. "The Alamo" from the Miss Florence Diner. Every turn of the head reveals a nostalgic reminder without a hint of trendiness or pretentiousness. The Miss Florence is a real diner with no real interest in becoming something it isn’t -- the customer benefits most and the historic status of diners so wonderfully remains intact. The old-time slogan -- “Ain’t No Finer Diner” -- is entirely accurate. "It's one of my favorites --- so cool!" said Eric Mabius, a fine actor whose credits include the Hallmark Channel’s Signed, Sealed and Delivered, and ABC’s Ugly Betty (2006-10), about the Miss Florence Diner. Eric, a big-time fan of New England, grew up in Amherst -- not too far from the Miss Florence Diner. I couldn’t agree more with Mr. Mabius’ statement. The Miss Florence Diner never fails to fall into a “favorites” category when visiting this beautiful part of New England. Miss Florence Diner is located at 99 Main St., Florence (Northampton). Tel. (413) 584-3137. Located at the back of an auto dealership: the Miss Mendon Diner. The huge Imperial Cars auto dealership in Mendon offers an incredible variety of cars with one model you thought you would never see: an authentic dining car. Driving to the back of the lot past sales people and rows and rows of cars, you'll come across the charming Miss Mendon Diner. A classic Worcester Dining Car built in 1950, the Miss Mendon Diner has graced many different locations and names through the years -- including at its previous address in Newport, Vermont -- but seems to have finally found a secure home amidst the virtual city of cars for sale at Imperial. The location seems out-of-place for such an American institution best known as a standalone on our American highways, byways and downtowns. 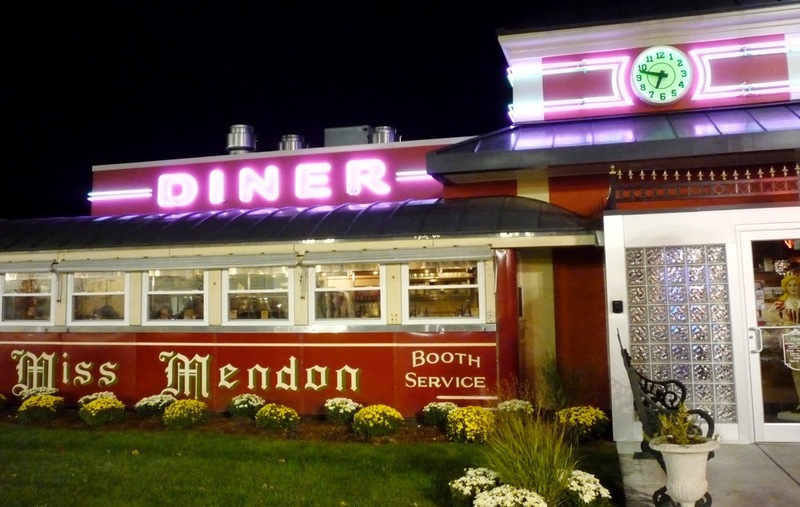 Aside from the unusual location, a professional kitchen in the back and an add-on dining room and a separate red-colored bus that serves as a seasonal ice cream parlor, the Miss Mendon Diner retains its innate roadside charm. That initial uneasiness of perhaps being approached by a commission-hungry car salesman (Imperial is really not like that, anyway) will subside once you see the welcoming neon "Miss Mendon Diner" sign and "Booth Service" graphic on the outside and the chrome, booths, counters and salt-of-the-earth service on the inside. Completely restored to its original splendor and spotlessly clean, the Miss Mendon Diner brings a bit of nostalgia into the 21st century without compromising its diner car traditions. The food offers true diner authenticity, too, with familiar breakfast, lunch and dinner items like pancakes, Belgian waffles, club sandwiches, homemade soups, meatloaf, beef stew, chicken pot pie, chicken fried steak, burgers, hot dogs, shakes, floats, ice cream sundaes, and homemade pies. Miss Mendon serves breakfast all day, thank goodness, as some diners have, unfortunately, ditched this policy. We had on our first visit for dinner delicious Belgian waffles, chocolate chip pancakes, a meatloaf plate with fresh carrots and real mashed potatoes. We'll be back soon to this fantastic, little diner in a very unlikely location. Miss Mendon Diner is located at 16 Uxbridge Rd., Mendon. Tel. (508) 634-3000. Web site: http://www.missmendondiner.com/. Classic dining car beauty: Moran Square Town Diner in Fitchburg. We￼will forgo the “Interesting Tidbits” section here, as anecdotes hold an important role in the history of the Moran Square Diner. 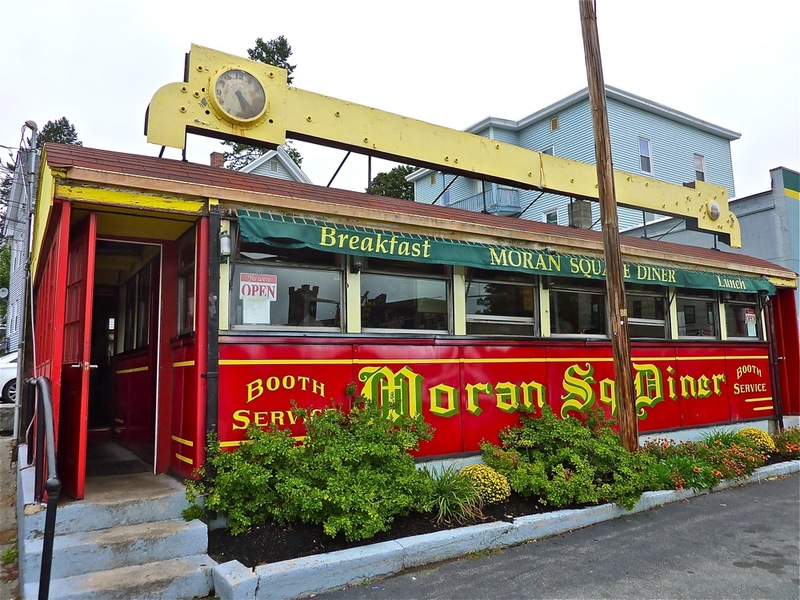 Perhaps the only diner in the world to be named after a Major League Baseball player, Moran’s moniker comes from Fitchburg native Pat Moran who was a catcher for 14 seasons in the early 1900s. He also served as a terrific manager, leading the 1915 Philadelphia Phillies and 1919 Cincinnati Reds to National League Championships. The 1919 team faced the Chicago White Sox, making dubious history in the World Series as eight members of the Sox team were charged in throwing the game -- thus, creating the Black Sox scandal. Pardon the digression, but Moran was an underrated manager going 748-586 and having the 20th highest winning percentage, at this writing, in Major League Baseball history. He should, arguably, be in the National Baseball Hall of Fame. 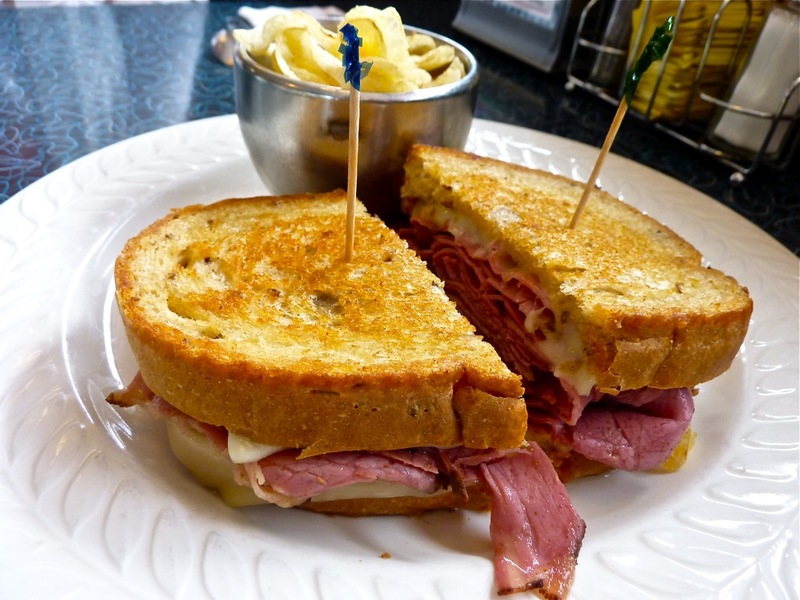 With that lineage in mind pertaining to the Moran Square Diner, this local treasure seems to hit a home run with several meals with French toast, including perfectly-cooked eggs and pancakes, and the “Thursday special” corned beef and cabbage dinner. 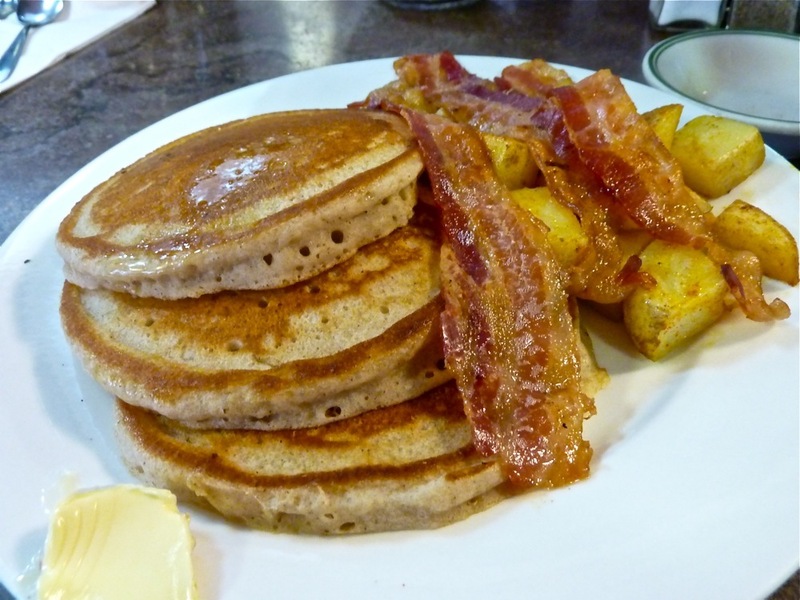 Apple cider pancakes with bacon and potatoes from the Moran Square Town Diner. I’m not a coffee drinker, but word has it that the coffee rises well above the standard diner quality, Couple a cup of java with newspapers available to read, friendly folks ready to talk, cheap prices and service that is amongst the most personable and efficient in this genre, and you have a really good diner experience! Owners Chris and Mary Giannetti work their tails off, know the culinary profession well, and know even better the customers that keep Moran’s in the “Little Caboose That Could” category -- that is, an unassuming little place that comes up big-time in so many dining out ways. The husband-wife team is truly an integral part of their hometown. Additionally, it’s not just the locals that keep the Moran Square Diner thriving, but also well-know public figures like the late Sen. Ted Kennedy, former Massachusetts Senator Scott Brown, and conservative local media icon “VB” who have stopped by to have a bite. American print and broadcast journalist, Mike Barnicle -- a Fitchburg native -- has frequently used the phrase, “The people at Moran Square Diner” when referring to the working class. Ultimately, though, it is the everyday people of this small city that support the Moran Square Diner with crowds coming in -- especially for a hearty Sunday morning breakfast. Moran Square Diner looks and feels like a real diner! Like so many diners, being in the presence of history makes a meal taste that much better. There’s something comforting knowing that a tiny red and yellow-painted 1940 Worcester Dining Car with booths, counter and stools, barrel-shaped ceiling, a wall menu behind the counter, and the checkered floor has outlasted bigger and fancier places and failed fast food franchises through the years. For many, the Moran Square Diner is like a best friend forever with many stories to tell. Chris Giannetti told me that in the early 2000s, the previous owner and a local doctor had a running bet on whether the Red Sox would ever win a World Series. The doctor said that if the Sox were to ever win the World Series that he would give the Moran Square Diner owner a bottle of champagne. The doctor, unfortunately, became ill, and the Sox won the World Series. On his deathbed, the doctor told his son about the bet. “When the Sox won, I found a bottle of champagne outside the diner!” said Chris, thus confirming the won bet. In the long run, the Moran Square Diner stories, the history, and the food deserve hall of fame status in the diner world. Be sure to check out this classic diner when in northern central Massachusetts! Moran Square Diner is located at 6 Myrtle Ave., Fitchburg. Tel. (978) 343-9549. Facebook page: https://www.facebook.com/Moran-Square-Diner-120823941286565/. Morin's Diner has been a staple in Attleboro for more than 100 years! Morin's Diner looks and feels like the prototype for an old-time diner, but it is actually part of a larger business. Waking past the counters and booths, you step down into Morin's Hometown Bar and Grille first seeing a nice-looking dining room with bar -- a good-sized space with lots of elbow space and just as many people dining as in the diner. Beyond that, a pool room leads to a historic-looking, rather isolated dining area with high wooden-plank ceilings, exposed brick walls, two levels of dining and an overall quaint feel. It's all good, but I like the comfy, no frills vibe of the diner best. Everything at Morins is delicious, abundant and created with some culinary flair far above the diner norm.You can't go wrong here with a home-cooked roast turkey dinner, spinach and artichoke dip, some homemade baked mac and cheese and blueberry pie with vanilla ice cream. 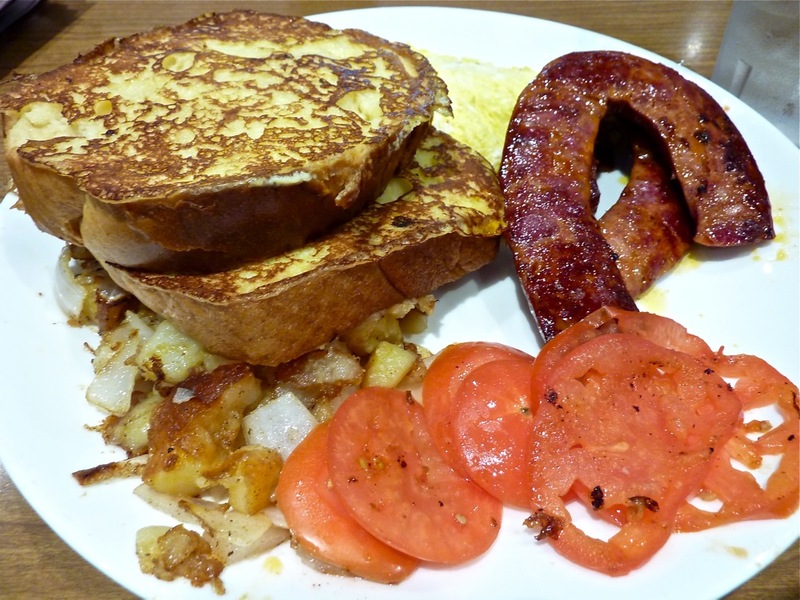 Recently, I had an amazing Portuguese breakfast special with linguica, Portuguese French toast, scrambled eggs, onion home fries, and tomatoes. The mouthwatering breakfast could have served two, so a doggy bag was in order! Portuguese breakfast special at Morin's Diner. Morin’s is so good at so many things that it’s no surprise that Guy Fieri, of the Food Network, featured Morin's Hometown Bar and Grille in November 2009 on his Diners, Drive-Ins, and Dives show. Mr. Fieri highlighted what we already knew about the amazingly tasty French meat pie, the Fisherman's Stew ("today's fresh fillet," bay scallops, mussels, baby clams, tomatoes, and bliss tomatoes in a spicy, tomato broth) and the boiled corned beef and cabbage dinner. This is my go-to place in Attleboro. I have never had a bad meal here and the service is always quick, dependable and friendly. Owner Billy Morin is a dedicated on-site owner, out there talking with the customers, cooking, managing the restaurant, working the catering end of the business, and walking around with a purpose that could only suggest pride of ownership. What geat work ethic! Also recommended: the tender BBQ steak tips, the huge portion of fish and chips, the half-pound burger, Yankee pot roast, homemade meatloaf and chicken pot pie. Morin's recently celebrated its 100th year in business. I have talked with many Attleboro residents (old, young, in between) and in the past, members of the local 368th Engineering Battalion "B Company" (U.S. Army) and they have all raved about Morin's. In a way, Morin's reflects the hard-working common folk and patriotic spirit that I have personally seen amongst so many Attleboro residents. They go when not feeling like cooking a meal, when in search of a good bargain, meeting with a good friend, and if the appetite has gone into overdrive. Morin's is an American success story, starting as a tiny cable car to now seating more than 250 people. It's remarkable that Morin's survived the Great Depression, the demise of the once robust local jewelry industry, and the development of malls and commercial endeavors along nearby Route 1. Whatever level of downtown restoration takes place -- and it has been impressive in the past 10 years -- we look to Morin's as always being a historical cornerstone of this proud city. One such tidbit was that of the 73,000 pies his grandmother baked for the restaurant for more than 20 years, many were made from her home, while raising six children. Another was that of the Thanksgiving Day when the Morin's mouth-watering turkey was snatched before the family's very eyes — only moments before they were ready to dig into it. As part of the family's catering business, the Morins made and delivered many turkeys, complete with gravy and stuffing, every Thanksgiving. On this particular Thanksgiving, it seems one customer decided to let her turkey cool on the porch until they were ready to eat it, which had a direct effect on the Morin family, as they were about to eat their Thanksgiving turkey, according to Bill Morin. “ We get a frantic phone call,” Morin said, recalling the incident. “ The dog had eaten the (woman's) turkey. What does my father do? He takes the turkey off the table, brings it down and delivers it to this lady. That's the way my father was,” he said. 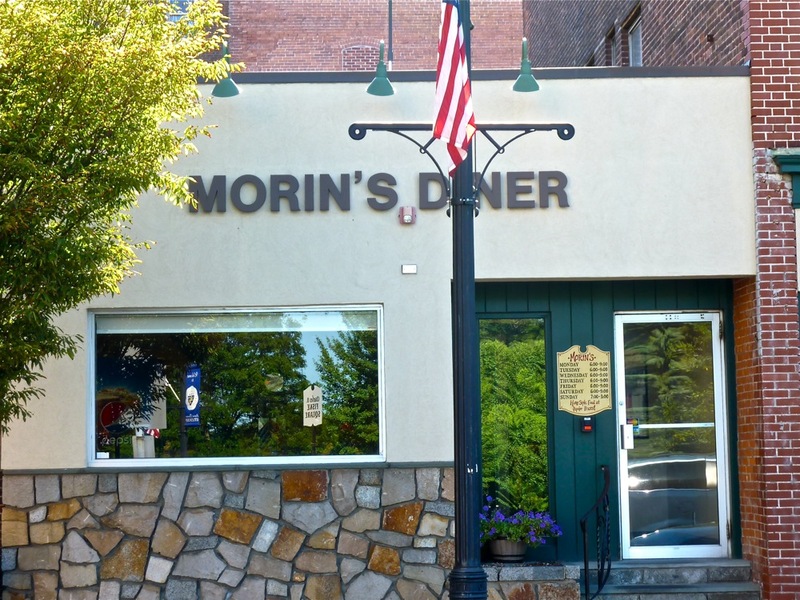 Morin's father was Russell Morin Sr.
Morin’s Diner is located at 16 South Main St., Attleboro. Tel. (508) 222-9875. Web site: http://www.morins1911.com/home.aspx. Patriotic look at the New Yorker Diner in Watertown. Sadly mistaken for a place just catering to drunk college students late at night (open late Friday and Saturday nights), The New Yorker Diner is so much more than that. No matter what the crowd, it’s the food, diner atmosphere, rock bottom prices, and consistently friendly, efficient service that stand out. Sticking to basics and not veering too far into the newfangled gourmet selections that other diners have employed, the New Yorker is the place to go if you like bacon, eggs, home fries, BLTs, burgers and clubs. The scali French toast is a gem. This might be your typical diner, but that's OK, as the basics-done-right approach is what draws us to diners in the first place! 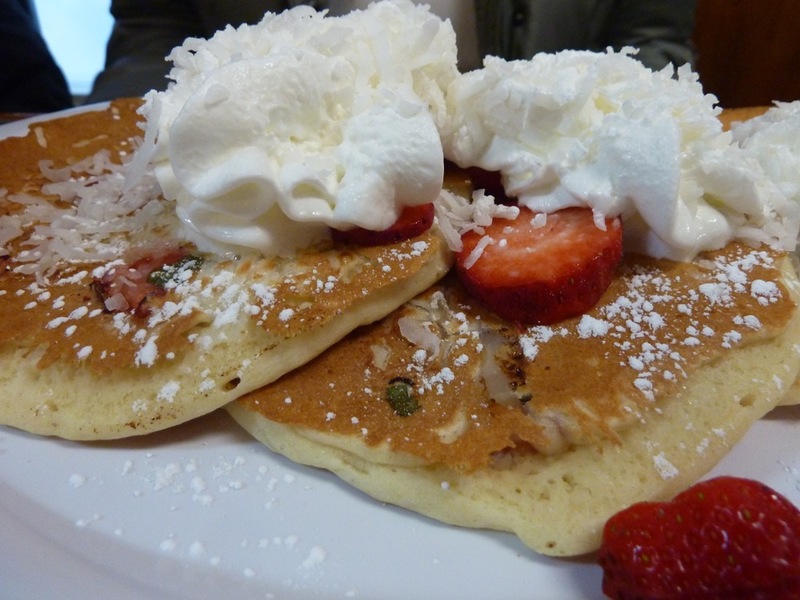 Good downtown eats: the Off Broadway Diner in Taunton. Locals know and love this diner right off the beautiful, historic Taunton Green, but those outside the area are not familiar with what is one of the best diners anywhere. That’s too bad as this downtown Taunton restaurant has been bringing in regulars for more than 20 years. With Portuguese touches in its cuisine and a real dedication to creating authentic diner food for breakfast, lunch and dinner, the Off Broadway Diner is one of those diners that delivers on every level -- friendly service that makes you feel right at home, huge portions of food at low prices and a comfortable, small familiar diner ambiance that takes us away from bustling urban Taunton scenes noticeable just a few steps outside. On my last visit, I had a Portuguese steak sandwich - wonderfully seasoned -- with a fresh vegetable mix, Portuguese bread and a tangy dipping sauce. It’s one of those dishes you don’t forget -- and one you could pay twice as much as a higher profile urban restaurant. Many that come here also swear by the Portuguese sweet bread French toast with a side of homemade corned beef hash. Portuguese steak sandwich from the Off Broadway Diner. Since my last visit, a new owner, Tino Farese has taken over this local favorite diner -- he has kept the popular dishes intact, including Portuguese specialties -- but has added many homemade Italian meals to the mix. That’s no surprise as Farese worked since 1968 at the Verona Restaurant in Watertown, Mass., which was owned by his family for generations (it is now closed after a great run). Having worked in Watertown many years, I loved the Verona and feel that Farese’s presence at the Off Broadway Diner can only make a great thing even greater. This is truly a real hidden gem diner for those not from Taunton and a terrific regular stop for those living in this small southeastern Massachusetts city! It is one of the great mysteries why this diner hasn’t made any mainstream media ‘best of” lists, but it’s got my vote here. 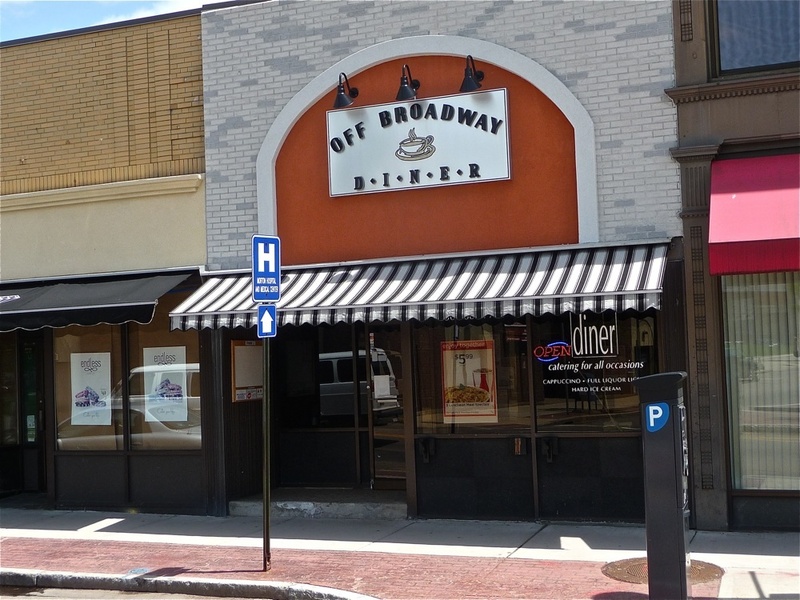 The Off Broadway Diner is located at 19 Taunton Green, Taunton. Tel. (508) 880-7700. Web site: https://www.facebook.com/Off-Broadway-Diner-283253323986/?rc=p. This old diner now serves as a bar inside the Red Wing Diner in Walpole. 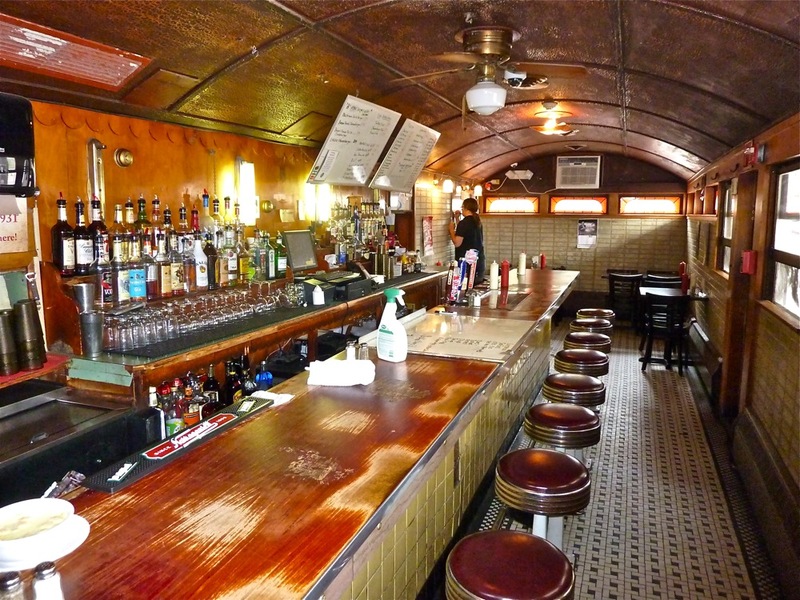 The 1933 Worcester Dining Car that is embedded as a bar into the Red Wing Diner restaurant still looks as ancient as ever, and is truly a thing of beauty -- virtually untouched and true to form unlike most other historic dining cars that have been totally renovated. The weathered wooden counter and red stools, barrel-shaped ceiling, old tile floors and orange stained glass around the windows lend an authenticity that you just won’t see that much anymore in diners. It’s like the unedited version of a movie. The Red Wing Diner dates back to the early 1930s and recently renovated the rest of the restaurant with new flooring, tables and a fresh-looking exterior after many years of staying with the old tile floor/formica table look. It all looks good, but for you diners fans, you just have to check out the dining car section! Like most bars, you can order food there -- and the great news is that the food is generally phenomenal. 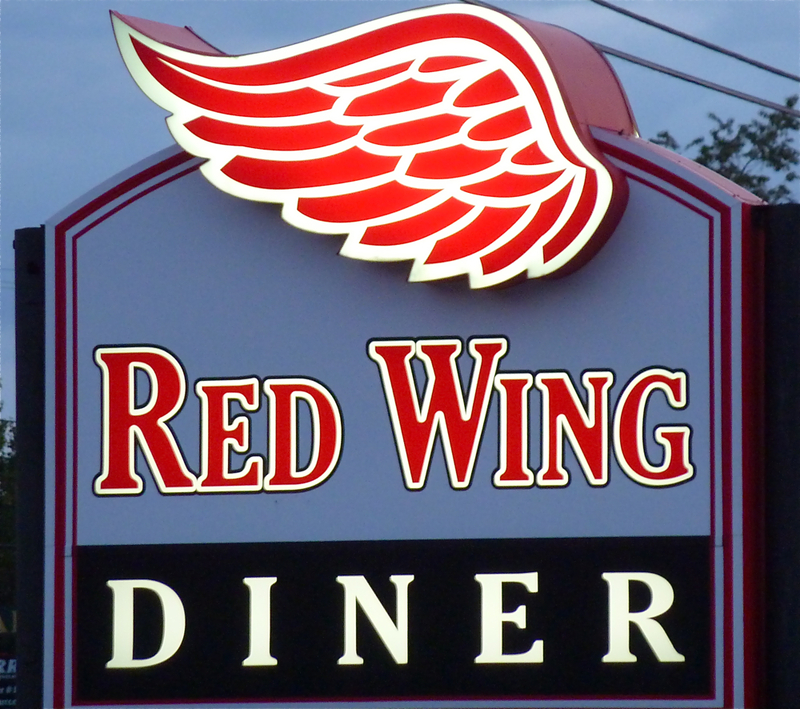 The Red Wing Diner serves classic, old school suburban, Italian-American lunch and dinner selections in large portions with quick, efficient service, and great value for the money in a family-friendly setting. You won't find better whole belly fried clams, clam strip rolls, homemade onion rings, New England clam chowder, fisherman’s platters, freshly-carved roast turkey dinners, baked salmon, marinated steak tips, fried chicken, burgers and lobster rolls in the Boston suburbs. The homemade heavy-on-the-cheese, loaded-with-toppings South Shore-style bar pizza is a real winner, and a Greek salad transcends the generic house of pizza kind with mixed greens, plenty of feta and a nice tasting Greek dressing. The Red Wing also serves excellent Italian-style meals like chicken parmesan, shrimp scampi, and grilled linguica over pasta and topped with marinara sauce. Fried seafood platter from the Red Wing Diner. The waitresses have personality, are quick on their feet, seem to have good peripheral vision if you need their attention, and deliver your food in quick fashion -- just like a diner should. Desserts are phenomenal, including blueberry and Boston Cream pies, chocolate cake and some good tasting ice cream. There’s something to greatly admire about a restaurant that has been in business for more than 80 years with only a few ownership changes. Harvey Ernstrom opened the Red Wing in 1931 and it has been owned by the Murphy family (currently Liam) since 1952. Great grandparents, grandparents, parents and the newest generation have loved the Red Wing which is still thriving to this very day -- including that glorious embedded diner! 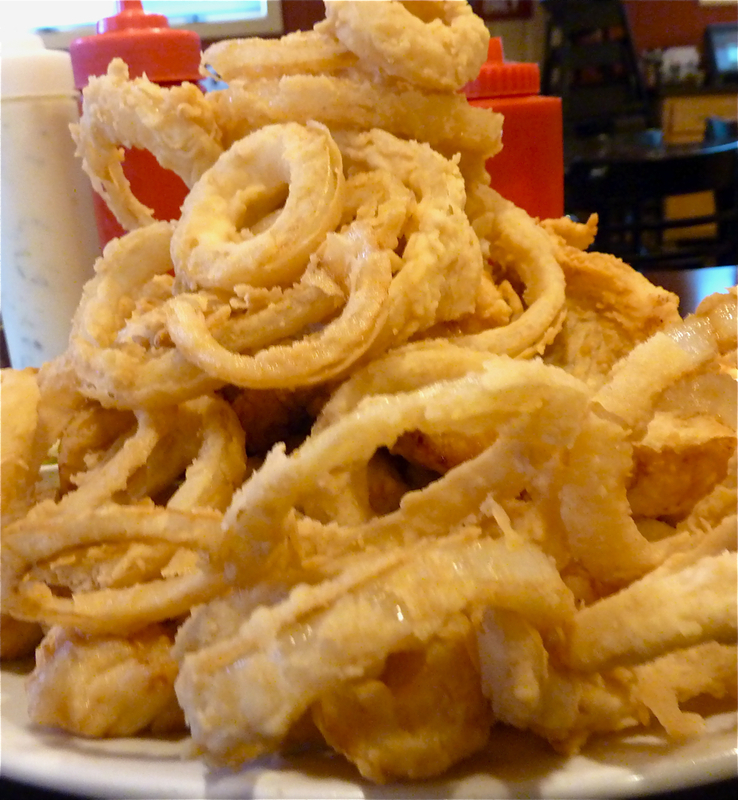 Interesting Red Wing Diner tidbit: The Red Wing goes through an average 350 pounds of onions a week or over nine tons a year to make its homemade onion rings, according to a Red Wing Diner Facebook post (https://www.facebook.com/190024069611/photos/a.202206629611.162489.190024069611/10154115745664612/?type=3&theater). Davis Square, Somerville staple: the Rosebud. The only diner in this book without the word "diner" in its name, the Rosebud American Bar and Grill, nevertheless, still counts as a diner as it is located in a beautifully restored historic semi-streamer Worcester Lunch Car. Sure, the Rosebud veers away from its former pure diner experience with “breakfast only” occurring on weekends in the form of brunch, a bar presence, an “un-diner” appeal that brings in fans of BBQ dishes and whiskey, and a lunch and dinner menu that includes some upscale selections that you'd find in more trendy restaurants. Nothing wrong with any of that, though! The diner look is still intact and staples of this genre remain including bottomless coffee, burgers, country fried steak, mac and cheese meatloaf, and fish and chips. 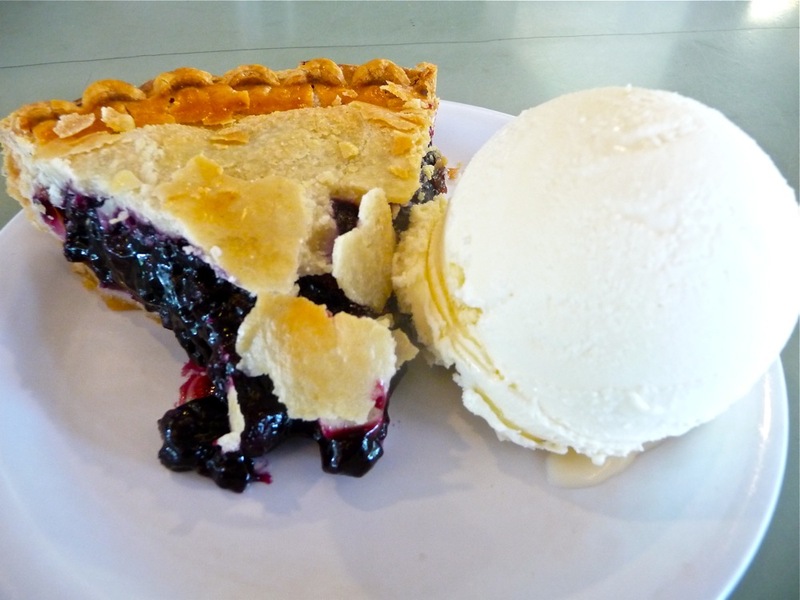 Homemade pies also help carry on the diner tradition with daily special selections like blueberry crumble, Dutch apple, chocolate cream, banana cream and key lime. The jambalaya is highly recommended with its delicious mix of carolina rice, chicken thighs, grilled shrimp, okra and linguica. 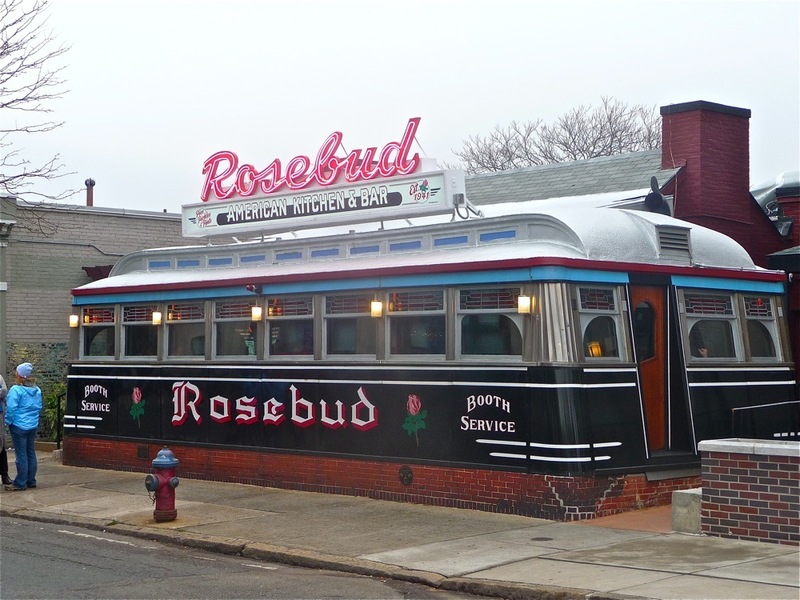 Interesting Rosebud moments: The Rosebud is an especially rare find, being one of seven Worcester Lunch Car Company semi-streamliners remaining in the country, according to a Feb. 7, 2013, article in the Boston Globe entitled Historic Somerville diner being sold (https://www.bostonglobe.com/metro/2013/02/07/rosebud-diner-somerville-changing-hands/TNNAssBxtt2IwkSwgWZQML/story.html). Rosebud American Bar and Grill is located at 381 Summer St., Somerville. Tel. (617) 629-9500. Web site: http://www.rosebudkitchen.com/. No frills is the best way to describe the Whatley Diner, and that’s a great thing. The food is straightforward, service based on the old days when people were more social, and the design and decor void of any pseudo, phony, modern diner inklings. The Whatley Diner comes across, upon first glance, as a truck stop diner operating around the clock with a gas station on the premises, trucks all over the place and truckers refueling with hearty meals for the long haul. Neon, chrome, a big jukebox at the front entrance and smaller ones at each booth, and a classic diner exterior with a huge “Diner” sign confirm the authenticity. The style of this great-looking diner is called a “Princess” that was built in 1958 by the Kullman Company in New Jersey. Originally located in nearby Chicopee, Massachusetts, where it was known as the Princess Diner, the dining car was eventually moved to its current location by F.L. Roberts Company (which currently operates the gas station on the premises). Originally, the diner was known as The Maverick in Whatley, but that name left town, presumably at sundown, of course, and it has been known ever since as the Whatley Diner. https://ctt.ac/eIa1K ' Corned beef hash is a signature dish, but the popular offerings go way beyond that with daily blue plate specials like Yankee Pot Roast, Shepherd’s pie, American chop suey, turkey dinners and fish fry. Just about any traditional breakfast is available with 13 different types of omelets, as well as pancakes, French toast, corned beef hash and the classic “Heavy Hauler”: three eggs any style, two pancakes, bacon, sausage, and toast and hash browns or home fries (and you can “wash it down” with biscuits and gravy for an additional price). Lunch follows the classic diner template, too, with burgers, tuna melts, grilled cheese, chili cheese dogs, clam rolls and chowder, and meatloaf and club sandwiches. Dinners also stay faithful to the traditional diner menu including beef liver, fried chicken, mac and cheese, homemade meatloaf dinner, and chicken fried steak. Desserts generally center around pies (they make a tasty blueberry), cakes, ice cream, strawberry shortcake and root beer floats. 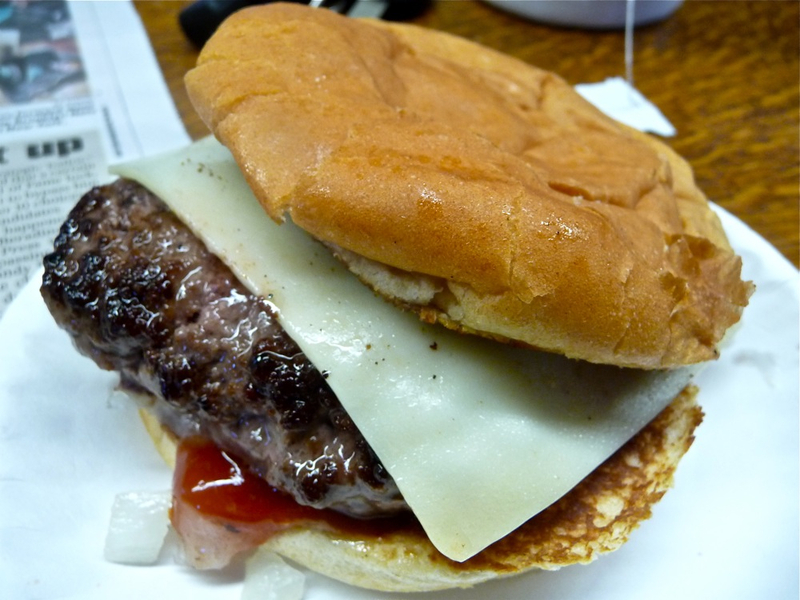 Occasionally, the Whatley Diner gets a little adventurous, as evidenced by a recent burger special with bacon, onion and cheddar cheese and... get this... peanut butter on a kaiser roll! I would order that in a Jiffy! Once again, sorry for the bad pun. Blueberry pie from the Whatley Diner in Whatley. Interesting Whatley Diner tidbits: Staying true to form hasn’t detracted from business at the Whatley Diner as about 2,000 customers stop each week by for some hearty meals, according to Moulton. Taking a look on the menu reveals that some of those customers that have dined at the Whatley Diner are quite well-known including Jason Robards, Ernest Borgnine, Christopher Reeve, Michael Douglas, Matt Dillon, Susan Lucci, Chris Farley, B.B. King and The Beastie Boys. Actor Eric Mabius told me that he loved going to the Whatley Diner when growing up in nearby Amherst because of its 24/7 status. A scene from the motion picture in 1999’s In Dreams starring Annette Benning and Robert Downey, Jr., was filmed at the Whatley Diner! A 1998 USA Today article cited the Whatley Diner as one of the top 10 diners in the United States. Whatley Diner is located at 372 State Rd. (Routes 5 and 10), Whatley. Tel. (413) 665-3696. Web site: https://www.flroberts.com/ourbrands/whatelydiner/. Billing itself as "The Ultimate Diner Experience," that slogan proves that there is sometimes truth in advertising. 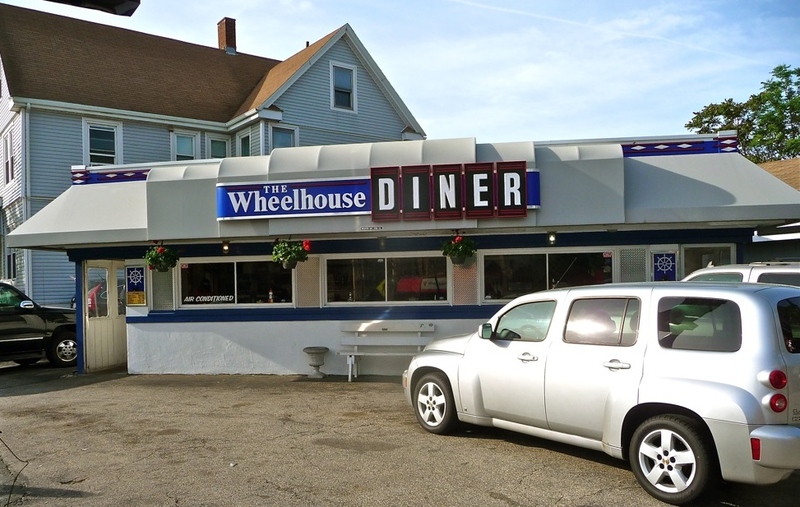 A long-time Quincy, South Shore old school favorite and historical landmark that dates back to the 1940, The Wheelhouse Diner offers no real surprises but many smiles for breakfast and lunch. I have been to the Wheelhouse only twice but those two visits had a big diner experience impact. They seem to do all the right things that we come to expect in a diner: ample portions of tasty food, low prices, and quick and friendly service. The corn beef hash is unbelievably good! Other favorites includes the waffles, burgers, chowders, homemade soups and beef stew. The Wheelhouse Diner is quite small with a limited number of booths and a standard small diner-size counter, so there's the possibility of a long wait -- but it's worth standing in line for the authentic diner experience and excellent homestyle comfort foods. Cash only! Old School Waltham exists at Wilson's Diner. Not too many good, old-fashioned diners exist in the Boston suburbs, so what a revelation to rediscover Wilson’s Diner. Yes, rediscover. Back in the day, we took places like Wilson’s for granted because they were so commonplace. Now, with so many diners gone or becoming too gentrified, Wilson’s stands out just for weathering out the many restaurants trends, consequently surviving and staying true to form. There’s simply no denying a food destination that does a great job at serving lots of food at low prices and an establishment that probably knows the names and faces of many people after their second or third visit. They bring in a significant local crowd, including townies, business people from in and around the Waltham “technology belt,” families and Bentley College students. 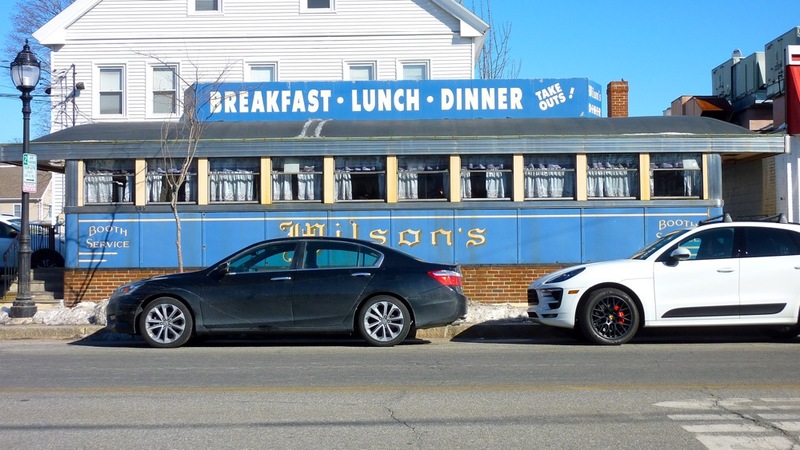 A classic 1949 Worcester Lunch Car at this location since 1949, Wilson's Diner not only features homemade breakfast and lunch selections but also a stainless steel door, a full-length marble counter, plenty of counter stools and old wooden booths. Listed on the National Register of Historic Places in 1999, there's no doubt that Wilson's is a true, authentic New England diner. Wilson's also offers a Greek touch with dishes like a gyros and feta, lamb souvlaki sandwich, Greek locanico (basically Greek sausage) and feta cheese omelet, and homemade baklava. Wilson's is the place to be if you like great coffee, filling breakfasts, good sandwiches and fast service. Cash only! 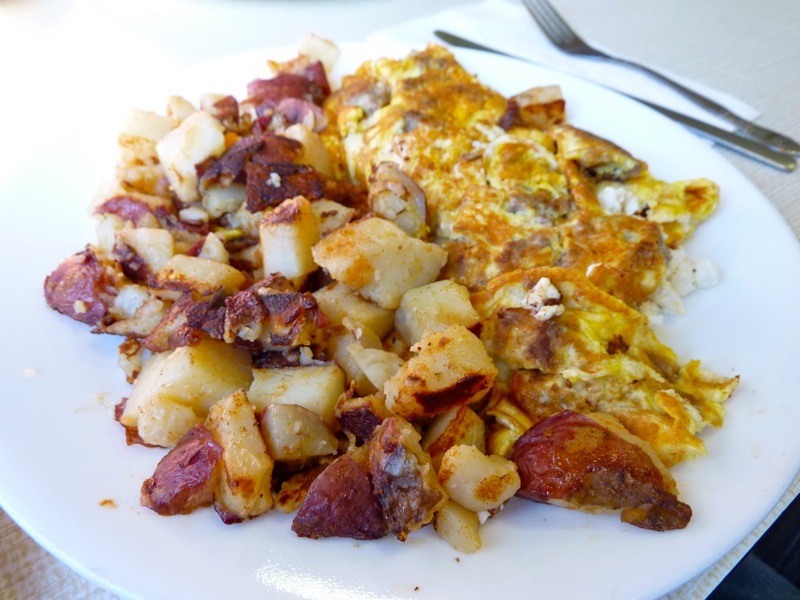 Wilson's Diner breakfast gem: Gyros and feta omelet with home fries. Wilson’s Diner is located at 507 Main St., Waltham. Tel. (781) 899-0760. 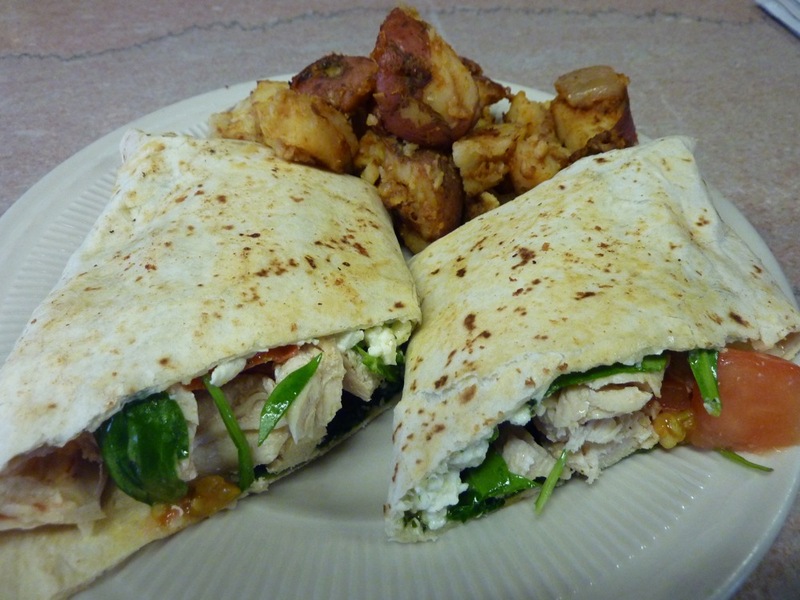 Chicken wrap from the Yankee Diner. The Yankee Diner does a better job than some of the high profile diners who think they are really good. As expected and desired in a classic diner, the Yankee Diner feels like a home away from home with lots of locals talking it up, on a first-name basis, over the latest (and not so greatest) news in the Charlton area at one of the booths or at the counter in this small-sized diner. This is really a fantastic diner for those in search of excellent comfort foods, located not too far off the Massachusetts Turnpike in the Worcester and Sturbridge areas! Yankee Diner is located at 16 Worcester Rd. (Route 20), Charlton. Tel. (508) 248-2093. Joey's Diner looks so inviting from every angle. It isn’t a historic diner and sports a large dining room, but Joey's Diner, nevertheless, captures the 1950s diner look and feel with its nostalgic decor, jukebox favorites, collectibles everywhere you look, and American classics like meatloaf, homemade chicken pot pie, burgers, hot dogs with grilled and buttered bun, American chop suey, Monte Christo, clam roll, club sandwiches, and roast turkey dinner. It’s one of those places that knows the type of food and ample portions just right for the customer in tempting presentations that you would see on television restaurant or food shows. 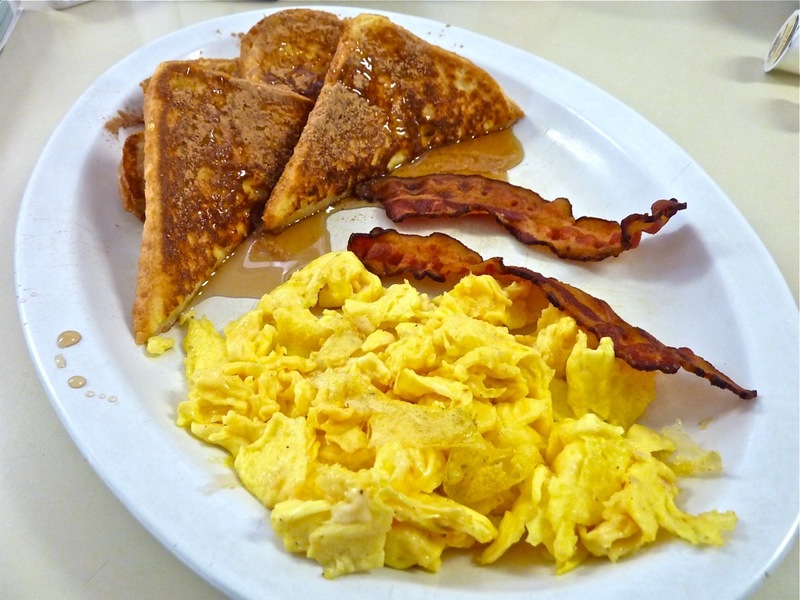 Perhaps the strongest selling point, however, is breakfast served all day with all the diner standards on the menu -- eggs any style, pancakes, waffles, French Toast, crepes, corned beef hash, bacon, muffins (try the grilled blueberry with butter! ), and bagels. The dessert selection is always impressive, too, with hard and soft serve ice cream, blueberry and coconut cream pies and apple crisp. 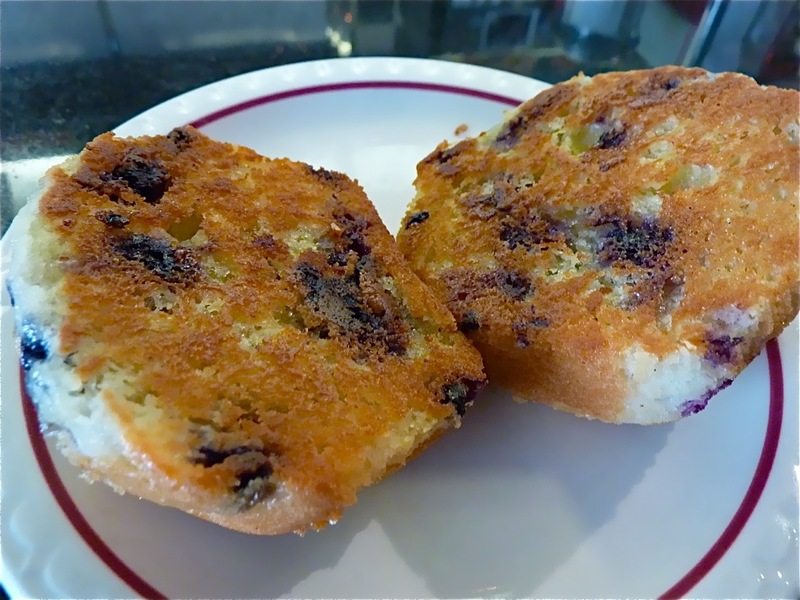 Grilled blueberry muffin from Joey's Diner. Joey's pays tribute to the tradition in a fun, likable way with its chrome, neon, booths, counter and tile floor and efficient waitresses quick on their feet. Joey's also wins brownie points for being spotlessly clean -- not always guaranteed at all diners. 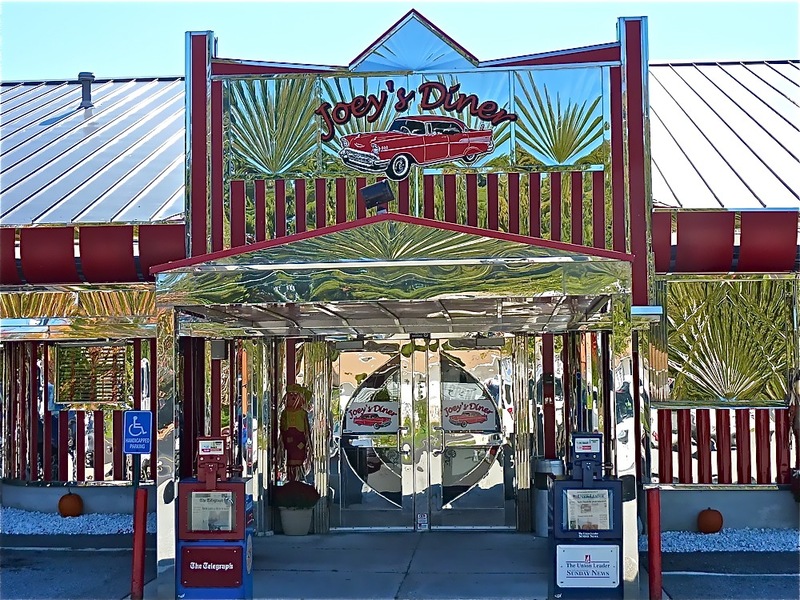 Some diner purists might scoff at Joey’s being included in the book since it could be considered more of a restaurant, but, to me, Joey’s is a terrific diner choice when in the Nashua area as evidenced by people of all ages enjoying the place. Plus, they really seem to make customers feel at home with genuine staff and conversation! Lindy's Diner at night. Photo credit: Mindy Cambiar, BigChillAdventures. 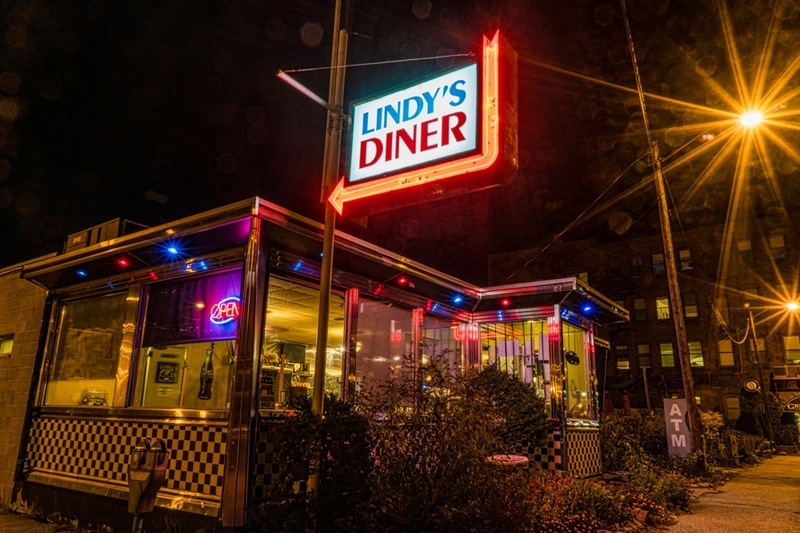 A Paramount-style diner manufactured in New Jersey and transported to Keene in 1961, Lindy's Diner is a virtual household name in this great, small Monadnock Region city (one of my favorite downtowns in all of New England). Many presidential candidates and their well-known endorsers have been to this delightful neon and chrome diner during campaigns, but it is the hundreds of thousands of customers through the years that have kept old school Lindy's thriving to this very day. Best known for its New England clam chowder, cheeseburgers, homemade macaroni and cheese and Salisbury steaks, Lindy's is without a doubt a beloved landmark amongst locals, travelers and Keene State College students for breakfast, lunch and dinner who love comfort food served cheap, fast and delicious. Additionally, each table has a mini jukebox! Interesting Lindy’s Diner tidbits: Politicians seem to love to mix it up with the salt-of-the-earth New Hampshire people dining at Lindy’s. The Lindy’s Diner web site states, “It is rumored that if you do not visit Lindy’s Diner as a presidential candidate, you will not win the New Hampshire primary.” Some famous politicians who have visited Lindy’s: Ronald Reagan, Barrack Obama, George Bush, George W. Bush, Bill Clinton and Chris Christie, according to Criss. “We like to say, ‘It’s where politicians like to meet the real people,’” said Criss. Lindy’s Diner has also been featured on Channel 5, WCVB TV’s Chronicle. Fritz Wetherbee, of WMUR-TV Channel 9‘s New Hampshire Chronicle, has also been to the diner, as well as the late actor, Hal Holbrook. Lindy’s Diner is located at 19 Gilbo Ave., Keene. Tel. (603) 352-4273. Web site: http://www.lindysdiner.com/. Downtown delight: Littleton Diner in Littleton, N.H. Photo credit; Littleton Diner. There was a time when many small towns with an established downtown seemed to have a diner but thanks a lot to fast food chains, we no longer have as many. 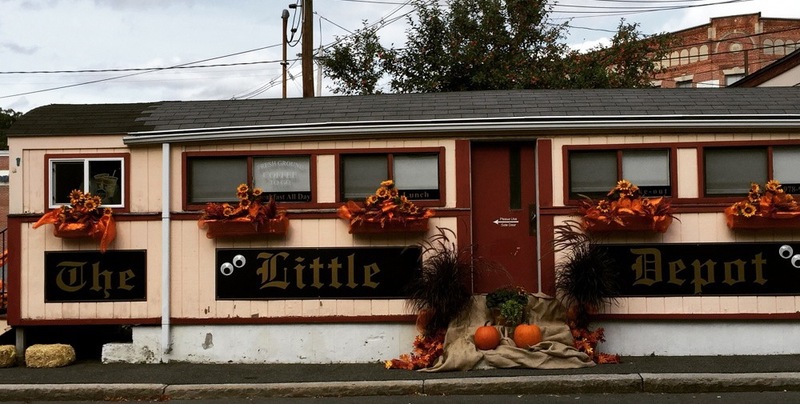 Thankfully, the Littleton Diner successfully remains a dining car treasure in of New England's great small town downtown districts. The Littleton Diner is one of those places that seems like such an important part of the community, given that it's roots here go back to 1930. Interesting Littleton Diner tidbit: 2016 U.S. Democratic presidential candidate and former Secretary of State Hillary Clinton stopped by the diner in late October 2015 to chat with staff and customers. Many political figures, in fact, have visited for a hearty diner meal at the Littleton Diner, according to its Celebrity Guests through the Years page (http://www.littletondiner.com/celebs.php) including Mitt Romney, John McCain and John Kerry. Steve Forbes, a publishing executive, editor-in-chief of Forbes Magazine, and former Republican presidential candidate, also stopped by here, too! Littleton Diner is located at 145 Main St., Littleton. Tel. (603) 444-3994. Web site: http://www.littletondiner.com/. Right away, five joyously overwhelming observations reveal the Miss Wakefield Diner as a real diner: the classic dining car exterior, the old-time jukebox in the entrance area, the crowds of people filling the diner car, coffee always on the burner and waitresses bringing out, and balancing on their hands huge portions of picture-perfect, homestyle comfort foods. There's also an unusual attention-getter out front: a big moose statue that reflects the moose population of around 3,500 in New Hampshire (about 1,050 people reside in Sanbornville). I personally think that the moose signifies that the Miss Wakefield Diner is head and antlers above other diners! 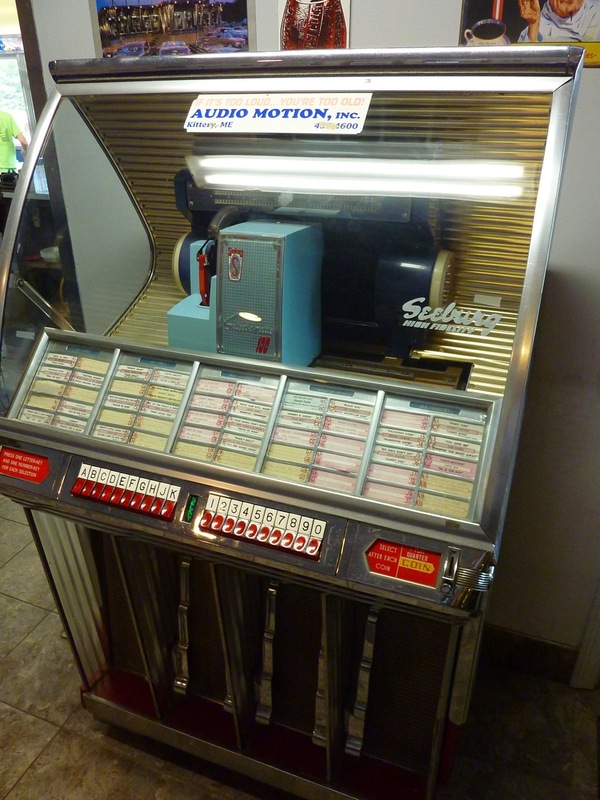 Jukebox at the Miss Wakefield Diner. After seeing these clues of heartwarming diner authenticity (moose aside), the rest of the time can be spent focusing on actually enjoying the hearty food, sipping on a cup of coffee, connecting the personable service and friendly locals, and generally taking a break from the hectic world outside. 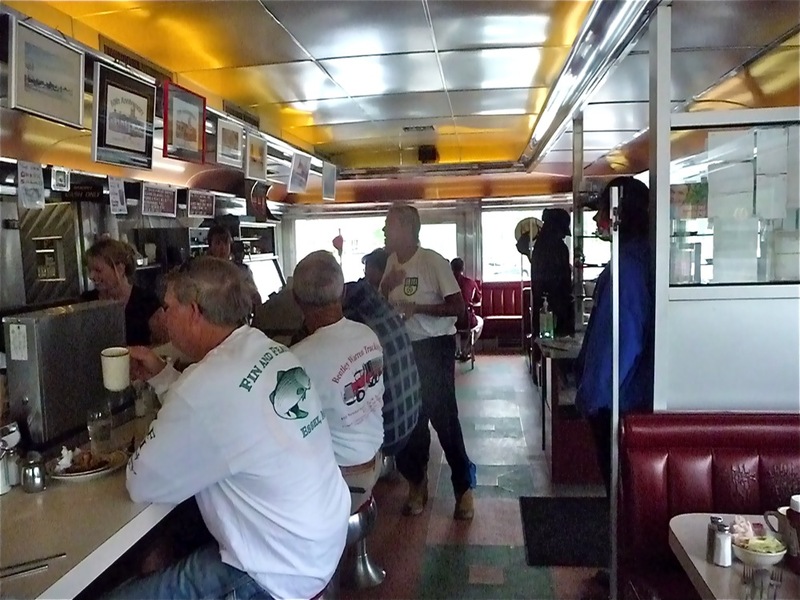 The Miss Wakefield Diner survives as one of the rare Jerry Mahoney-built diners. The journey had some challenges including closing at its original Albany, N.Y. location in the late 1960s after 20-plus years in business, and, sadly, landing in a junkyard, according to an article on the excellent Heart of New England web site at http://www.theheartofnewengland.com/travel-MissWakefieldDiner.html. Thankfully, the Diner eventually found new life in tiny Sanbornville -- a Wakefield neighborhood conveniently located on Route 16 between Portsmouth and Dover, N.H., and the White Mountains of New Hampshire. It's a beautiful diner with stainless steel ceilings and backsplashes, many windows allowing the sun to shine through and a long counter to seemingly accommodate the population of Sanbornville. 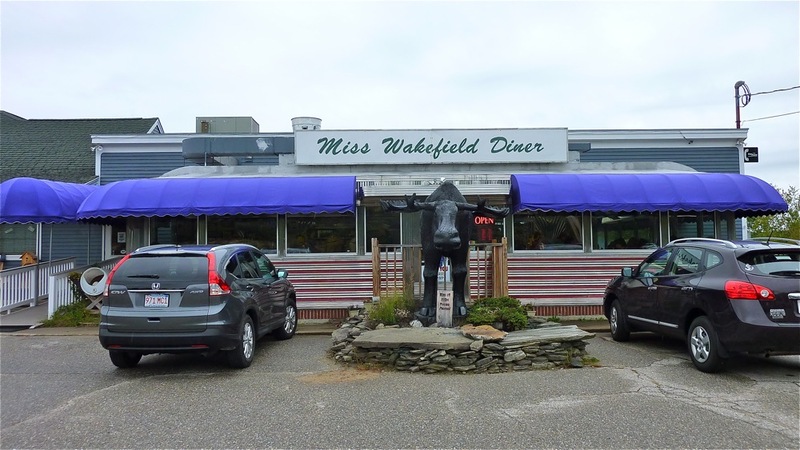 Given the location, the Miss Wakefield Diner brings in a significant year-round vacation crowd, in addition to its strong base of local customers. Additionally, the Miss Wakefield Diner shares another business in the same building: Gracie's Country Store with some nice regional gifts and a good old-fashioned candy selection. Hours vary depending on the time of the season, but the Miss Wakefield Diner is primarily a breakfast and lunch spot with favorites like pancakes, burgers, club sandwiches, chili (outstanding! ), fries, shakes, apple crisp, homemade pies and specials like a huge, multi-stacked stuffed French toast with berries and cream. Interesting Miss Wakefield Diner tidbit: The Diner is not just about locals and vacationers: Pop star Justin Timberlake and actress wife Jessica Biel stopped by to "take pictures with and sign autographs for some of the employees," according to a New England Cable News post at http://bit.ly/2CjG0Qe. Talk about adding additional star power to the wonderful Miss Wakefield Diner! Classic diner good looks: Peterborough Diner. Initially, the Peterborough Diner, in all its modest ways, might seem like only a stop along the way but that would be a miscalculation. This small diner creates special dining memories in big time ways. Located in a beautiful New Hampshire town (so many fall into this category; what a terrific state!) in one of the state's most scenic regions (Monadnock), the Peterborough Diner is like a reliable old friend that is always there for you. Perhaps it is the welcoming 1950s Worcester Lunch Car diner car setting with its “green and cream” colors, the "hometown” favorites like French toast, mac and cheese, lasagna, Shepherd's pie, American chop suey and franks and homemade beans, the excellent kids menu, the pleasant outdoor patio seating or the treat-you-like family service that helps make the Peterborough Diner “The Diner with Distinction” as they modestly and humbly call themselves. Bacon, eggs and toast from the Peterboro Diner. Starting as a wooden diner in 1936, the Peterborough Diner has seen several different chapters in its storied local history, but one thing is for certain: the Diner has been an integral part of downtown Peterborough virtually since its inception. It’s the type of place locals will recommend if you are town and asking for a recommendation on where to eat. Waitresses treat out-of-towners just as well as the regular crowd -- very important, as not all diners as much an appreciation to visitors, although they should. They are diners, after all! Additionally, the Peterborough Diner looks like it was born to reside in this quaint New England town. Some local businesses in a given town look out of place or contrived. The Peterborough Diner has that well-established look, like the wise old grandparent -- or, maybe in this case great grandparent -- that provides a strong, respected and revered family presence. Beautiful diner interior at the Peterboro Diner. Interesting Peterboro Diner tidbits: 44th U.S. President Barrack Obama once had a slice of blueberry pie at the Peterborough Diner, according to Michael Samuels’ New Hampshire’s Classic Diners article in nhmagazine.com (http://www.nhmagazine.com/February-2014/New-Hampshires-Classic-Diners/). 2016 Presidential candidate Bernie Sanders recently stopped by the Peterborough Diner to meet local, hard-working folks, including those who work at the Diner! Part of the 2006 indie movie Sensation of Sight was filmed at The Peterborough Diner! Peterborough Diner is located at 10 Depot St., Peterborough. Tel. (603) 924-6202. Web site: http://peterboroughdiner.com/. 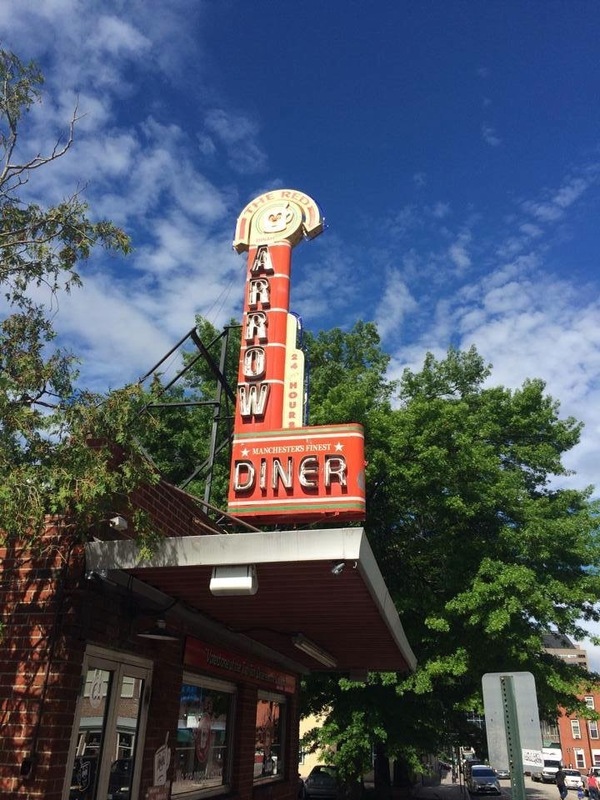 Manchester treasure: the Red Arrow Diner. Photo credit: Red Arrow Diner. Let’s cut to the chase: the Red Arrow Diner in Manchester is absolutely tremendous. It is everything a diner should be and with the history and commitment to culinary excellence to back it up. This legendary 24/7 diner definitely has a place at the top of any “Best of New England Diners” list! Good news, too: the Milford and Londonderry locations follow in that high quality mode. Politicians and celebrities seem to frequent the Red Arrow Diner when visiting Manchester, but much like the aforementioned Lindy’s in Keene it's the common folk that frequent this diner that dates back to 1922. Local conversations often take on an animated form with the consumption of coffee often serving as an energy-producing catalyst. This is a great place for pancakes, waffles, eggs, burgers, tuna melts, club sandwiches, Monte Christos, spicy chili, fried chicken, pork pies, meatloaf, bacon liver and onion, whoopie pies, fruit pies and cakes. My visits to the Red Arrow have usually involved the turkey dinner with stuffing and cranberry sauce -- it's the next best thing to a Thanksgiving meal! Red Arrow Diner features some of the best baked goods from a diner in New England. Interesting Red Arrow Diner tidbits: WMUR-TV, Channel 9 in Manchester, reported in a June 13, 2012, article entitled NH diner makes appearance in upcoming Sandler film (http://www.wmur.com/news/nh-news/NH-diner-makes-appearance-in-upcoming-Sandler-film/14795986), that Adam Sandler is a huge fan of the Red Arrow Diner: “Sandler is still a regular at the diner when he's in New Hampshire, but he's been coming to the Red Arrow for years. He even has his own booth and his own burger.” The Red Arrow Diner was recreated in a Marblehead, Massachusetts, toy shop for a set location scene in Sandler’s movie Grownups 2, according to WMUR TV. Many politicians seem to enjoy the Red Arrow Diner as much as Sandler -- 95% of the candidates have visited the diner – and some of them even twice -- according to the Red Arrow Diner web site. According to Heather Haddon who wrote the article, Trump ordered the Newton Burger, a Red Arrow Diner original with a burger topped with fried mac and cheese and cheese sauce between two grilled cheese sandwiches. On another interesting note, the Red Arrow might just be the first smoke-free diner in the country, having made the decision in 1998. The Manchester Red Arrow Diner is located at 61 Lowell St., Manchester. Tel. (603) 626-1118. Web site: http://www.redarrowdiner.com/. Counter, booths, tile floor at the Roundabout Diner. Photo credit: Roundabout Diner. The Roundabout Diner is a relative newcomer to the diner scene, as it took over this Bickford's Pancake House location in the early 21st century. Open for breakfast, lunch and dinner, the Roundabout looks and feels like an authentic diner and often takes typical diner food to the next level by prioritizing locally-sourced food made from scratch. 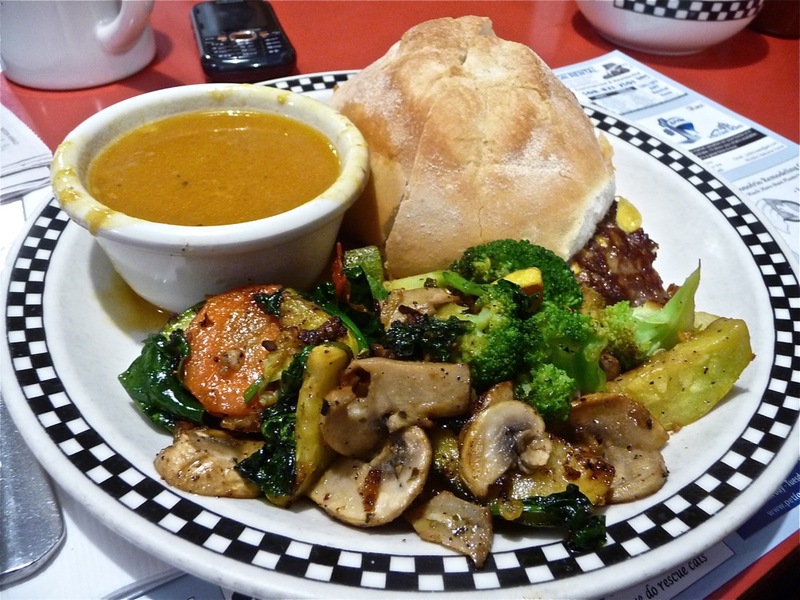 Sure, you'll find all the diner staples here like meatloaf, chicken pot pie, burgers, pancakes, waffles, omelets, frappes and sundaes, but also health conscious choices like gluten free vegetable soup, an artichoke tomato melt and spinach salad. 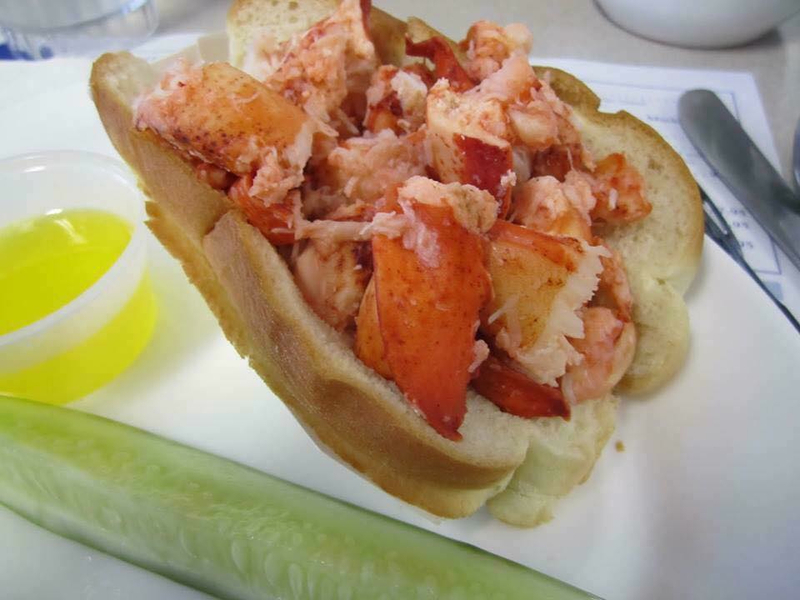 Expect a touch of Maine cuisine here, too, like lobster rolls, lobster club sandwiches, fish and chips made from local haddock, and wild Maine Blueberry pie. The Roundabout also features a lounge! 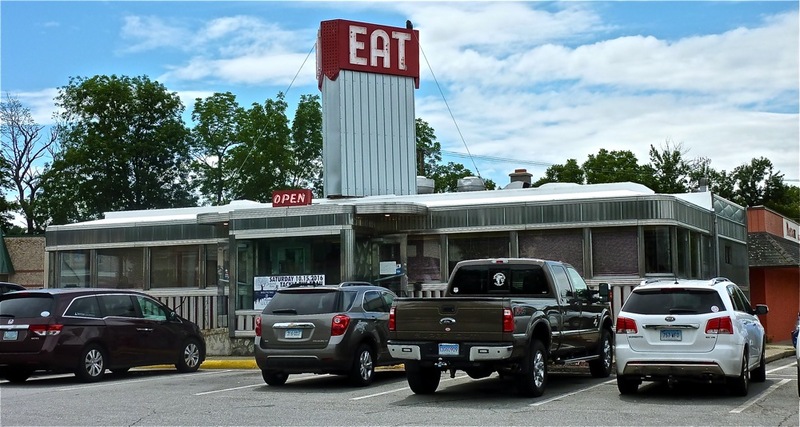 Owner Dan Posternak says that while his diner isn’t exactly out of the historic Worcester Dining Car mode, the respect to old time diners lives strongly and faithfully at the Roundabout. Posternak adds that it’s the “diner food with a twist” that also elevates the Roundabout. The diner offers a turkey meatloaf, uses a Challah bread from the well-known When Pigs Fly Bakery in Kittery, Maine, and employs an experienced in-house pastry chef, Ashley Tardugno. A master pastry chef creates these sweets at the Roundabout Diner. Photo credit: Roundabout Diner. The Roundabout knows that food, alone, however, can’t tell the whole diner story. Interesting Roundabout Diner tidbits: Posternak said that Donald Trump ate at the Roundabout a few years back when he flew into nearby Pease Air Force Base and made news when questioning President Obama’s birth certificate. Former Boston Celtics basketball legend and NBA Hall of Fame inductee Dave Cowens frequents the Roundabout. Former Boston Bruins center Ken Linseman has dined here, too, as well as jazz great Grover Washington, Jr., and 50s rock idol Chubby Checker, according to Posternak. The Roundabout Diner is located at 580 Portsmouth Traffic Circle, Portsmouth. Tel. (603) 431-1440. Web site: http://www.roundaboutdiner.com/. 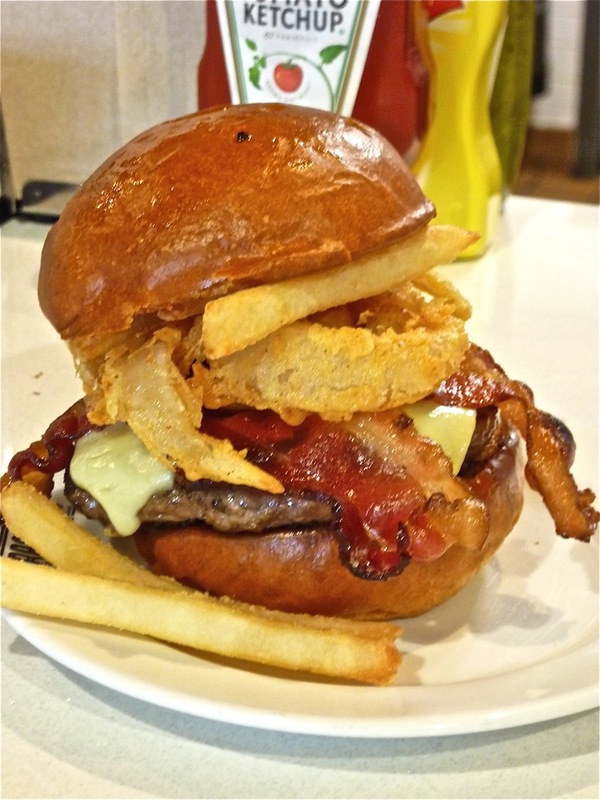 Tilt'n Diner: real diner, real food. Photo credit: Tilt'n Diner with permission from Erica Murphy. 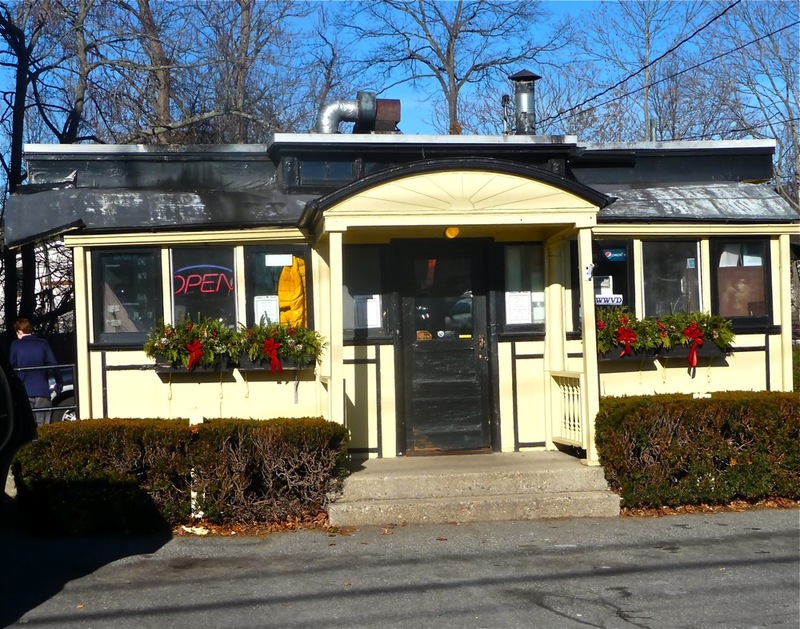 ￼Although the Tilt’n Diner opened in Tilton in June 1992, the diner was built in 1953 by the O’Mahoney Diner Company and known as the Monarch Diner in Waltham. That might come to a surprise to many, as the Tilt’n Diner is so well kept and preserved that it almost seems like a modern diner made to look like an old time diner. It’s really the best of both worlds, as the authentic diner atmosphere shines through while customers can take comfort in a clean, bright, reconstructed and renovated happy space that crowds of 21st century people absolutely love. The overall food quality and a fun atmosphere rank amongst the best, but it’s the consistency of the place that also probably keeps people coming back. I have never had a bad meal or sub-par experience here, and many friends have said the same thing. What could have been a few red flags turns out to be, ultimately, good things. Full disclosure: the Common Man of Family Restaurants is a New Hampshire-based business that owns a chain of restaurants. Normally the words “Chain” and “Diner” do not mix well, but that’s not the case here. With no vested interest in saying this, The Common Man goes to great lengths to offer some fabulous restaurants throughout New Hampshire. The Common Man restaurants have their own identity, and thankfully bereft of any chain restaurants elements. They are to be commended for corporate integrity and the Tilt’n Diner, to me, remains at the apex of the list. Second, the Tilt’n Diner is located near the Tanger Outlet Center. Honestly, how many great restaurants are located near a shopping outlet? Don’t most shopping outlets have chain restaurants in and around the businesses? The Tilt’n Diner certainly stands out as a rare, fantastic eating place near a shopping outlet. The Diner is also a great stop, en route to the Lake Winnipesaukee region, the White Mountains of New Hampshire, New Hampshire International Speedway in Loudon, and Vermont. Try the homemade turkey dinner with all the "fixin's" and you'll wonder why you spent twice the amount in some overrated urban restaurant. Sample the tangy and ample macaroni and cheese and you'll understand how phony the market brands are. Taste the seafood chowder and wonder if Rand McNally possibly made a mistake and that the Town of Tilton is actually on the Maine seacoast. Breakfast is also quite popular with hearty servings of pancakes, waffles, omelets and all the usual delicious morning suspects! Other standout dishes include the wonderful homemade meatloaf dinner, a high end restaurant caliber caesar salad, a flavorful and abundant tuna melt and, as a side, perfectly formed french fries. Of course, the frappes, flavored colas, pies, chocolate layer cake, grape-nut custard and hot fudge sundaes are the stuff that make diners so sweet. The Tilt’n Diner also makes a phenomenal Toll House Pie served warm with Common Man-made vanilla ice cream, hot fudge and whipped cream (it does contain walnuts, if you are allergic to this nut). The Tilt'n Diner serves breakfast, lunch and dinner under lots of neon within two dining rooms and the classic diner car-- all set to the background music of the Elvis Presley, the Coasters, Five Satins, Buddy Holly and other 1950s stars. It is one of the "feel good" restaurants of New England, enhanced by a friendly, sometimes wisecracking waitstaff and absolutely marvelous food. 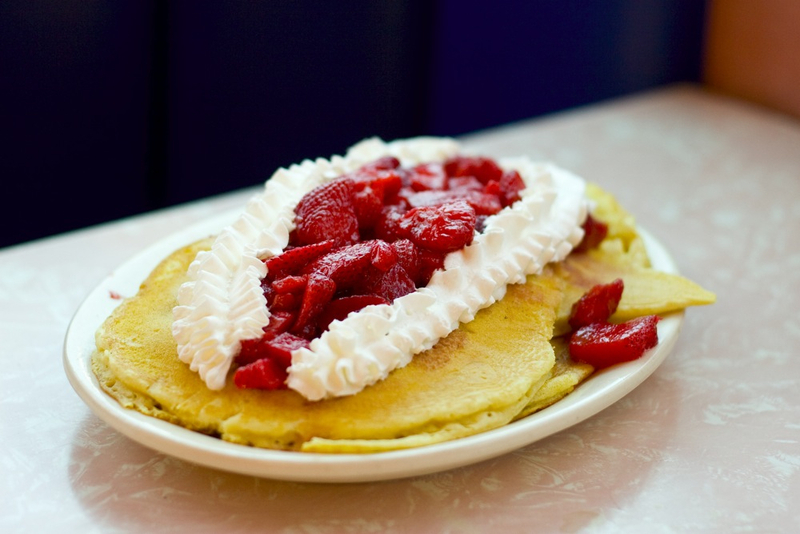 Pancakes with strawberries and whip cream from the Tilt'n Diner. Photo credit: Tilt'n Diner with permission from Erica Murphy. You'll leave the Tilt'n Diner wishing that they would franchise into every community in the United States. They haven't franchised, however, so the next time you're in, say, a 50-mile radius of Tilton, make sure you experience the Tilton Diner. It is indeed a true gem and very family-friendly! Interesting Tilt’n Diner tidbit: The Associated Press once called the Tilt’n Diner a "must stop" on the New Hampshire Presidential Primary campaign trail... The Tilt’n Diner web site states that Parenting NH magazine called the Diner a “family favorite” and “kid’s favorite breakfast place,” while a “Voted best family friendly dining” appeared in New Hampshire Magazine. Tilt’n Diner is located at 61 Laconia Rd., Tilton. Tel. (603) 286-2204. Web site: http://www.thecman.com/restaurants-and-menus/tilt-n-diner.aspx. 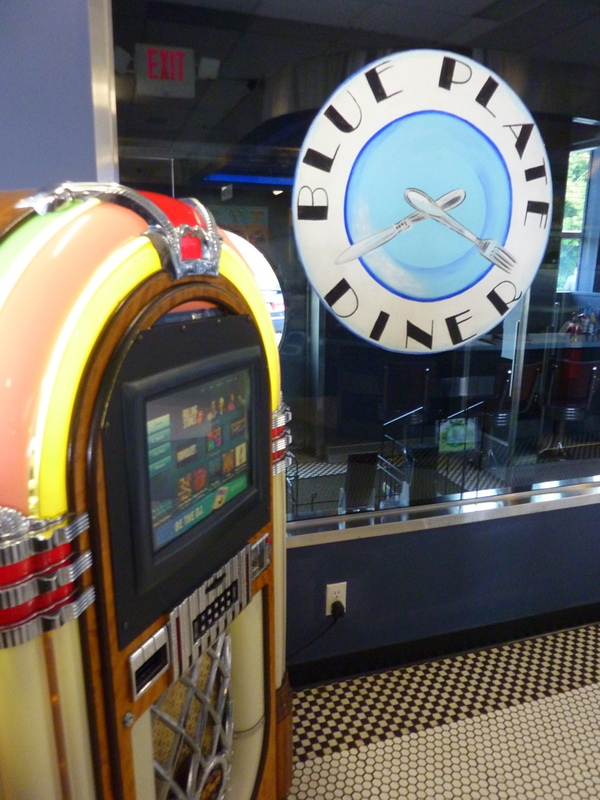 Jukebox and neon sign at the Blue Plate Diner in Middletown. The Blue Plate Diner looks so appealing at night with all its neon. That welcoming diner signal translates, inside, to some fabulous diner fare with a twist -- that is, a place that serves black angus beef, herb-rubbed statler chicken breast, lime marinated fish tacos, curry chicken salad (with mixed greens, strawberries, walnuts, red onion, and curry yogurt sauce), and other dishes that you might not see at a typical diner. They also offer an impressive shakes and malts selection including Mocha Dream (vanilla ice cream blended with chocolate syrup and coffee), Black Forest Shake (chocolate ice cream with sweet raspberry sauce), Peanut Butter & Jelly (vanilla ice cream, creamy peanut butter and grape jelly in liquid form! ), and Mom’s Apple Pie (apples, cinnamon, graham crackers, brown sugar and vanilla ice cream). While on the subject of “sweet,” the Blue Plate Diner also has an impressive desserts case. Bigger in size than most diners, the Blue Plate Diner still manages to feel cozy and comfortable with a heaping serving of small town ambiance with ample counter space, booths, a huge jukebox, and down-to-earth service. The folks here also seems to have a great sense of humor with “sayings” prominently displayed near the ceiling: “Thou Shalt Not Hang Out And Order Nothing But Coffee”... “V1. Thou Shalt Tip Thy Waitress Generously”! The Blue Plate Diner is a great choice when in the Newport area, and often a better choice than some of the restaurants with inflated prices in that famous vacation spot. 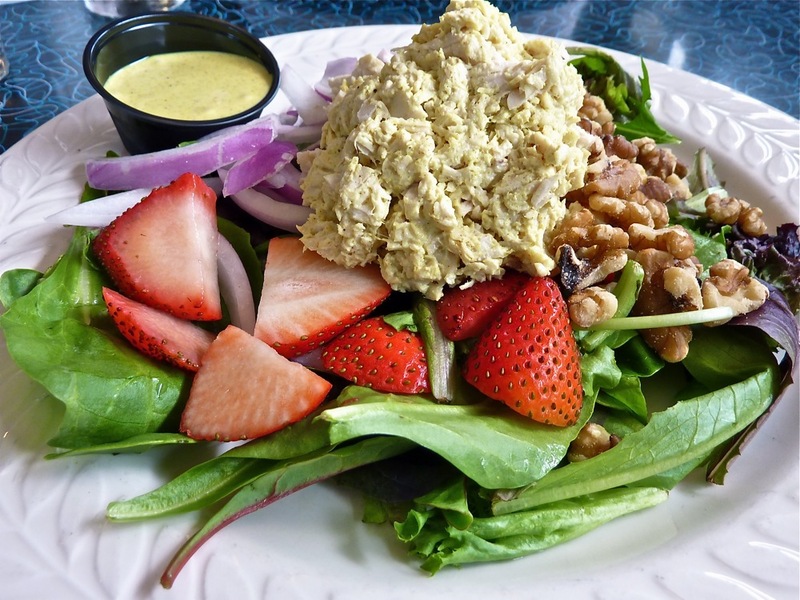 Colorful salad that includes curried chicken salad from the Blue Plate Diner. Blue Plate Diner is located at 665 West Main Rd., Middletown. Tel. (401) 848-9500. Web site: http://www.blueplatedinerri.com/. The huge pink neon sign is, on its own, almost enough to make Cindy's Diner a requisite diner stop, but this appealing Route 6 roadside stop keeps the greatest diner hits of all time coming with its tile floor, red swivel stools at the counter, vinyl red booths and chrome accents. 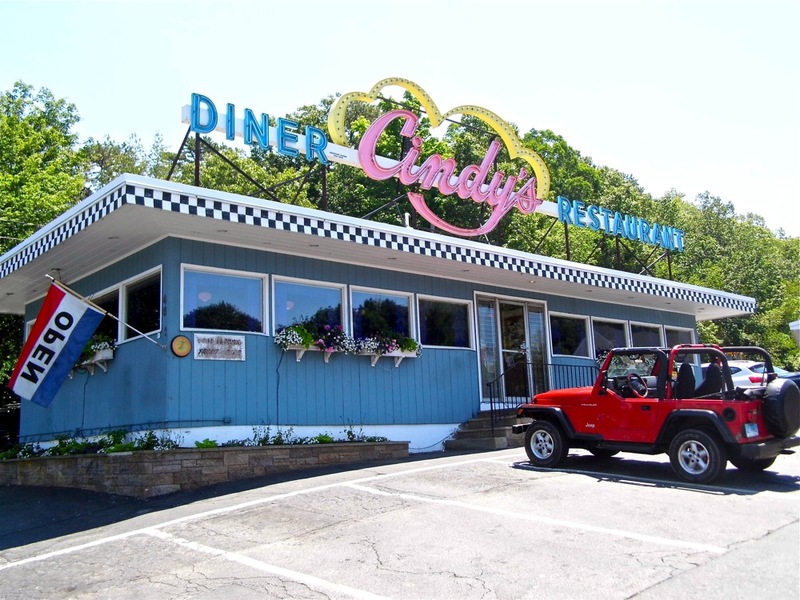 Built in the 1950s and operated by the current owner since 1984, Cindy’s Diner is, without question, a beloved local eatery. While the diner doesn't have the look of a classic diner car on the outside (with the exception of that amazing sign), that's OK, as the ambiance, comfort food selection, huge servings, quick service and rock bottom prices more than make up for any historical shortcomings. Breakfast is a strong suit here, but you can't go wrong, locals say, with lunch or dinner, either. Some diner favorites include fish and chips, burgers (wow, this was so good! ), homemade corned beef hash (better than most), French toast, pancakes, tuna melt, and pot roast. The homemade apple pie is simply fabulous! Tuna melt from Cindy's Diner. Carol also says that many famous local politicians have eaten at Cindy’s Diner, including former Providence Mayor, the late Buddy Cianci. Cindy’s Diner is located at 46 Hartford Ave. (Route 6), North Scituate. Tel. (401) 934-2449. Web site: https://www.facebook.com/CindysDinerRI/. The Modern Diner is actually an old-time diner. This customized and factory built 1941 “streamliner” dining car was actually the first diner in the United States to be included on the National Register of Historic Places in 1978. Once called the Ocean State Diner, they also sued Disney and won after finding out they used the diner’s image, according to Roadside America (http://www.roadsideamerica.com/tip/12379). So, this was never a “Mickey Mouse” operation, as one can plainly see! After having eaten at the Modern Diner, however, I can now understand why the diner’s name is actually relevant. They appeal to working class America, as well as the fickle hipster crowd, with unusual dishes like lobster eggs Benedict, challah stuffed brie French toast, jalapeno bacon grits with eggs and the typical like burgers, club sandwiches, and bacon and eggs. Recently, the Food Network chose the Modern Diner's Custard French toast as the number one meal in its Top 5 Diner Dishes in America. Food Network hosts Geoffrey Zakarian and Sunny Anderson made the announcement on the Top 5 Restaurants show on Monday, Nov. 30, 2015. The Food Network describes how the dish came to be: "...the birthplace of the diner, Modern Diner is operated inside of an old rail car just like the first diners were. Nick Demou and his father opened the place 28 years ago. Since then the restaurant’s top dish has become the Custard French toast, born out of an accident. Fifteen years ago Nick had made too much vanilla pudding, so he thinned it down and served it as a custard on French toast made from thick-cut Texas toast. It also includes a topping of fresh strawberries, blueberries, sliced kiwi, house-candied pecans and raspberry syrup." Custard French toast from the Modern Diner. I saw some Johnson and Wales University culinary school students (could tell from their loud, food-based conversation and school references) seeming to enjoy the food just as much as some construction workers (could also tell from their loud conversation and house construction references). That speaks volumes about the Modern Diner — a place that knows it traditional roots and 21st century appeal. The Modern Diner also has a newer dining area, but I like the old cable dining car best for the authentic diner feel. Also, it should be noted that the Modern Diner only accepts cash, not credit cards. That’s fine; maybe that’s why the prices are so low. The Food Network definitely got it right when speaking high praise for the Custard French toast. This is one of the most flavorful, substantial dishes I have ever tasted at a diner. Phenomenal! The “Jimmie Gimmie” is also a classic favorite: two poached eggs on an English muffin with sliced tomatoes and top with melted cheese and bacon and served with home fries. The chili, homemade beef stew, white chowder (Fridays only), and daily specials (30+ of them posted on the wall!) like meatloaf, liver and onions, boneless chicken dinner, hot dogs and beans and fish and chips are amongst the more popular menu items. The Modern Diner also serves mimosas and Bloody Marys for fans of adult beverages. Expect lines at any time of the day. What a fabulous diner -- certainly right around the top of the “best diners” in New England! Interesting Modern Diner tidbits: The Modern Diner is one of two known surviving Sterling Streamliner diners -- a diner in the shape of a streamlined train called the Sterling Streamliner from 1939 -- still in operation. The other Sterling Streamliner: the Salem Diner in Salem, Massachusetts. 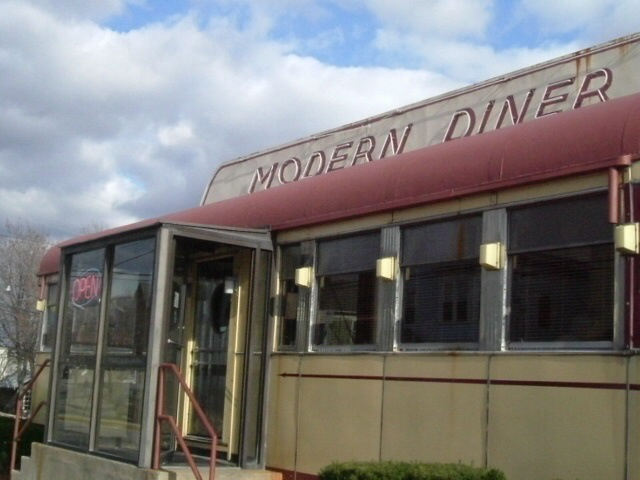 Modern Diner is located at 364 East Ave., Pawtucket. Tel. (401)726-8390. Web site: https://moderndinerri.com/. Lots of chrome and neon at the Patriots Diner in Woonsocket. This neon and chrome beauty located just outside downtown Woonsocket gets high marks from us for a dedication to home-cooked meals, a big menu that has something for everyone, huge portions, and convenience for being open 24/7. Whether breakfast platters, three egg omelets, French toast, pancakes, waffles, soups, burgers, triple decker club sandwiches, Greek and Italian specialties, steak and chicken dinners, fried seafood platters or gigantic desserts, it's all good. No, make that great! We have never had a bad meal here and almost always, an excellent one. My favorite dishes include pastichio (baked macaroni and ground beef, topped with a creamy cheese sauce), the beef gyros, spinach pie, the Monte Christo, baked meatloaf dinner, triple decker sandwiches, fish and chips, Greek salad with a heaping amount of feta cheese, and the New Englander -- apple/cinnamon pancakes topped with apples, cinnamon and whipped cream. Some other popular dishes within that truly extensive menu: fried whole clams, fried clam strips, fisherman’s platter, broiled salmon, chicken parm, spaghetti and meatballs, sirloin tips platter, baked meatloaf, sliced open hot turkey sandwich, New England clam chowder, Stuffed French toast (raspberry or strawberry jam and cream cheese, topped with nuts), and the N.Y. sirloin with three eggs, sliced tomato, home fries and toast. 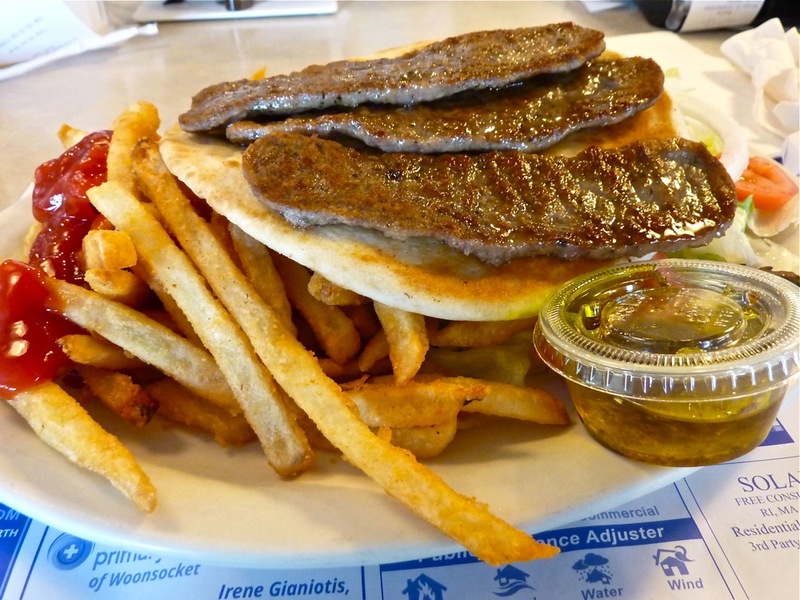 Gyro plate from the Patriots Diner in Woonsocket. Like all great diners, the service is down-to-earth and dependable. It’s not just the older waitresses -- the younger generation of hired help is sharp, attentive and personable. Let’s face it, you don’t always see that in the service sector. Additionally, the cooks, while intense and focused in the kitchen, occasionally peak their heads out to acknowledge the customers. That’s really a nice touch. 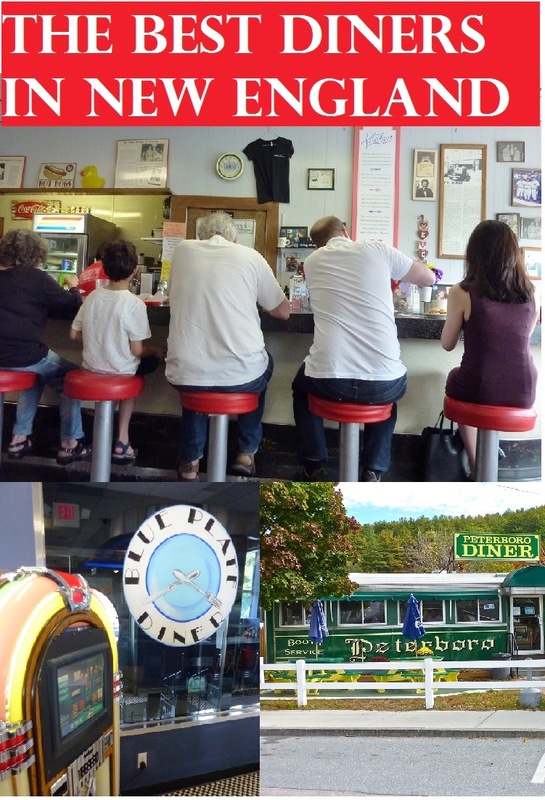 Next to the Maine Diner in Wells, Maine, the aforementioned Modern Diner in Pawtucket, the Red Arrow in Manchester, N.H., and a few others that come and go in the forefront of my mind from time to time, the Patriots Diner is amongst my top five favorite diners in New England. The reasoning is simple: it’s all about the food here, the real diner atmosphere and traditional diner waitresses making you feel at home, all making it clear that you are in a diner with abundant spirit and substance. 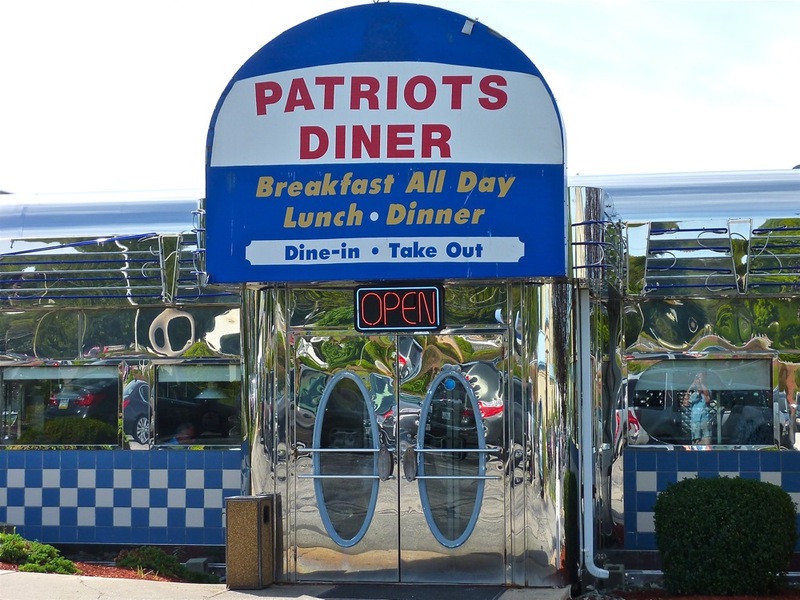 Patriots Diner is located at 65 Founders Dr. Woonsocket. Tel. (401)765-6900. Web site: http://www.patriotsdiner.com/index.php. Nice airplane theme at the Seaplane Diner in Providence. Located next to a former seaplane port, this O'Mahoney-style vintage silver diner from either the 1940s or 50s (conflicting info here) was once located in nearby Woonsocket (everything in tiny Rhode Island is nearby!) before moving in 1973 to its Providence location. Its “Omelette French Toast” was once featured on the Food Network's Rachel Ray Show! Open for breakfast, lunch and, at this writing, dinner, the Seaplane Diner delivers pretty much everything you'd expect in a classic diner including Salisbury steak, pastrami and swiss on rye, stuffed French toast, waffles and pancakes, burgers and some Greek touches like the lamb gyro. The Oreo pancakes is a great idea. We love the large model airplane perched above the exterior sign! Seaplane Diner is located at 307 Allens Ave., Providence. Tel. (401) 941-9547. A true Bennington attraction: the Blue Benn Diner. Photo credit: Marylou Monroe at the Blue Benn Diner. 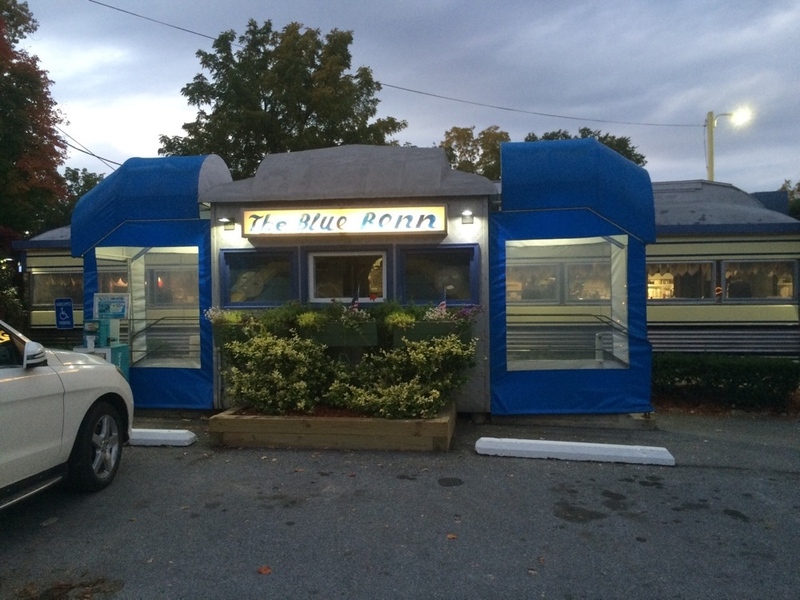 The Blue Benn Diner often appears in “Best of New England” diner articles, or in general conversations. That’s no surprise, given the Blue Benn looks like a diner, smells like a diner in the most wonderful ways, and feels like a diner. You’d be surprised how many diners in New England have veered away from the traditional criteria that made them great in the first place. The Blue Benn is not like that, thank goodness! With most classic diner meals coming in at under $10, a friendly staff, local conversations, counter and stools, booths, lots of stainless steel, a barreled roof, jukeboxes within a historic dining railcar going back to the 1940s, the Blue Benn really hits upon every element that one could ever want in an old school diner. Pancakes, French toast, omelets, burgers, pot roast, liver and onions, fish and chips, fried clam strips, meatloaf, foot long hot dogs, roast turkey homemade pie are just a few of the familiar diner menu items to satiate your comfort food soul, but there’s also a healthier element. The Blue Benn has a longstanding, visionary reputation of serving up meat-free dishes since the 1970s. Veggie lasagna, chili and meatloaf, shiitake mushroom and broccoli stir fry and salads suggest a healthier, 21st century side to this retro diner. The Blue Benn also features several Mexican and Middle Eastern items. Another reason to love the Blue Benn Diner is that it’s located in Bennington. What a pretty town, surely one of Vermont’s finest! How nice to come across diners like the Blue Benn while traveling the scenic Vermont country roads -- ideal for any “roadtripper” looking for a great, cash-only home-cooked meal! Interesting Blue Benn Diner tidbit: The Huffington Post published a Jan. 28, 2015, article, The 21 Best Diners in America (by Kevin Alexander and Liz Childers with the Blue Benn included in that list. (http://www.huffingtonpost.com/thrillist/the-21-best-diners-in-ame_b_6563290.html). The Blue Benn Diner is located at 314 North St. (Route 7), Bennington. Tel. 802-442-5140. 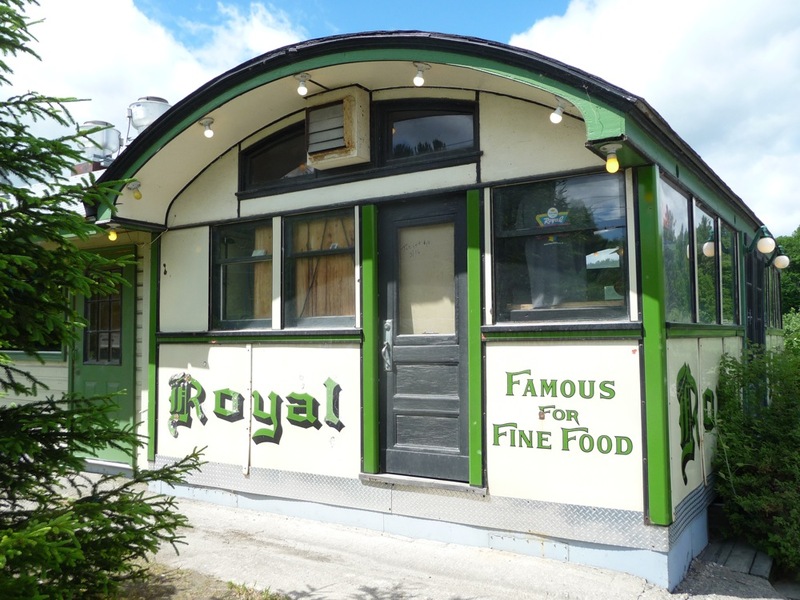 The Chelsea Royal Diner is housed in a 1938 railroad car diner and prioritizes locally sourced ingredients -- that's a good thing in Vermont with all its farms, and significant cheese and maple industries. The pricing is fair, service quick, food yummy and selections plentiful for breakfast, lunch and dinner. Daily blue plate specials include pan fried chicken, turkey croquettes, grass fed sirloin steak, chicken fried pork, Yankee pot roast, roast leg of lamb and fried clam strips. In addition to diner fare, the Chelsea Royal Diner offers pizza, Mexican cuisine and homemade ice cream. 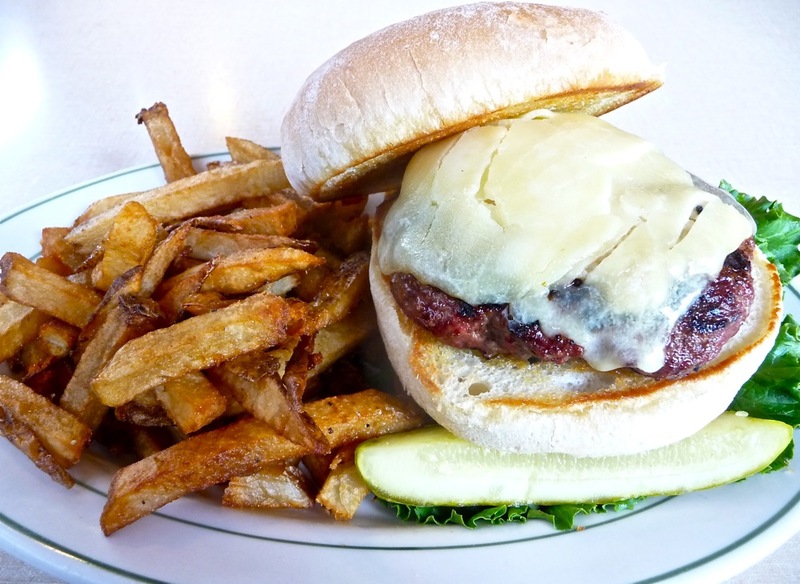 According to its web site, the Chelsea Royal Diner is part of the Vermont Fresh Network, "Serving all grass-fed beef, our own back-yard eggs, veggies from our garden, local produce from neighboring farms." I recently had a phenomenal grass-fed burger with cheese (from the nearby Grafton Village Cheese Company), horseradish, onion and a fresh tomato. Grass-fed burger from Chelsea Royal Diner. While the food is tremendous and often a notch above standard diner fare due to its commitment to resourcing locally, what I equally like about the Chelsea Royal Diner is that the staff seems like they are all good friends with each other. In between serving customers, you can often hear waitresses conversing as if they were best friends. I got a better vibe from the waitresses here than some of the customers -- that is, a few out-of-towners that seemed uptight and only concerned with getting to their “destination” (the local customers, though, are salt of the earth). If some people only knew that the journey can be as exciting as the destination --case in point, places like the Chelsea Royal Diner! Interesting Chelsea Royal diner tidbit: local artist Janet Picard's art work is displayed throughout the diner. Her studio is located in the barn behind the Royal Diner! Chelsea Royal Diner is located at 487 Marlboro Rd., Brattleboro. Tel. (802) 254-8399. Web site: www.chelsearoyaldiner.com/. Miss Bellows Falls Diner. Photo credit: Brandi Davis. What a trip back in time -- not only the old 1930s rail car ambiance but also the locals talking it up, welcoming service, original woodwork, and the general feeling of taking one step from the 21st century sidewalk into a warm slice of nostalgia in the form of a diner. The food is solid, especially the great value for the money at breakfast -- huge portions and very tasty! While the food is fine -- pancakes (with real maple syrup upon request), French toast, eggs, burgers, the usual diner fare -- the Miss Bellows Falls Diner might be one of the few diners listed in this book where the atmosphere might have a slight edge over the food as the most impressive part of the diner. That is, by no means, a slight on the food. It’s just that the totally unpretentious, authentic look of a diner in the imperfect but incredibly friendly Bellows Falls community resonated most with me. The 16X30 diner size is small, but certainly comes with an eternally big heart! With a few exceptions, the original diner remains completely intact and you can almost feel the history with every step, perspective and even aroma -- and we are not talking about the food on the latter. 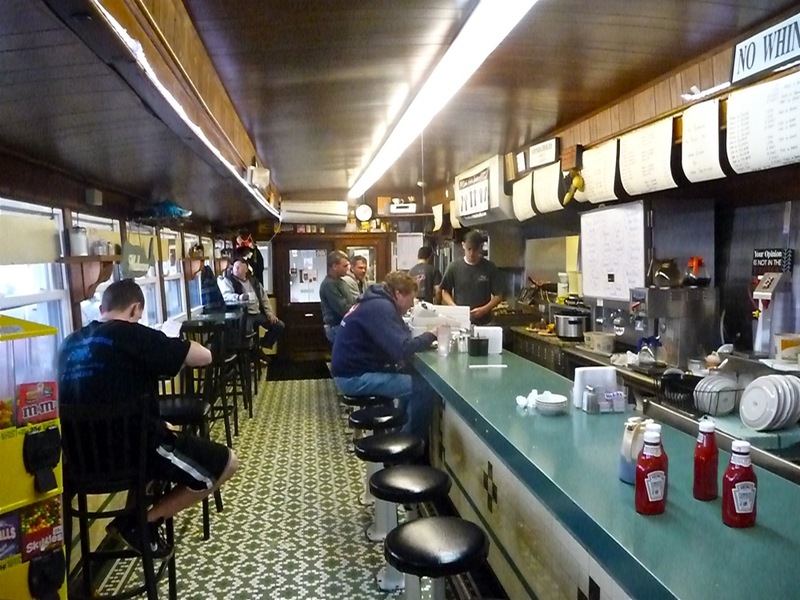 Let me preface this by saying the Miss Bellows Falls Diner is very clean, but then go on to say that there is a certain wonderful smell in old buildings, homes and diners that evokes a more innocent and simple age -- but cannot really be described fully, but only experienced. While the current staff works hard and so admirably in every aspect to make this Vermont diner a special place, it’s almost like the friendly ghosts of customers and staff have kept the spirit of the Miss Bellows Diner alive. Being in the presence of history sometimes feels that way. The unique barrel roof, polished aluminum, original woodwork, the porcelain enameled metal sheathing yielding a polychrome color scheme, the checkerboard-styled floor tile, and an overall Worcester Dining Car look that draws from 19th century railroad passenger cars certainly helps the atmospheric cause. It would be safe to say that the Miss Bellows Diner is in the minority of virtually unaltered diners in this part of the country -- at least from what I have seen. That, alone is worth the price of visiting although you, again, will certainly get an excellent, basic meal here. Interesting Miss Bellows Falls Diner tidbit: According to the Connecticut River Joint Commissions web site (http://www.crjc.org/heritage/V06-23.htm), the Miss Bellows Falls Diner stands as the only completely intact example in Vermont of the barrel-roofed Worcester Lunch Car produced by the Worcester Lunch Car Company. 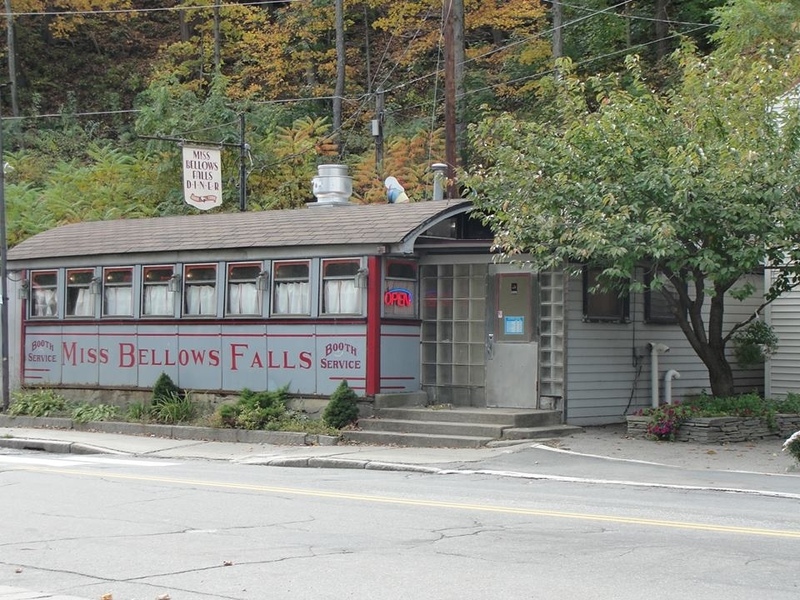 Miss Bellows Falls Diner is located at 90 Rockingham St., Bellows Falls. Tel. (802) 463-3700. At the counter in the Miss Lyndonville Diner, Lyndonville. From the name to the dining experience, there is kind of a sweet feeling -- so greatly missing in restaurants today -- when visiting the Miss Lyndonville Diner. Even if the Miss Lyndonville Diner didn't have diner decor and ambiance, the place would still feel like a trip back in time. I think that the Miss Lyndonville Diner's greatness resides in its authenticity -- not diner authenticity, necessarily, but the kind of down-to-earth feeling that you get from a close-knit family outing. It's like you've arrived in someone's living room, while waiting for that piping hot homemade food to be lovingly served. Now I can't say that it is like this all the time at the Miss Lyndonville Diner, but it was certainly the case the times we dined there. Everything we've had at the Miss Lyndonville Diner is terrific, but I recommend going with breakfast at the counter or booths -- especially the pancakes, muffins, and anything you can put real Vermont maple syrup on! The roast turkey dinner and maple cream pie for lunch or dinner are out-of-this-world. I love looking at the Miss Lyndonville Diner menu almost much as eating the food. It is one of those menus that builds up the appetite with its nice drawing of the Diner, handwritten-style “Miss Lyndonville” font, food photos and appetizing names and descriptions like “Vermont Breakfast Sampler” (two buttermilk pancakes, two strips of bacon, two sausage links, two eggs). 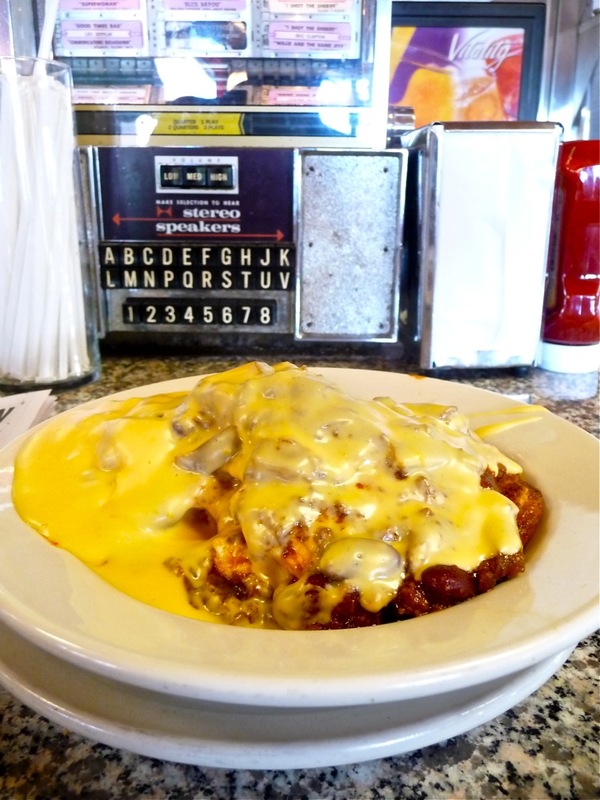 Or, how about the “Country Homefry Casserole” (home fries, sausage, onion and cheddar cheese topped with two eggs. and served with homemade toast). Then there’s the “Maple Cured Ham Steak” with raisin sauce, “The Vermonter” (a “grilled patty, served open face on a toasted roll with plenty of steak fries all smothered with beef gravy, and 3 lettuce blend with fresh cucumber, tomato and red potato slices,)” and the “Fresh Strawberry and Blueberry Pie.” It’s the kind of menu that is not only extensive, but extends a kind of feeling back to childhood when, on vacation, we loved looking at long, descriptive roadside restaurant menus and getting a whiff of that homemade food from the kitchen. I know, those are simple thoughts, but that’s the point: you should never forget the little things because someday they become the big things that provide sustenance in the memory sector of our hearts. The Miss Lyondonvile Diner feels like the ideal place to stop in after a day in the fresh country air, a cool Vermont morning with the fog lifting, skiing at Burke Mountain (for the record, I am not a skier but love the season! ), foliage drives, or any time of the year in the beautiful Northeast Kingdom. There’s just something so nice about coming in from the rural environs in the morning and into a diner with the smell of hot coffee, the aroma of fresh muffins coming out right out of the stove, the talk of the town going on at the counter, and generally seeing local Vermonters awaken as a close-knit community. The Miss Lyndonvile Diner always seems busy, at least when I have visited through the years, and that is a real testimony to the Diner. 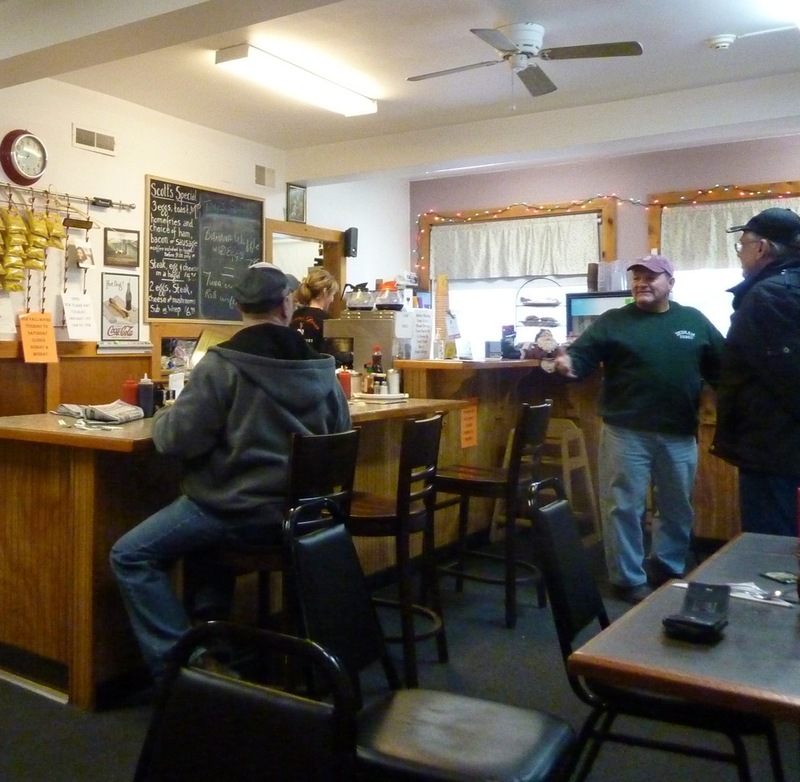 There are other quality choices in the region for breakfast, lunch and dinner, but the Miss Lyndonville Diner seems to have that magic touch that not only brings in the locals, but also vacationers like us. The food and atmosphere are certainly factors in this appeal, but there’s this almost unexplainable “X factor” that can only be experienced by being there. If in the area more and relying on dining out at local restaurants for breakfast, lunch and dinner, I wouldn’t mind coming back here twice in the same day. 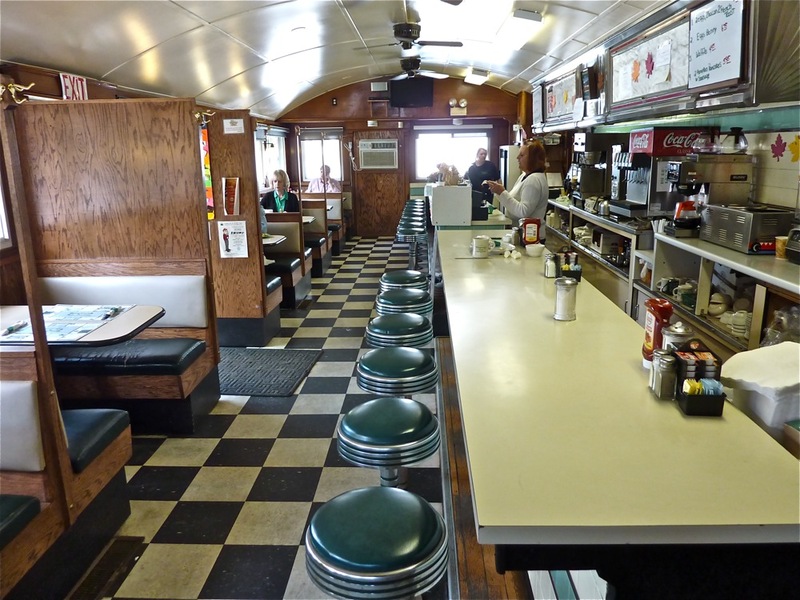 Originally starting as a Sterling diner car in 1951 at the current location, the Miss Lyndonville Diner, unfortunately, suffered a fire in 1979 when the establishment was soon gutted but quickly renovated. Thank goodness for the reopening -- this is one of the most welcoming diners in New England! Miss Lyndonville Diner is located at 686 Broad St., Lyndonville. Tel. (802) 626-9890. A charming, small town diner in Putney. On a low-budget day trip to Vermont a few years back, things definitely started off on the right track with a stop at the Putney Diner where I feasted on a huge roast turkey sandwich with homemade stuffing and cheddar cheese for just under $9. The turkey was freshly carved — none of this slimy, fake turkey (or real turkey that somehow doesn’t taste real) -- no surprise, as the Putney Diner carves its own turkey every day. The turkey sandwich came with some delicious French fries and cole slaw. Other popular items include reubens, burgers, homemade cinnamon buns, pies and muffins, and “fluffy” pancakes (served with real Vermont maple syrup) On my last visit, the staff and locals at the Putney Diner were mighty friendly, kind of unintentionally offering a “Welcome to Vermont” greeting better than any tourism board could ever and suggestions on what to see and do in the area without a trace of vested marketing and tourism leanings (maybe because they are not in that business!). 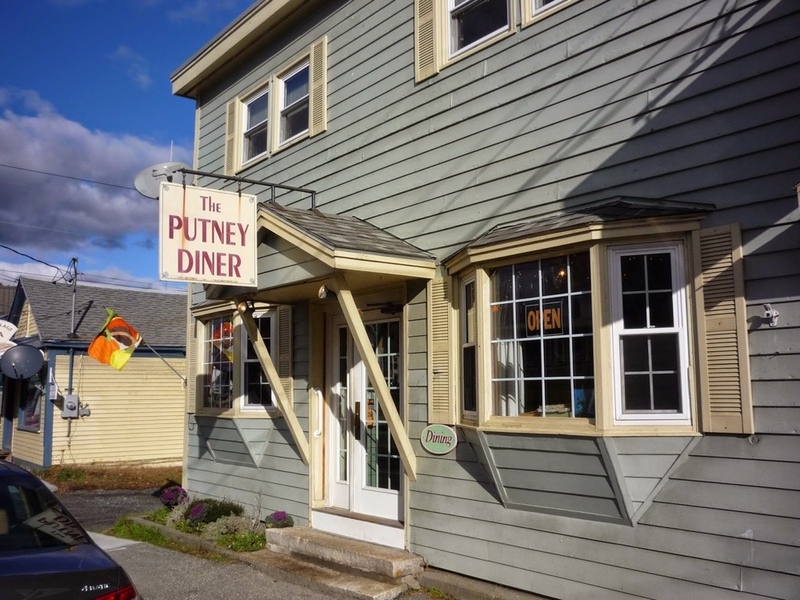 Although the Putney Diner borders on being more of a restaurant than a diner, the counter section and small town vibe gives this local favorite enough "oomph" to still be considered a diner. I was incredibly impressed and would make this a "go-to" place for breakfast and dinner, too. Every town would be so lucky to have a Putney Diner where fresh food is the focus. Putney Diner is located at 128 Main St., Putney. Tel. (802) 387-5433. Web site: https://www.facebook.com/theputneydiner/. Eric Hurwitz writes straight from the heart on New England travel for his readers on VisitingNewEngland.com. A lifelong New Englander, Hurwitz has covered many aspects of New England travel since 2001 but with a particular interest in sharing hidden travel destinations with his audience. Hurwitz holds a bachelors degree in journalism from Suffolk University in Boston, Massachusetts, and spent 20-plus years as a reporter, assistant editor, and public affairs specialist in the public and private sectors before starting his work of love, VisitingNewEngland.com. 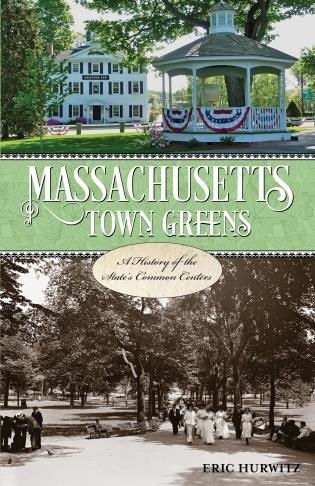 Eric is also the author of Massachusetts Town Greens (Globe Pequot, May 2016), a book that explores the history of town commons in Massachusetts, as well as providing a guide to current events. This one-of-a-kind book serves as a great traveling companion for United States travel and history lovers, especially for those that enjoy discovering New England travel. Consider this book your word-of-mouth resource for local town greens! You can purchase the book at https://rowman.com/ISBN/9781493019274/Massachusetts-Town-Greens-A-History-of-the-States-Common-Centers. Explore Massachusetts travel! Read the Massachusetts Town Greens book -- Discover New England's first travel attractions: town commons. Includes chapters on 70 towns commons in Massachusetts, including the Boston Common, Lexington Battle Green and Monument Square (Concord)! A visit to the historic Bull Run Restaurant in Shirley, Mass.